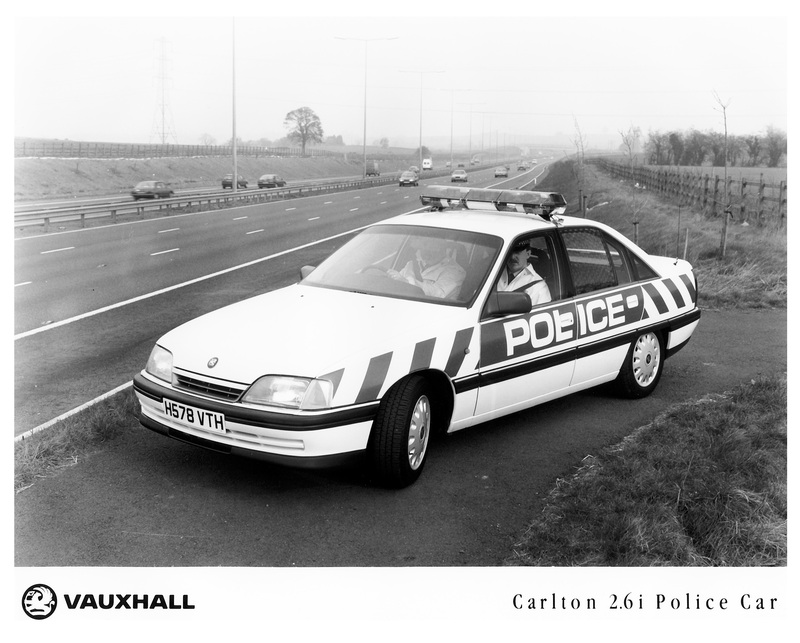 The Vauxhall Carlton Mk2 was a bigger success than the Company had originally anticipated considering it was really a facelift of the Carlton MK1 launched in October 1978. 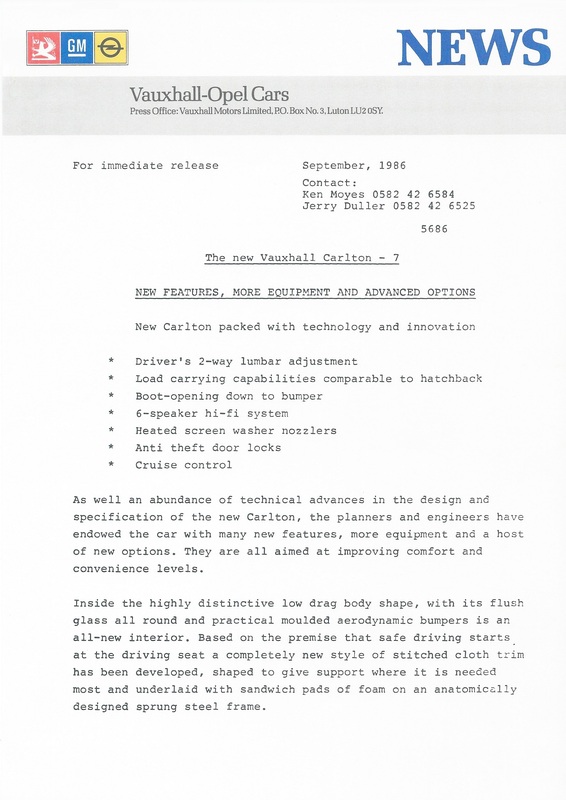 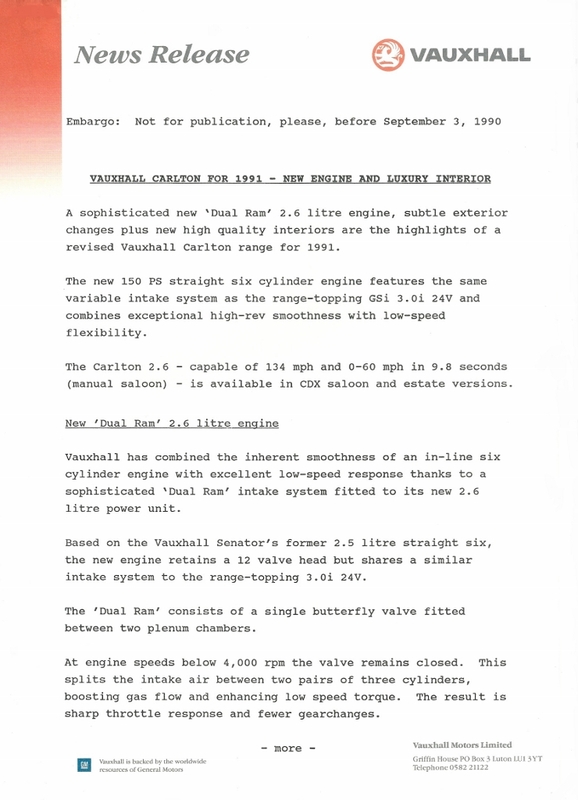 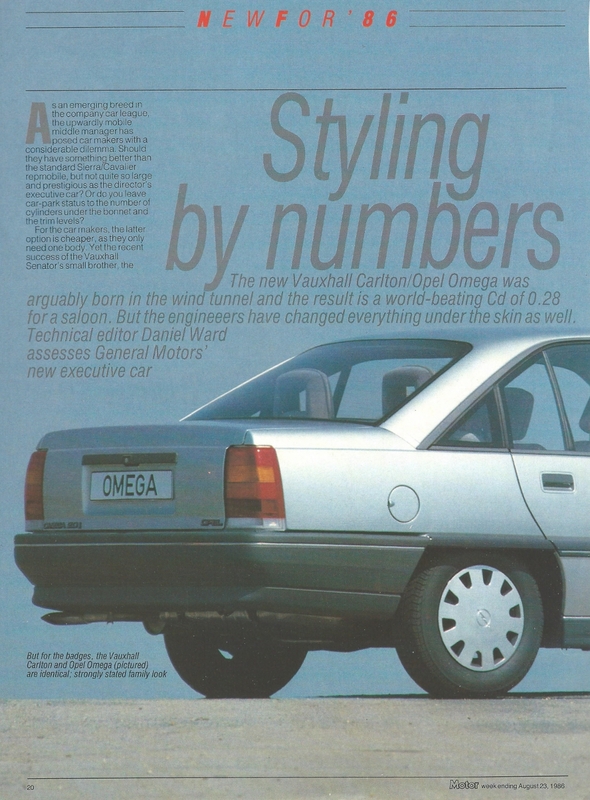 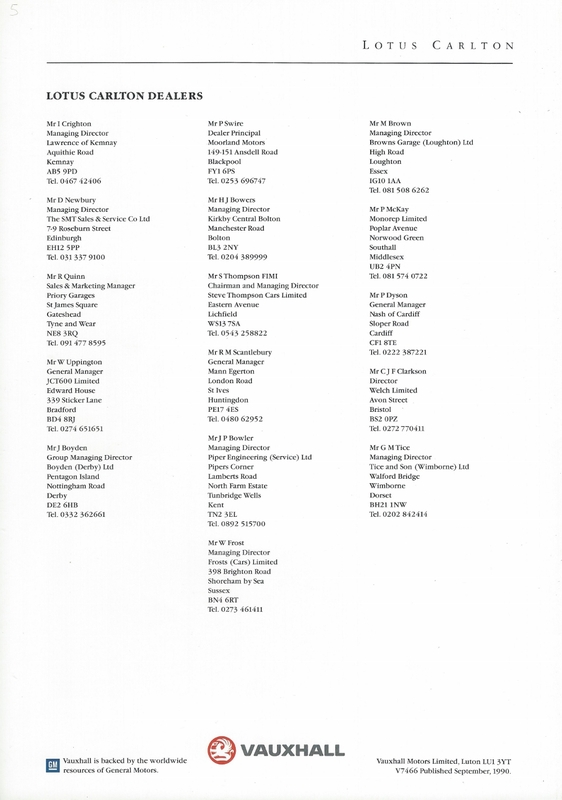 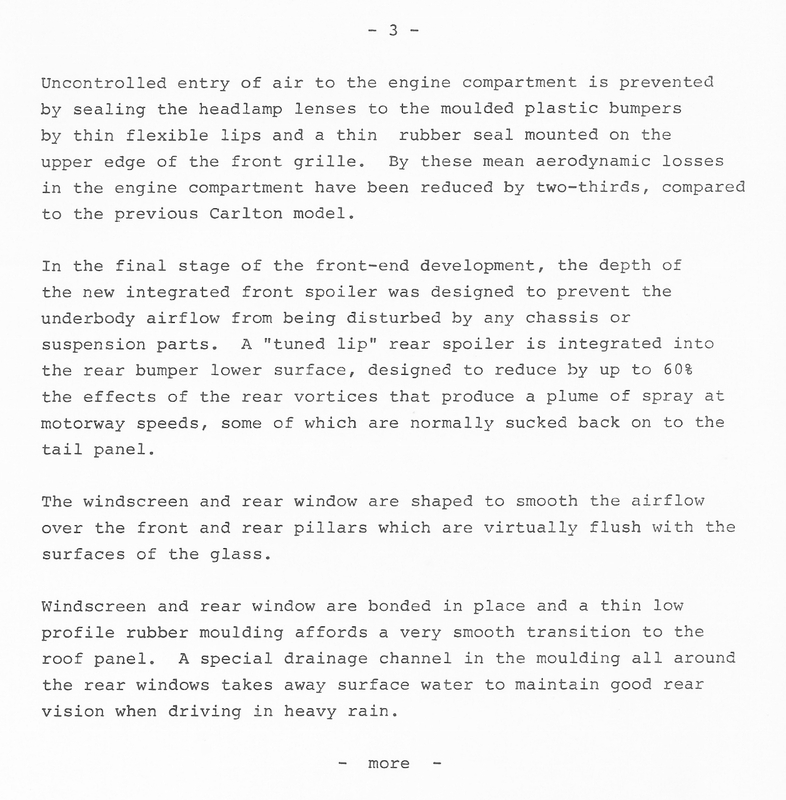 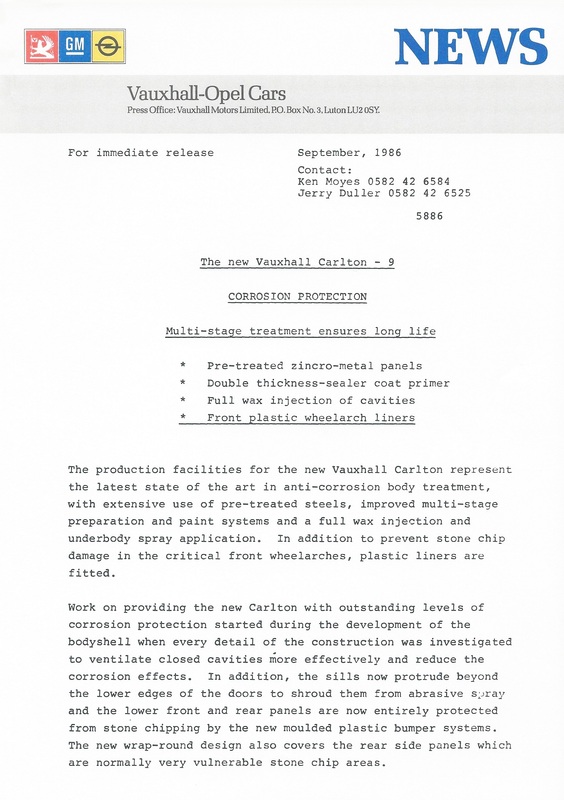 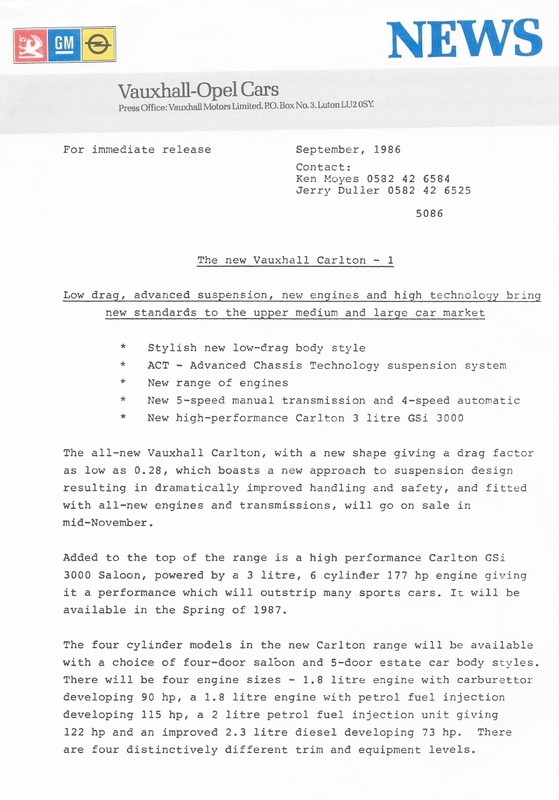 However, Vauxhall were well aware that a completely new car was required as a replacement in order to retain their sales success - particularly in the ultra-competitive UK fleet market. 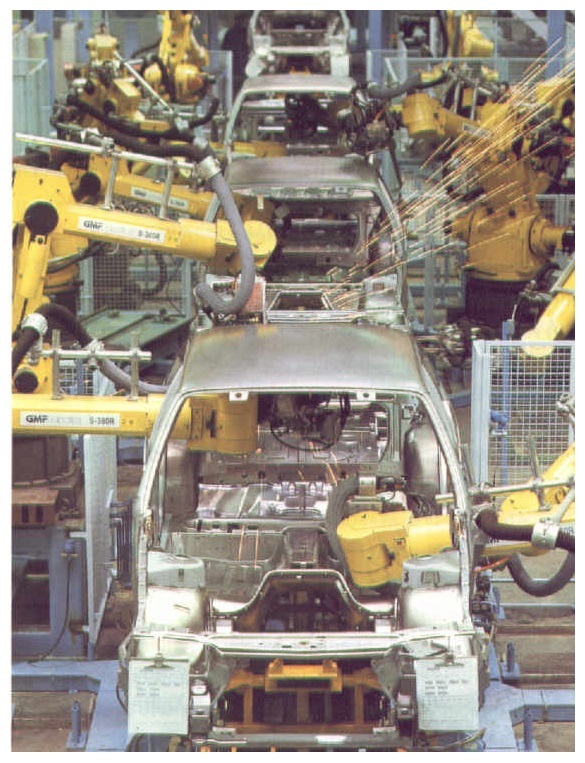 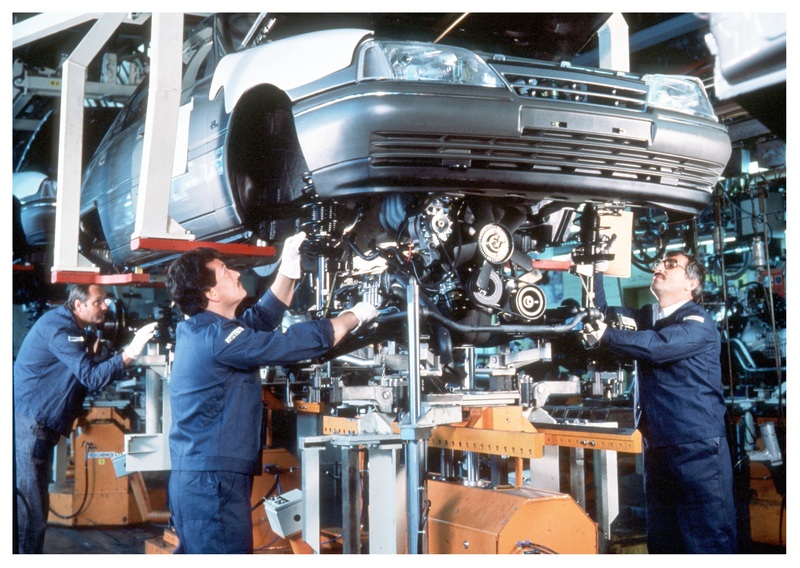 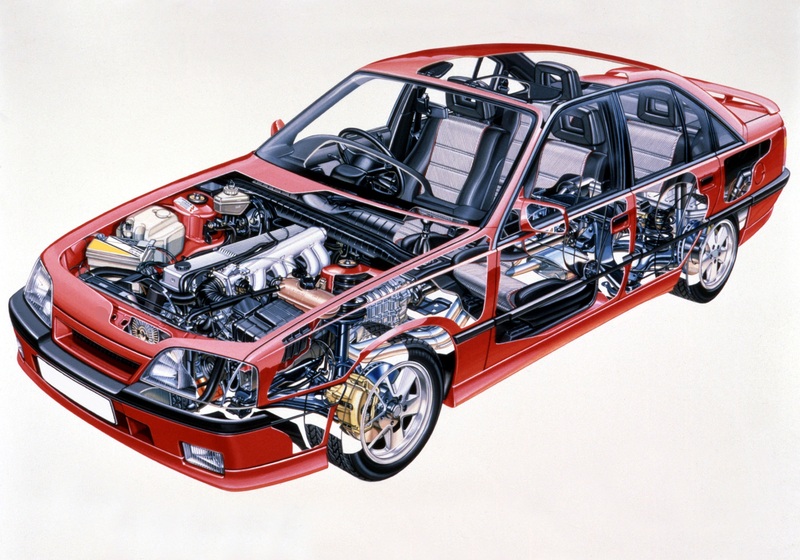 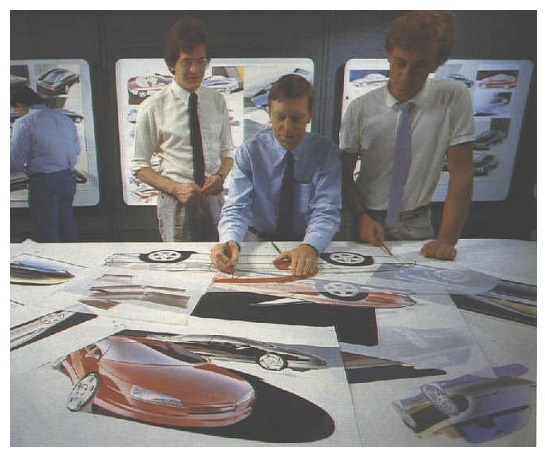 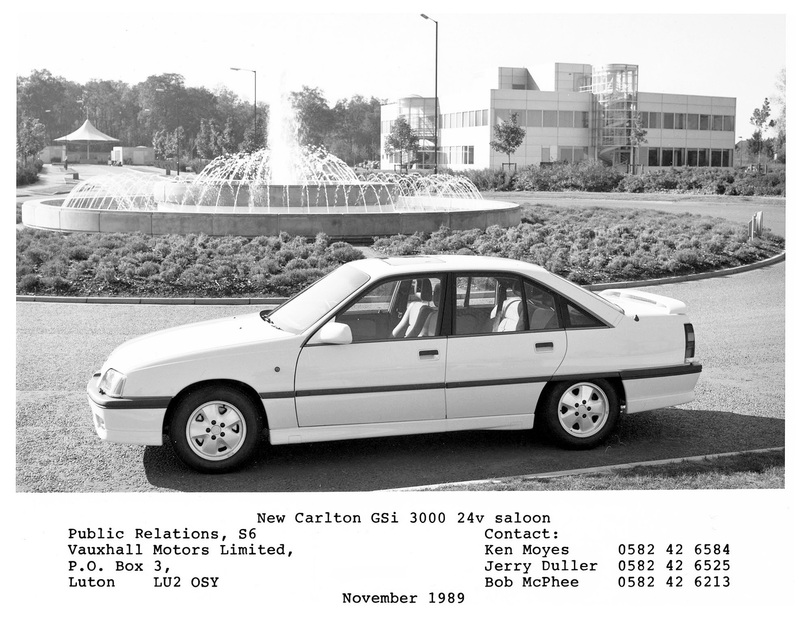 Significant changes in the structure of GM Europe’s Design & Engineering had taken place since 1979 and all Vauxhall / Opel Design was now centred in Russelsheim in Germany, this was initially under the American Head of Design Gordon Brown. 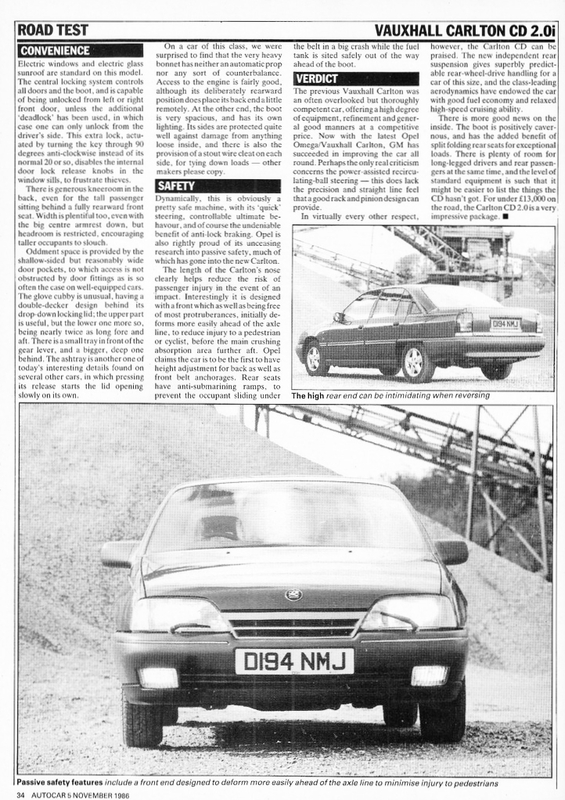 Tragically he was killed in a climbing accident in 1983 and was replaced by Head of Vauxhall / Bedford Design Wayne Cherry just 18 months after work on the new Carlton (and Opel Omega A) had started. 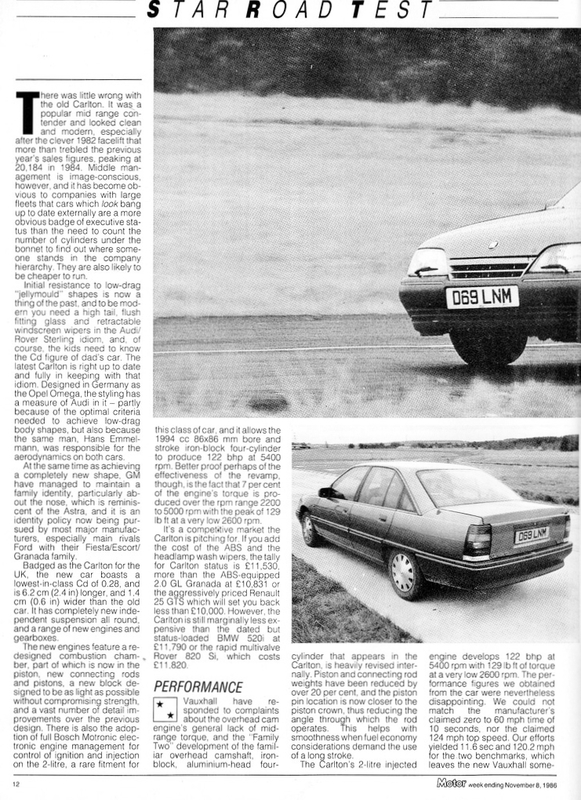 As a result the new car had plenty of familiar Vauxhall styling cues and, as with everything Cherry was involved in, superb aerodynamics. 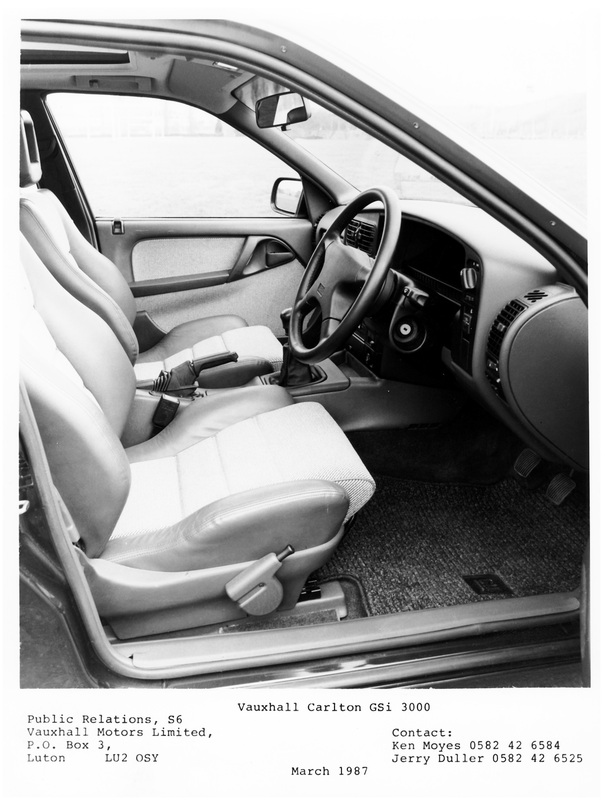 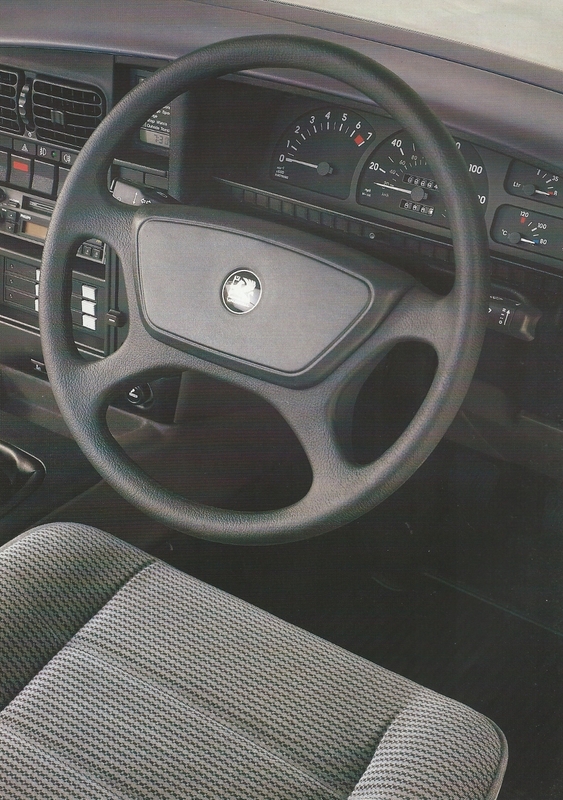 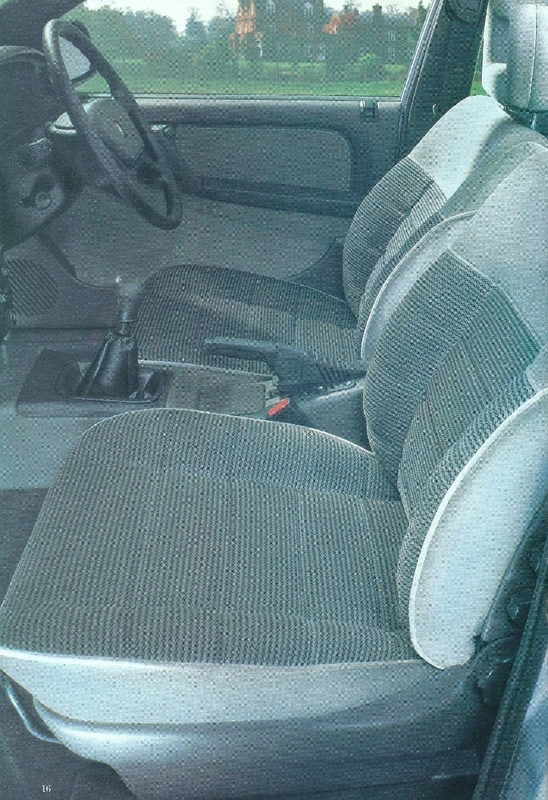 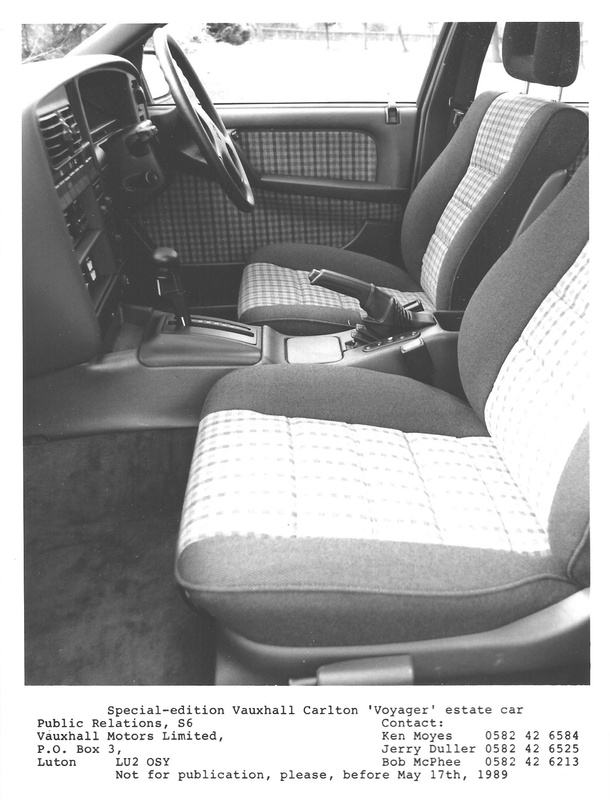 Cherry’s influence was also seen in the improved interiors which had always been a weak point of previous Opel based designs. 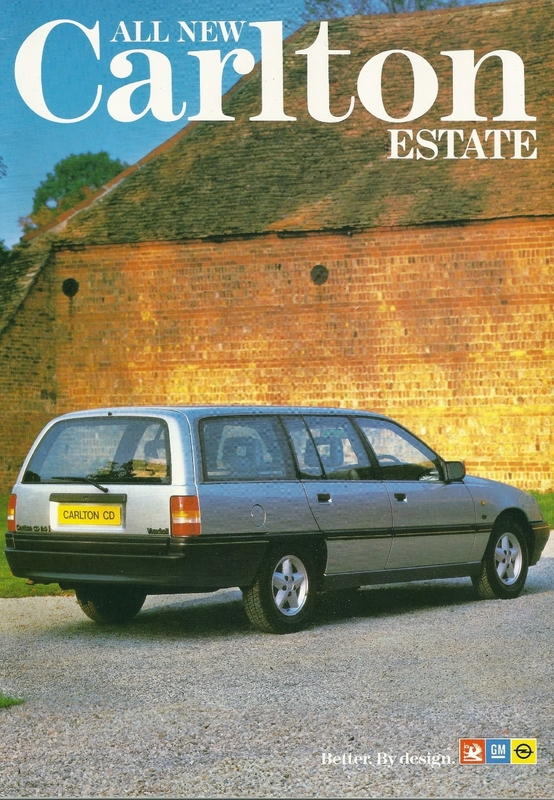 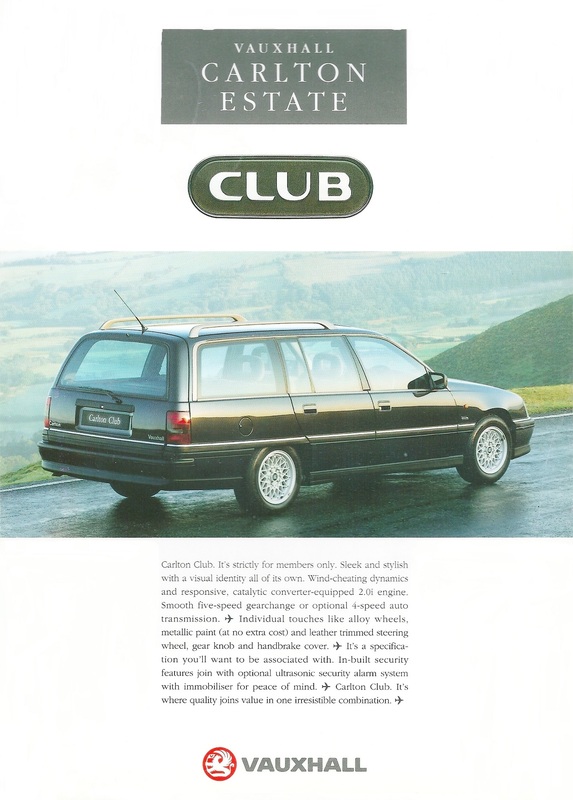 The Carlton MK3 was voted Car of the Year 1987.
was envisaged as a classic style, comfortable, economical, aerodynamic and spacious 4 door saloon and 5 door Estate with rear-wheel drive. 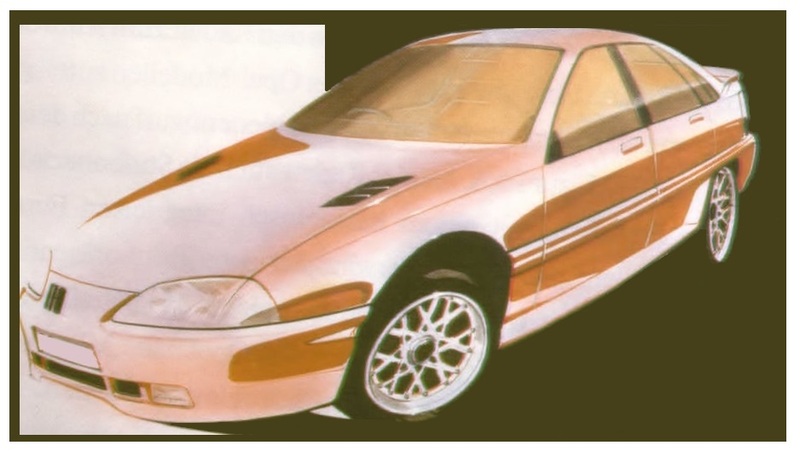 The hatchback path Ford stylists took with the Scorpio was rejected by GM designers. 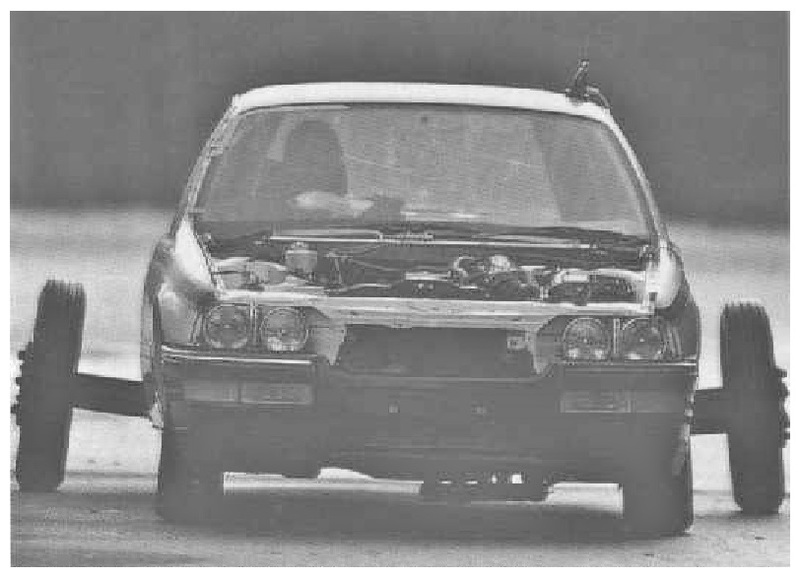 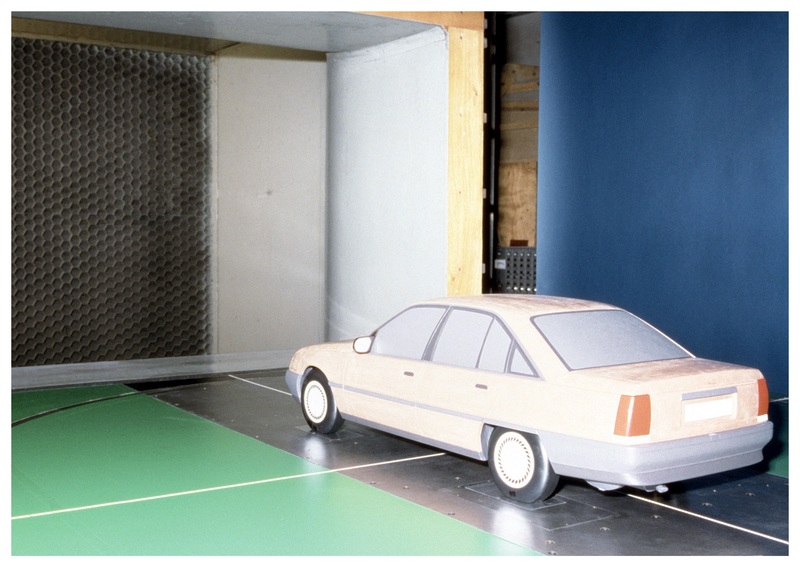 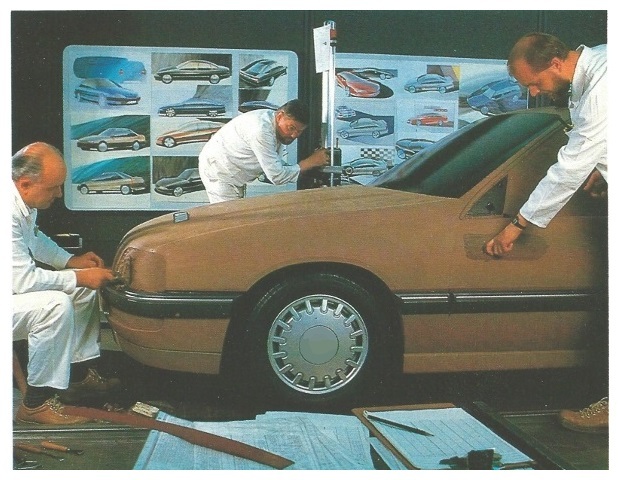 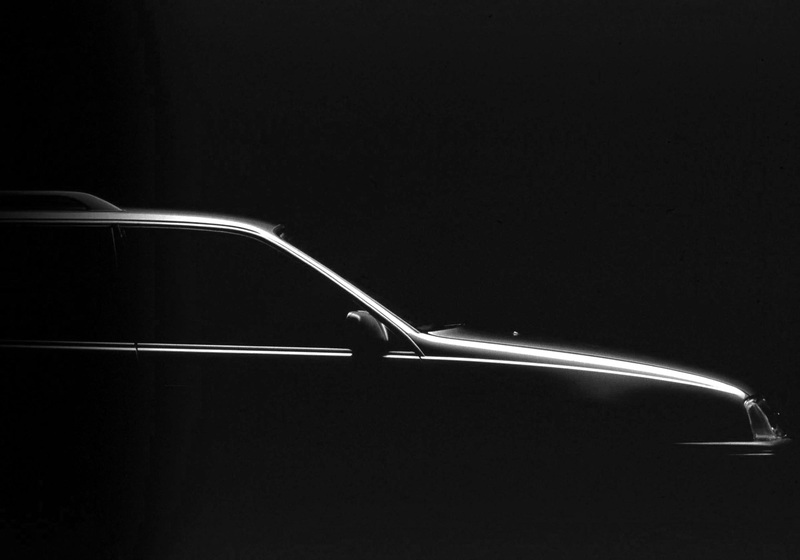 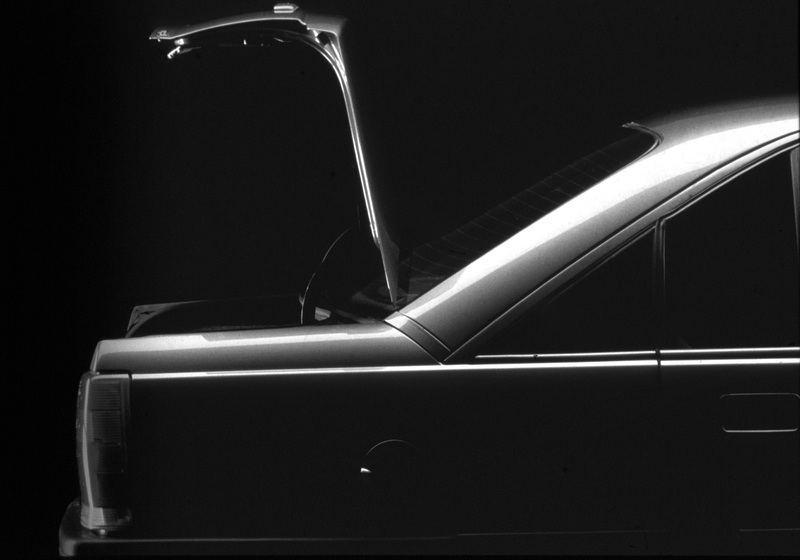 Nearly 1,400 hours were spent in wind tunnel testing, including TU Stuttgart and at Pininfarina in Italy, using both 1:5 scale models as well as full sized mock-ups and resulted in a class leading CD 0.28 for the Saloon and CD 0.32 for the Estate version. 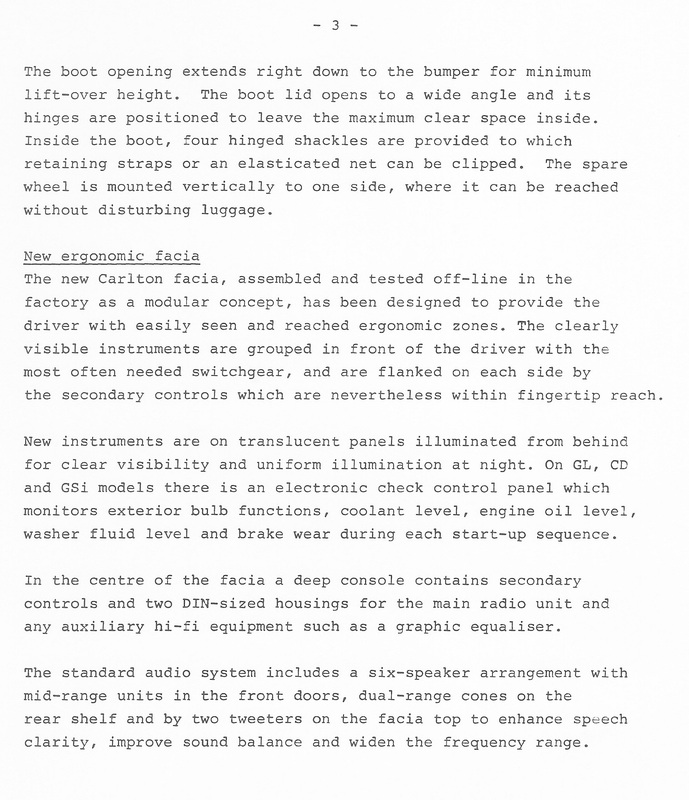 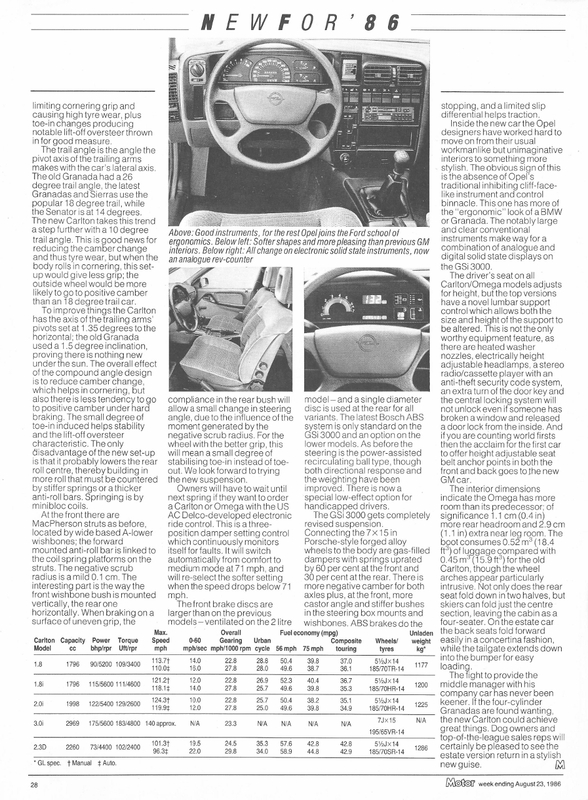 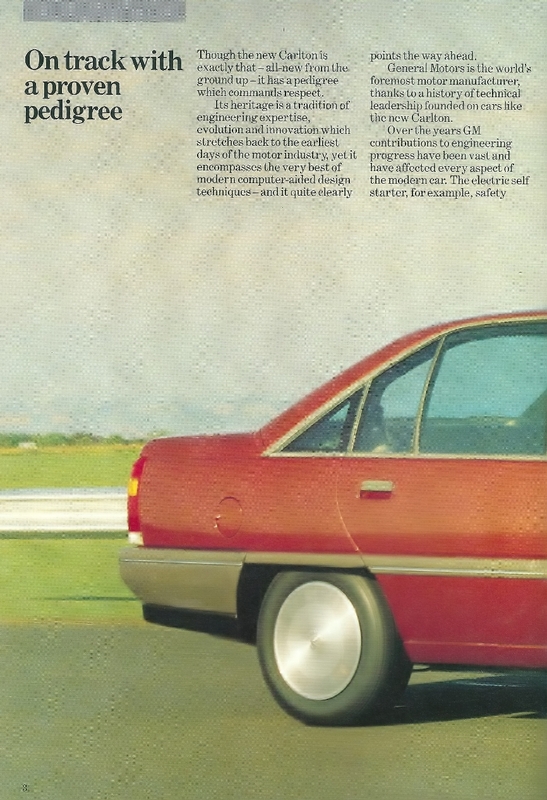 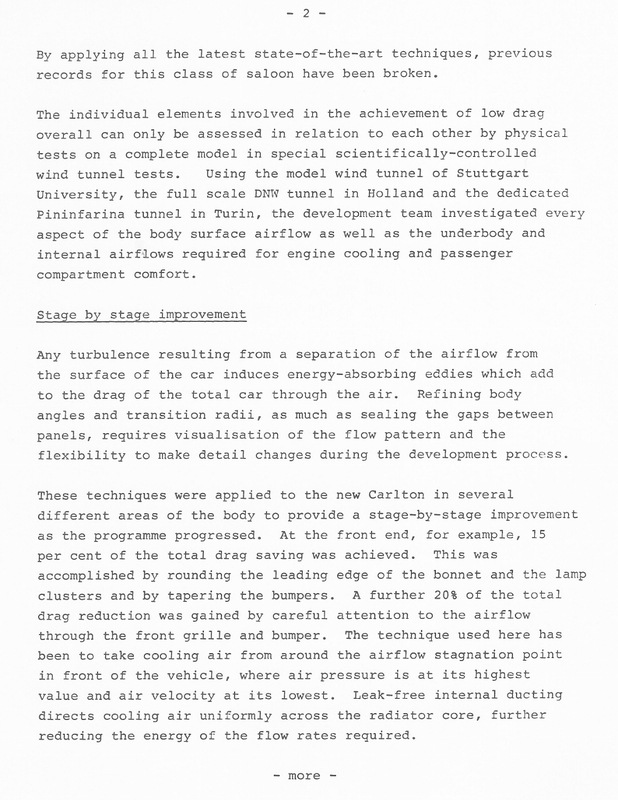 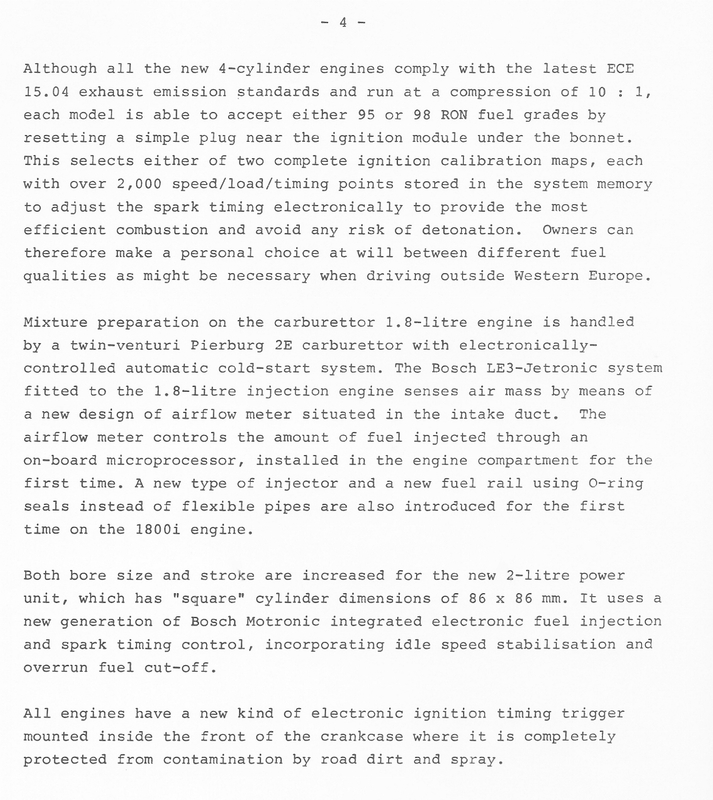 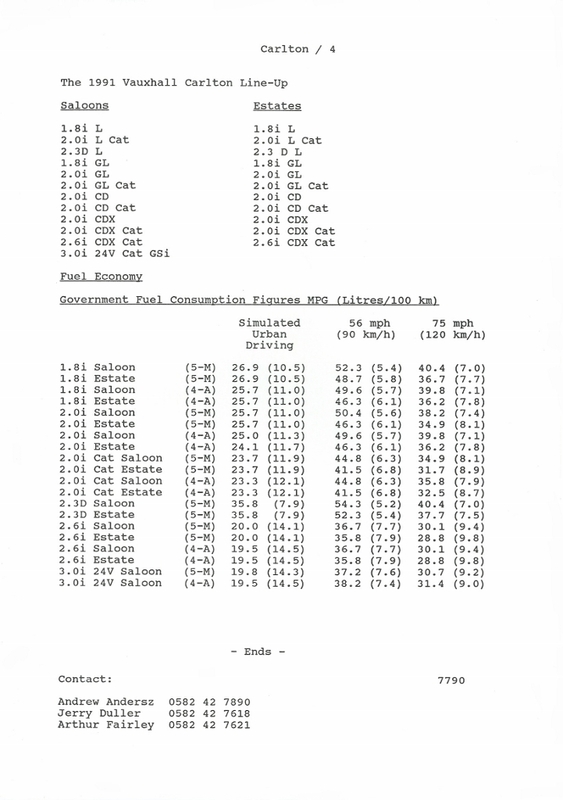 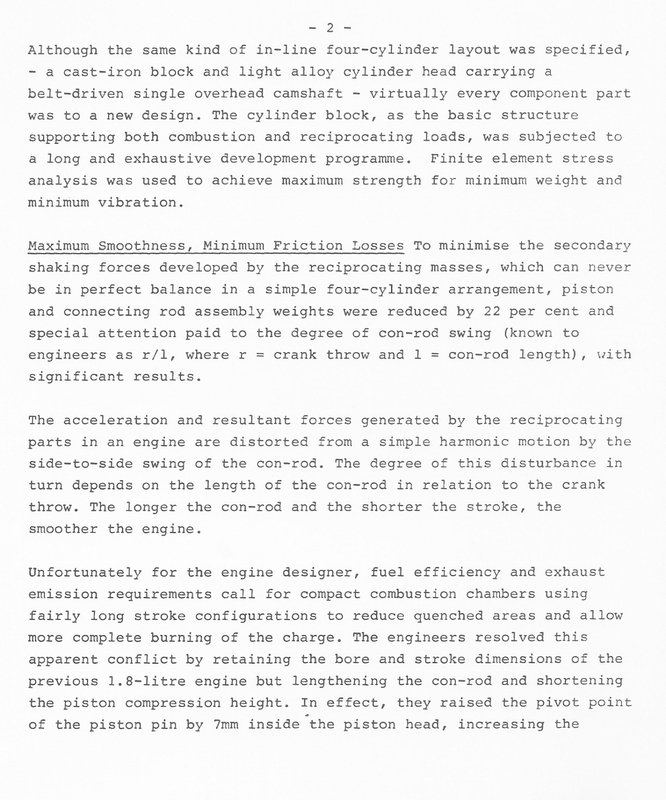 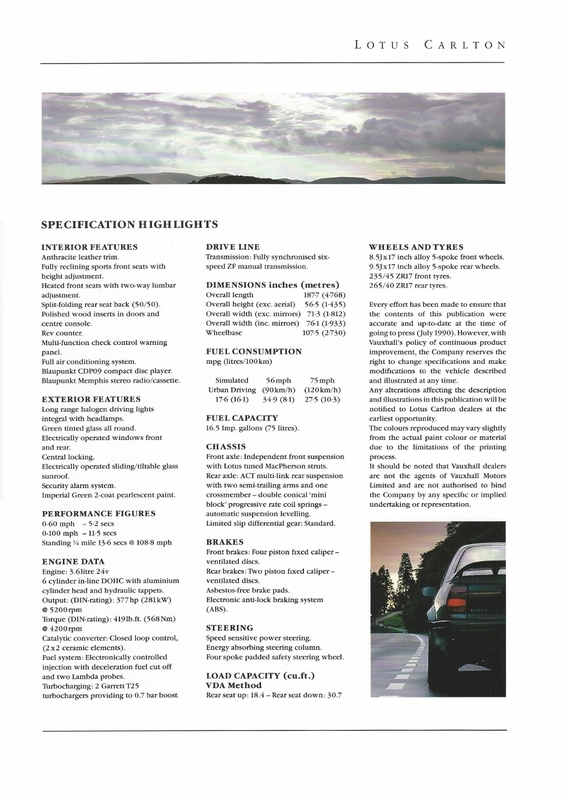 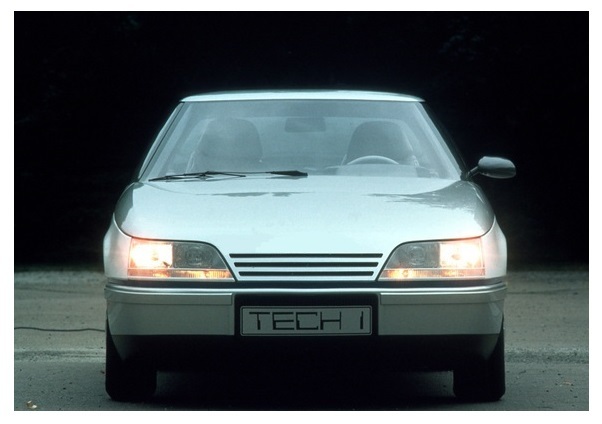 This was essential for reducing fuel consumption at speeds above 50mph, in fact the front end design had already been previewed in the 1981 Tech 1 Concept. 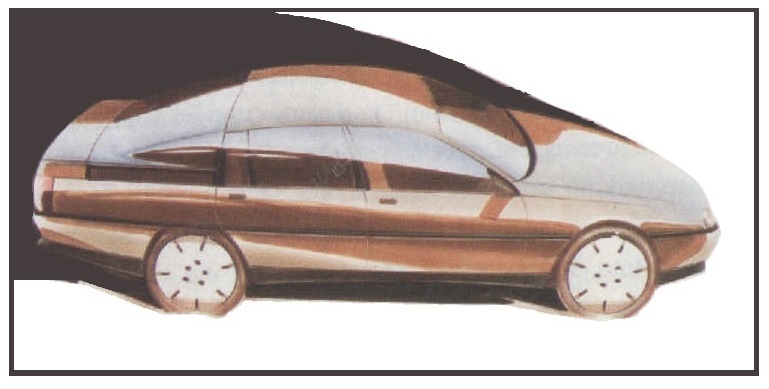 Early design sketches showed similar styling using smooth aerodynamic forms with low waistlines and large glass area. 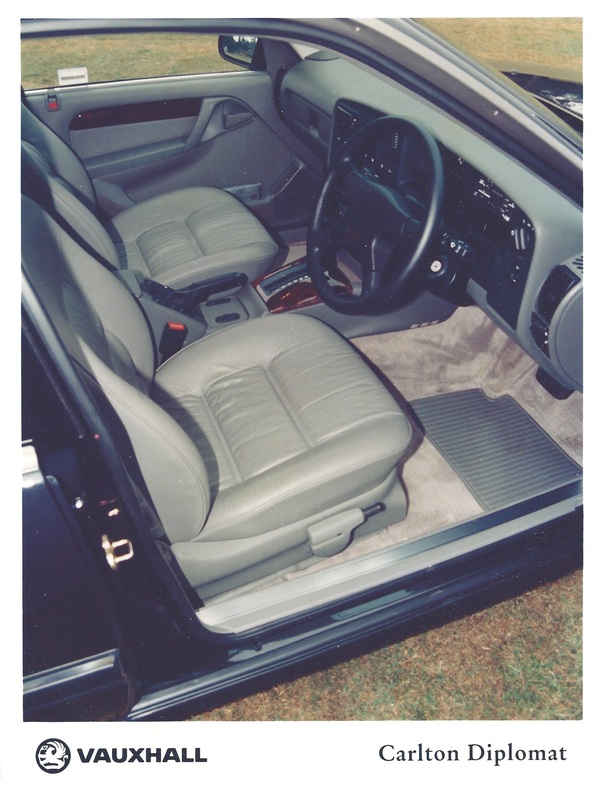 lavish appearance, the subdued lighting of fittings and switches were among other additions. 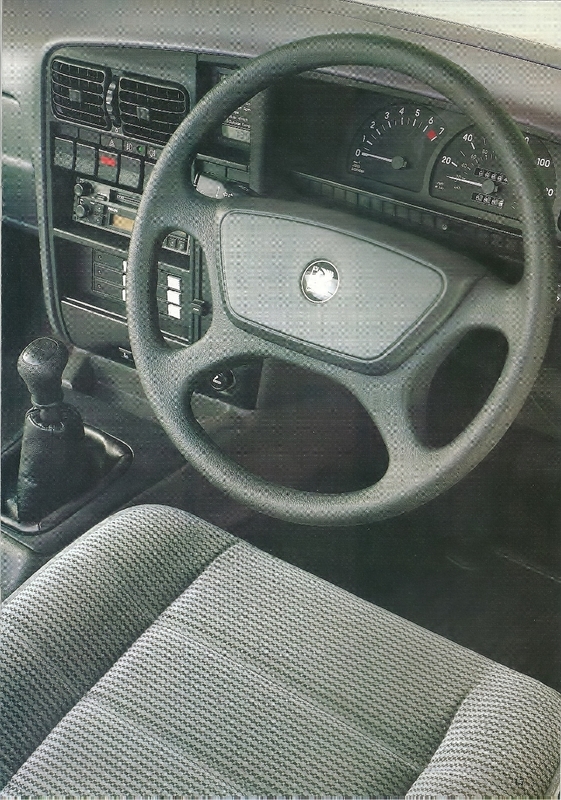 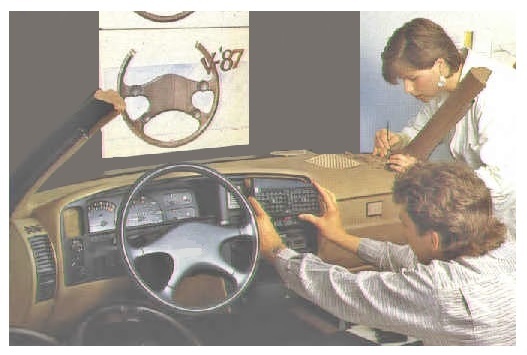 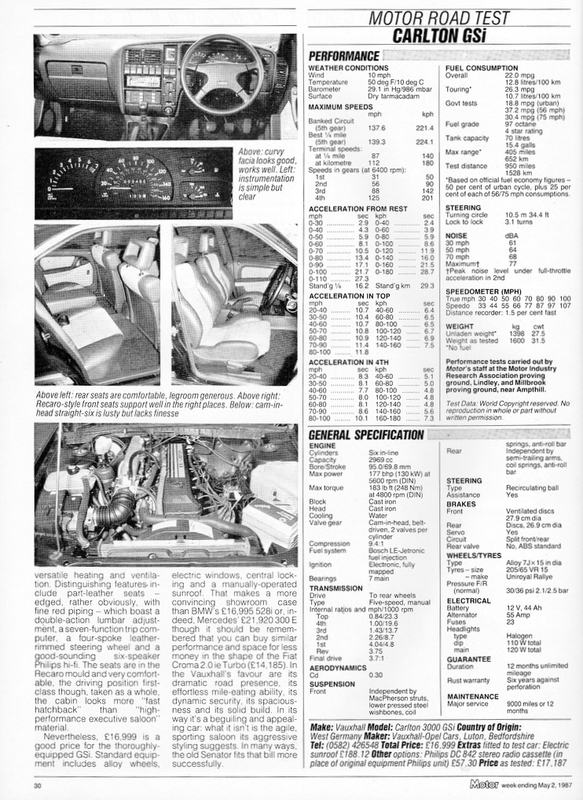 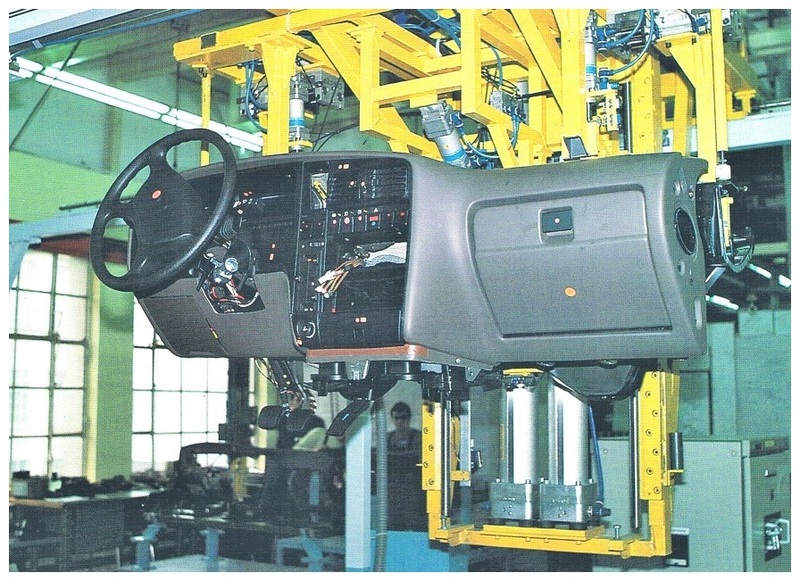 In order to reduce production time & costs as well as eliminate rattles the complete dashboard assembly was built up prior to installation and fixed with a special body glue, a system first used on the Astra MK2. 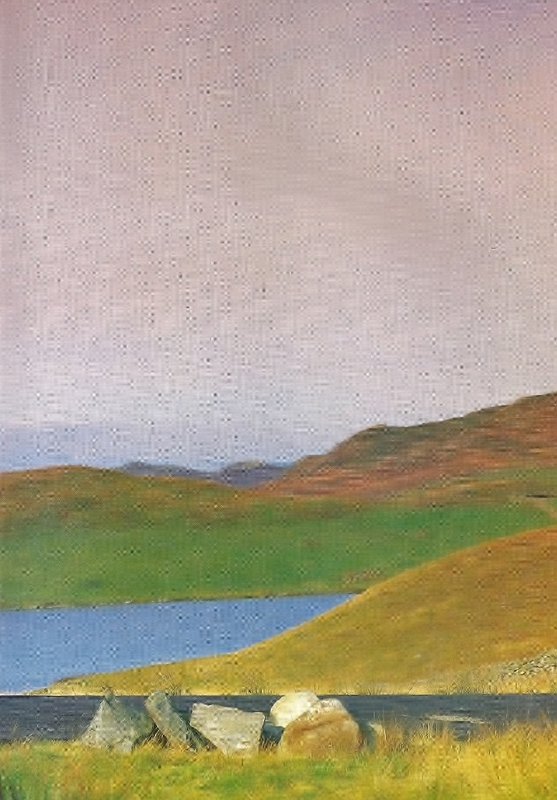 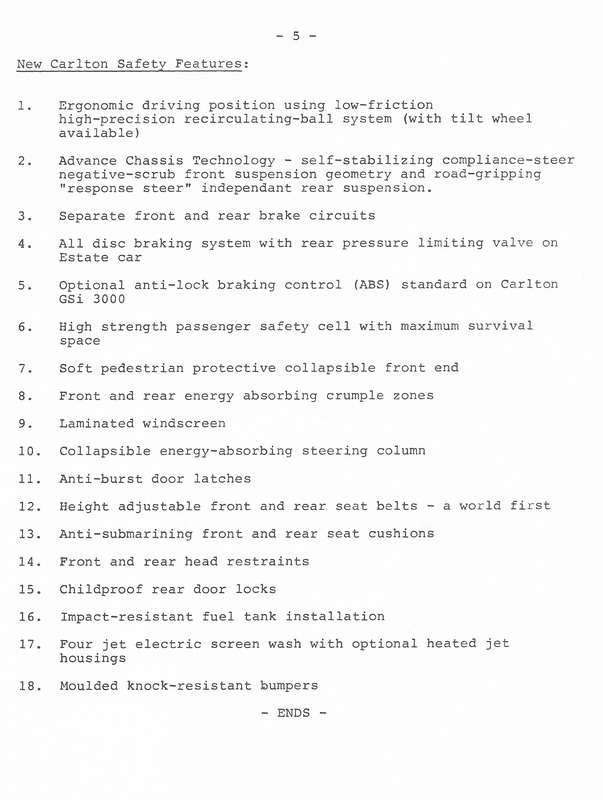 pedestrians and cyclists. 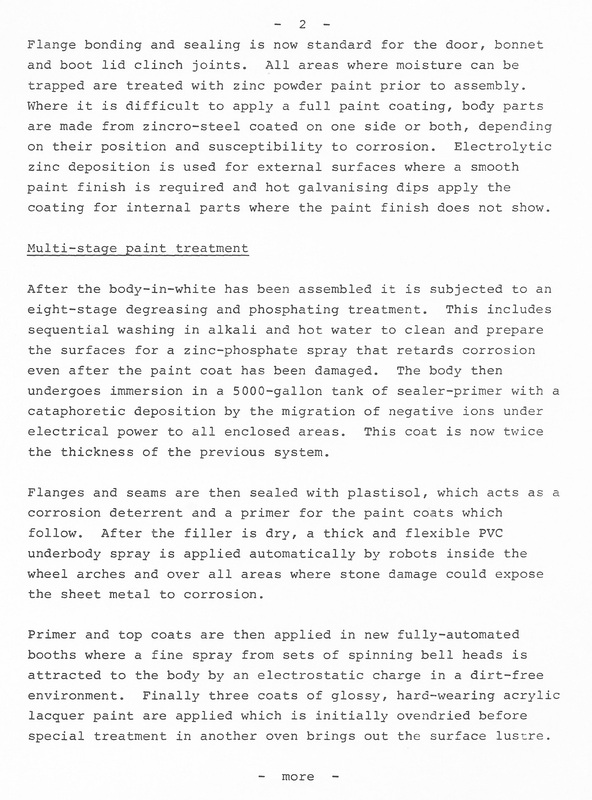 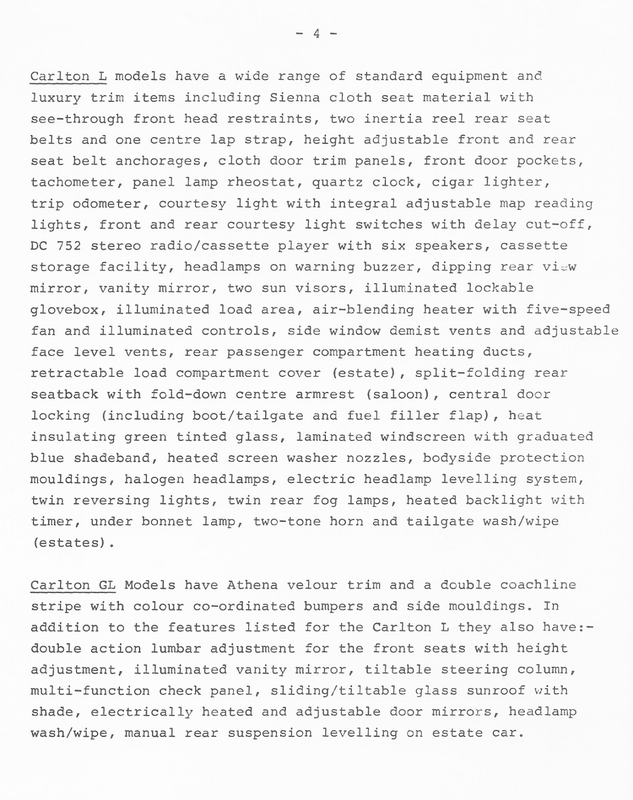 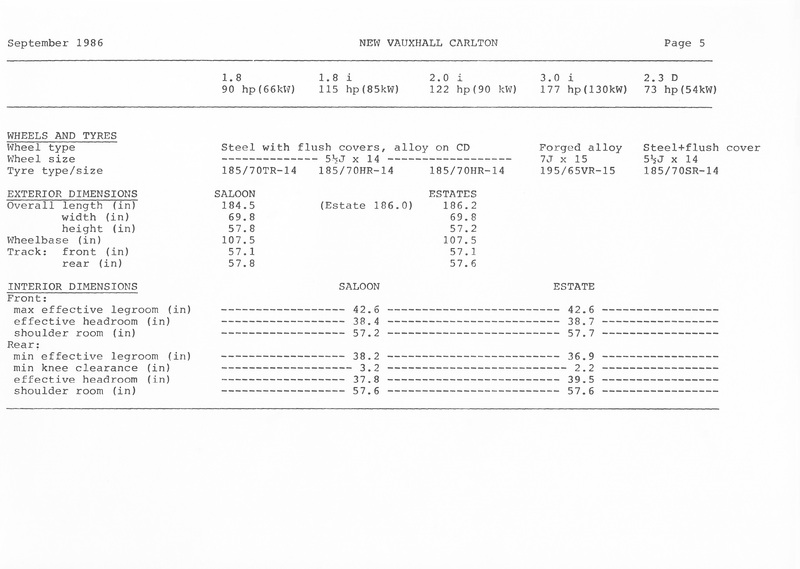 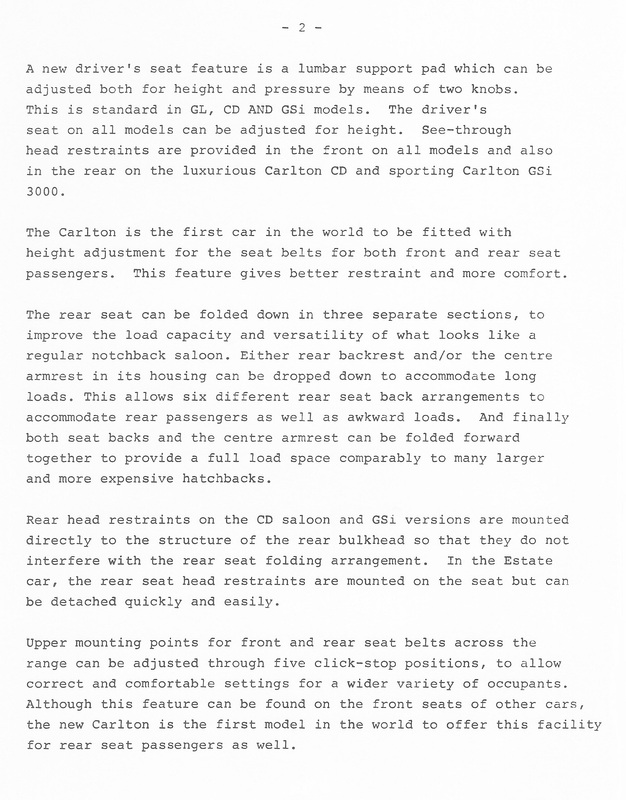 The calculation of body stiffness was carried out using GMs Cray Supercomputer for the Carlton in order to optimize the body structure without having to add unnecessary weight. 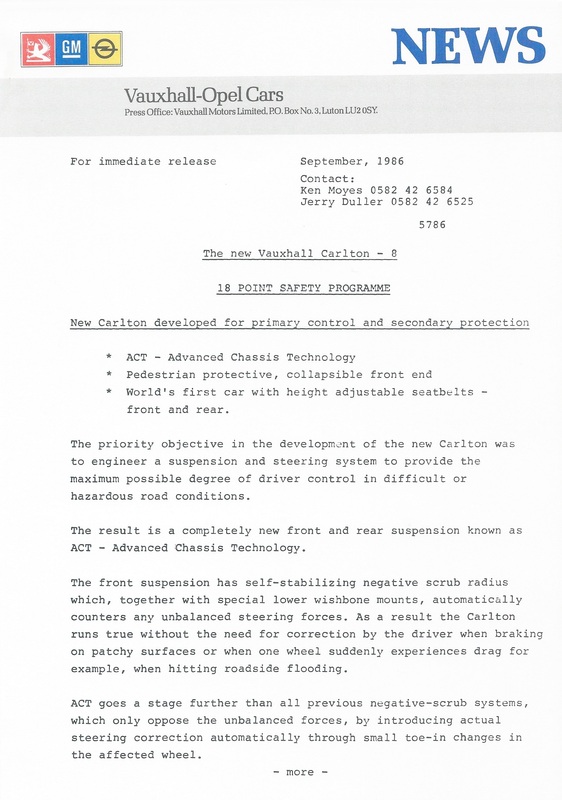 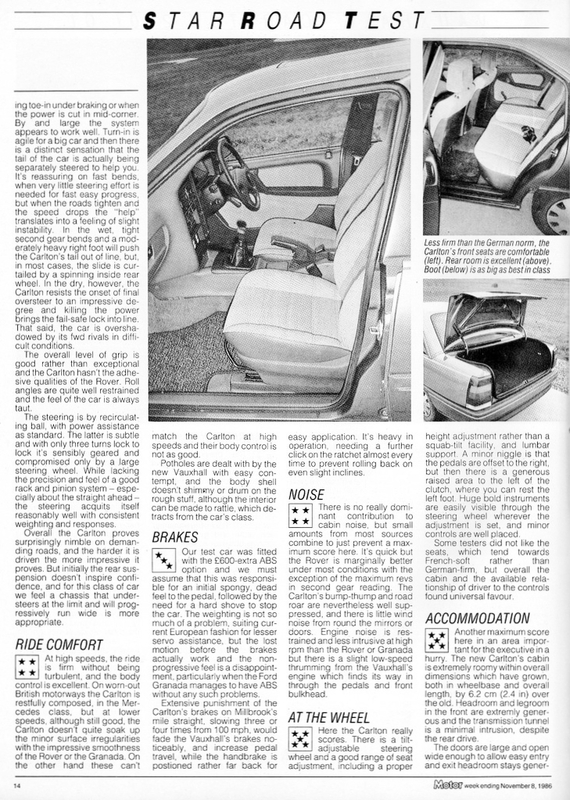 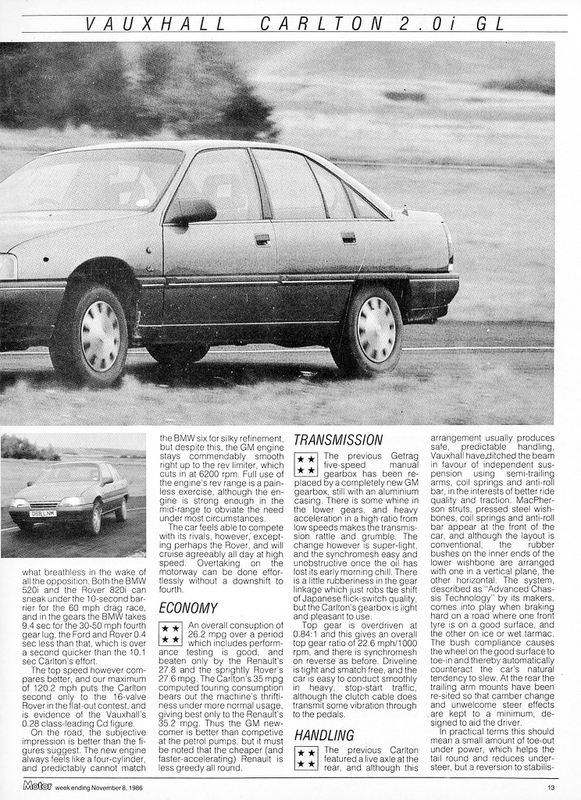 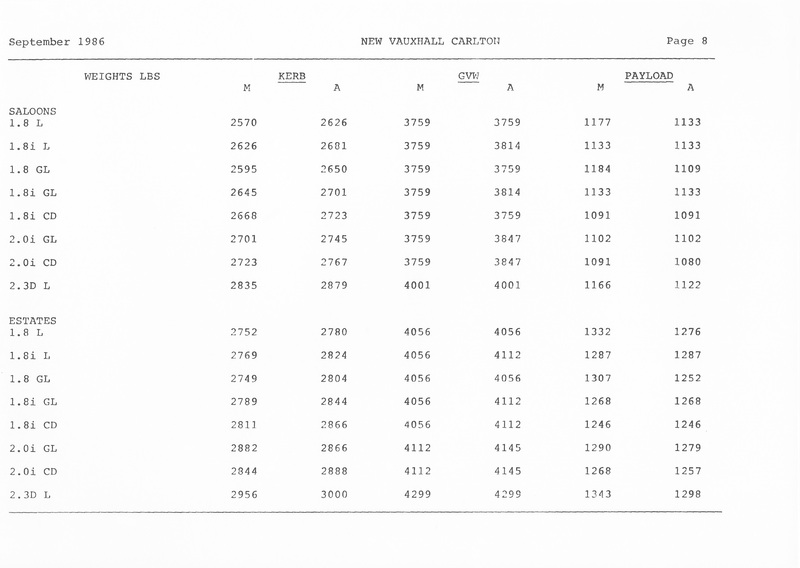 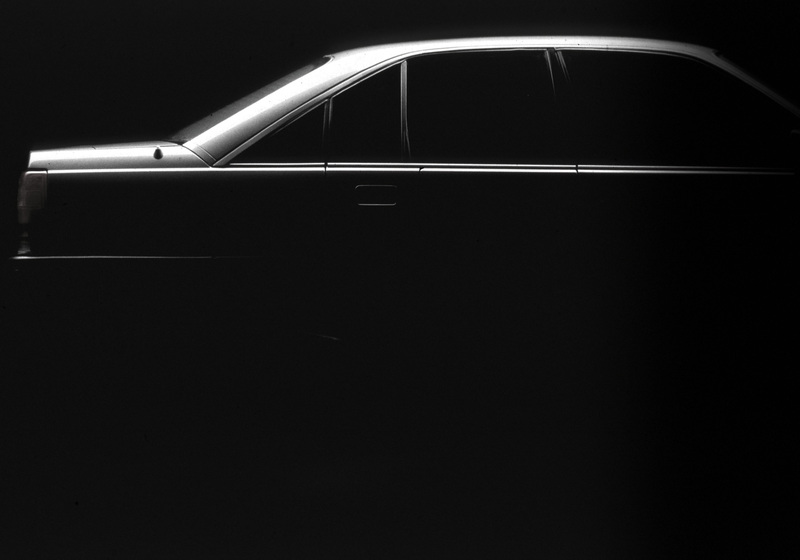 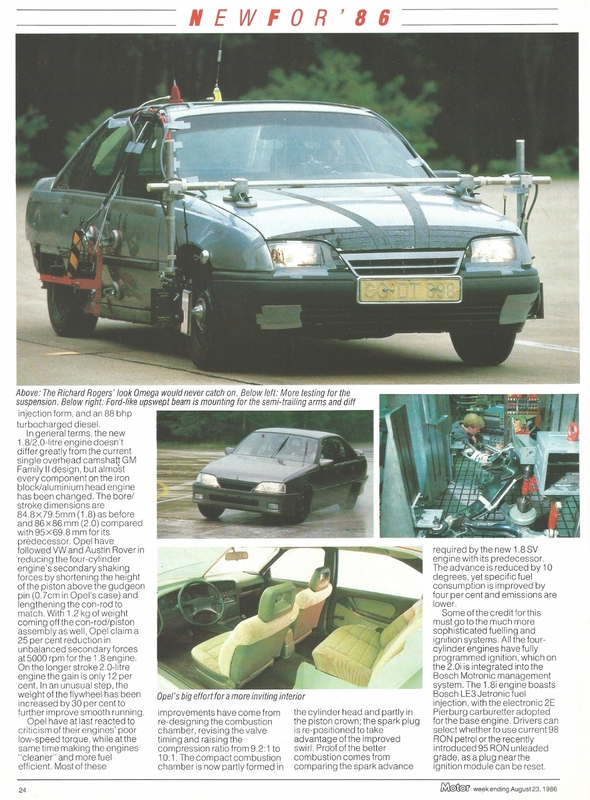 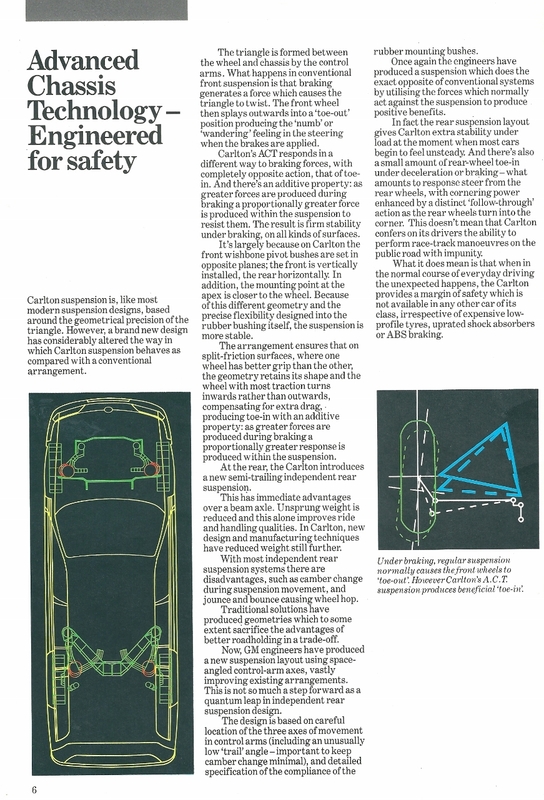 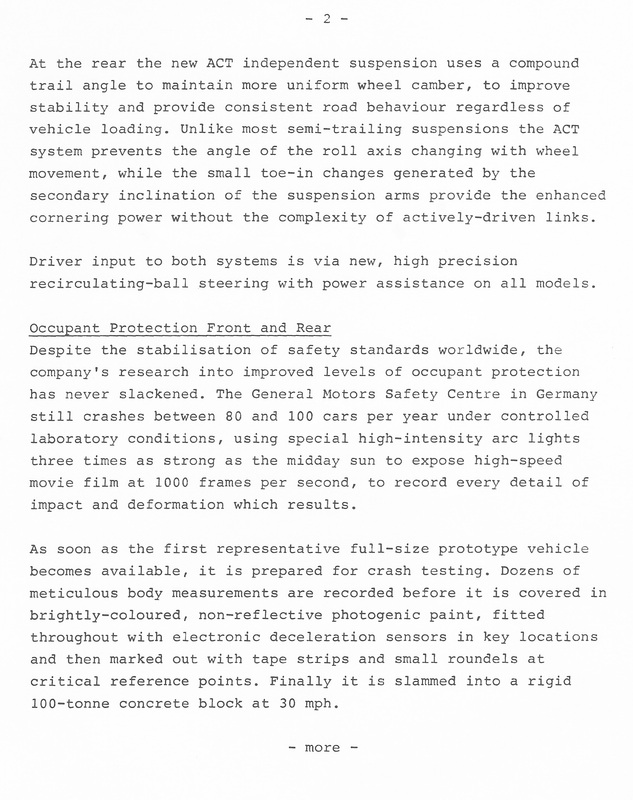 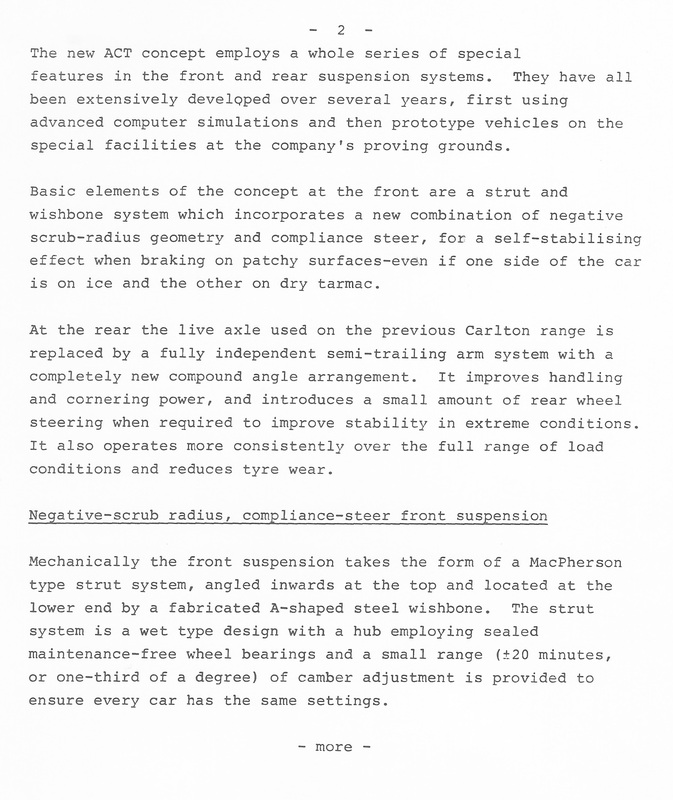 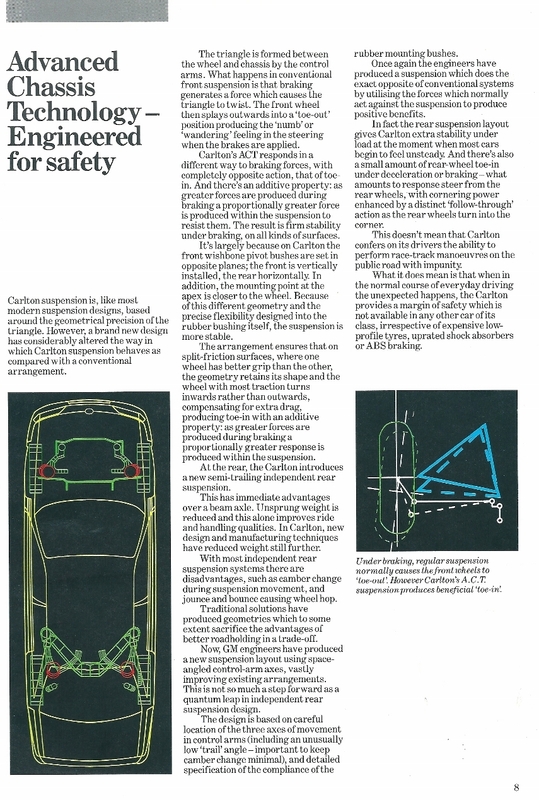 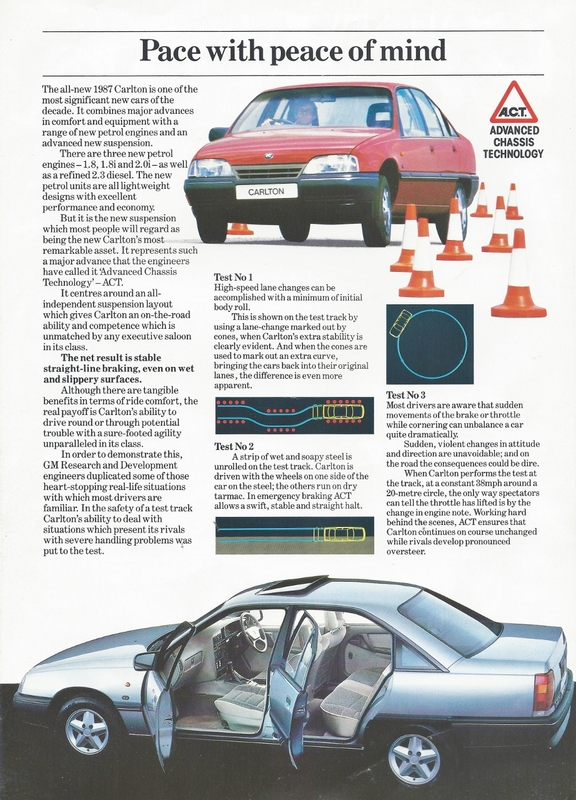 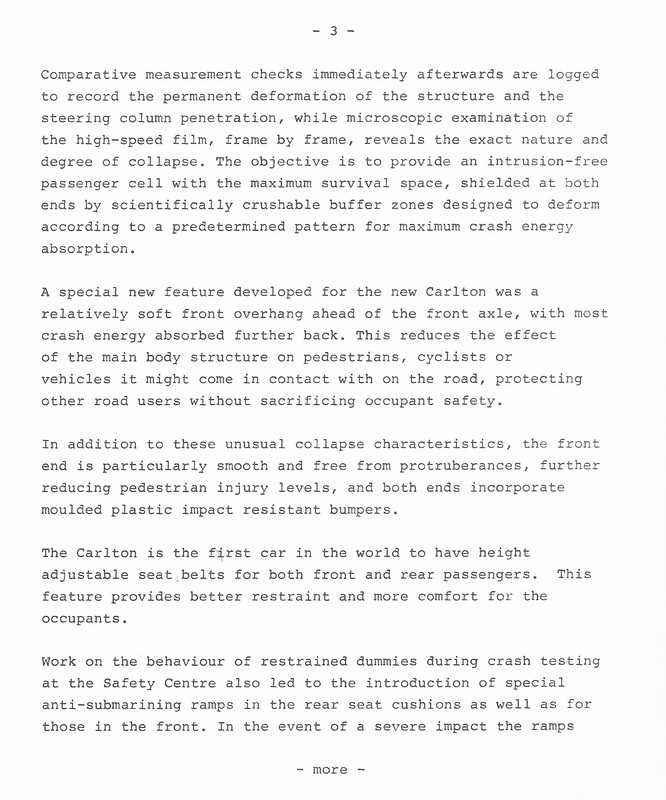 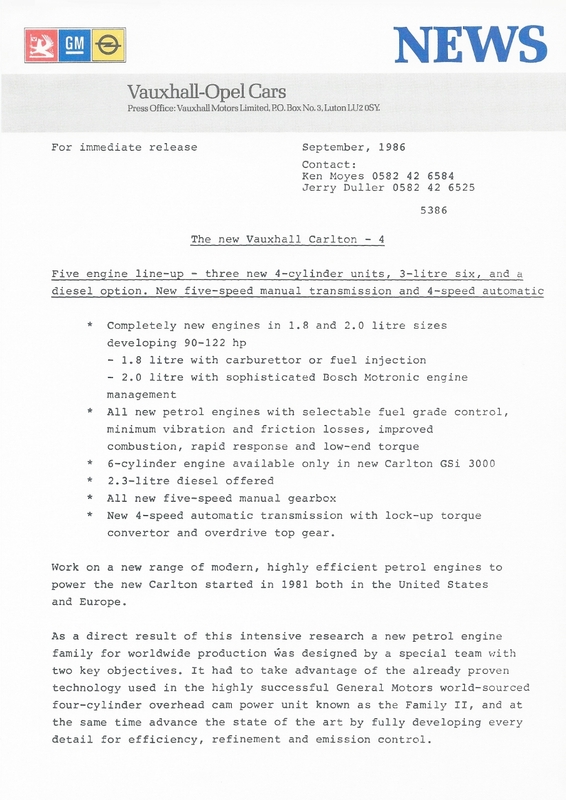 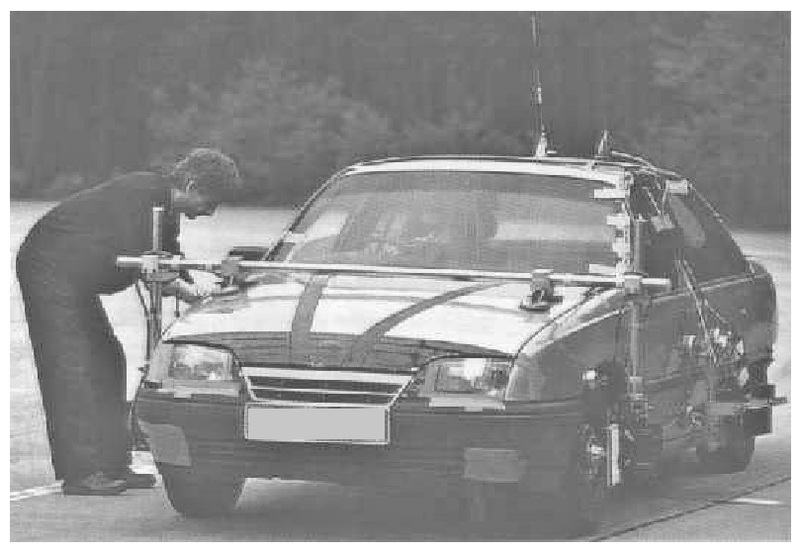 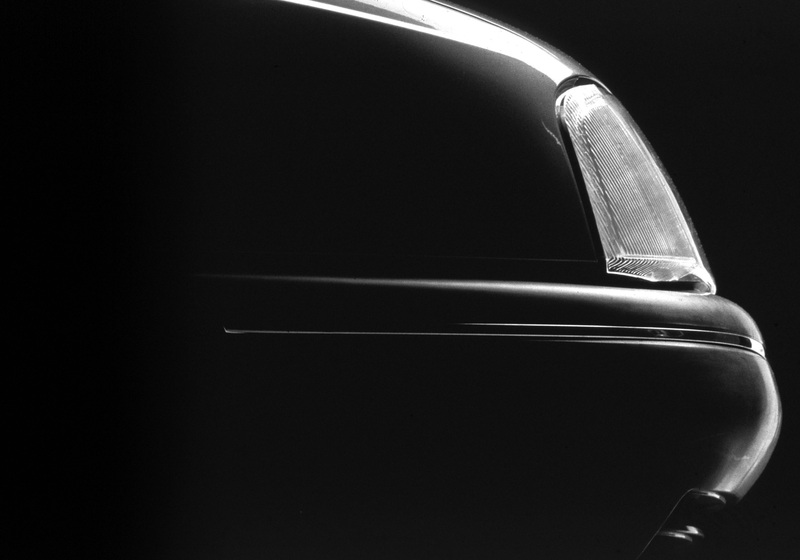 Unusually, crash testing was conducted initially using the front end of the proposed new Carlton but using the rear end of a Royale Coupe in order to reduce costs while still giving realistic test data. 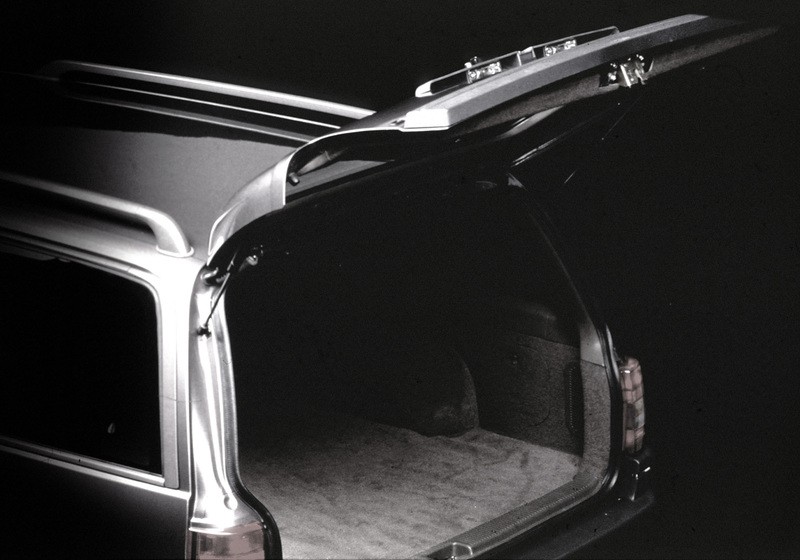 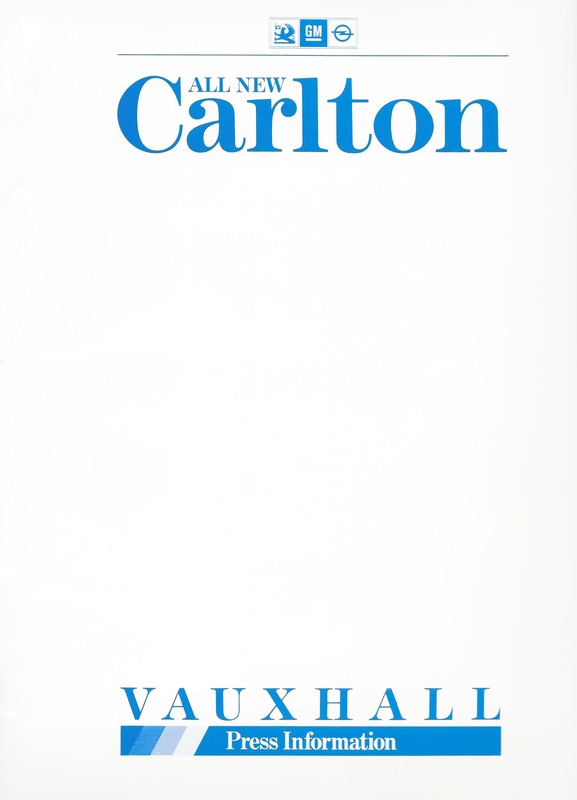 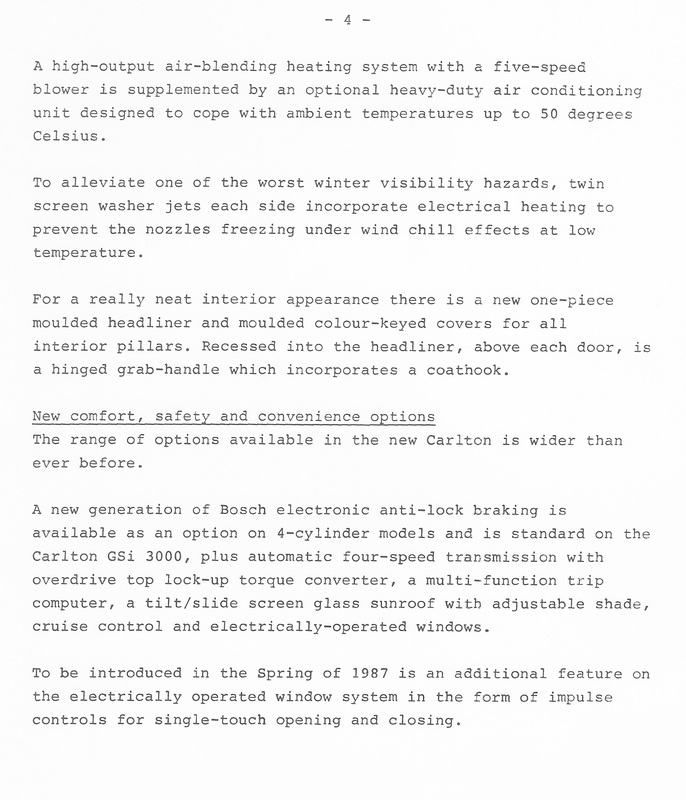 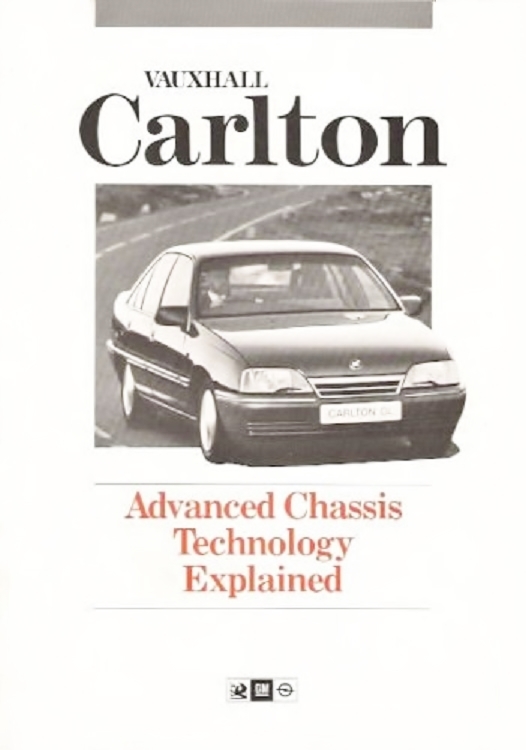 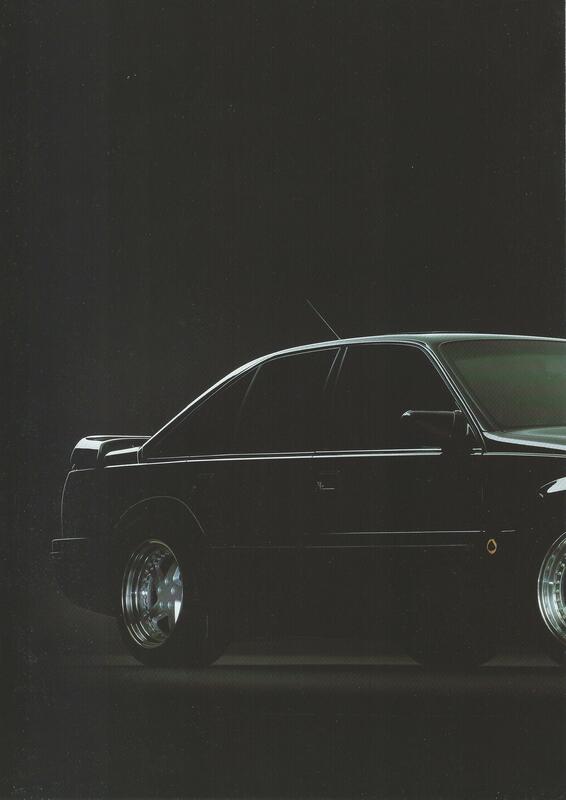 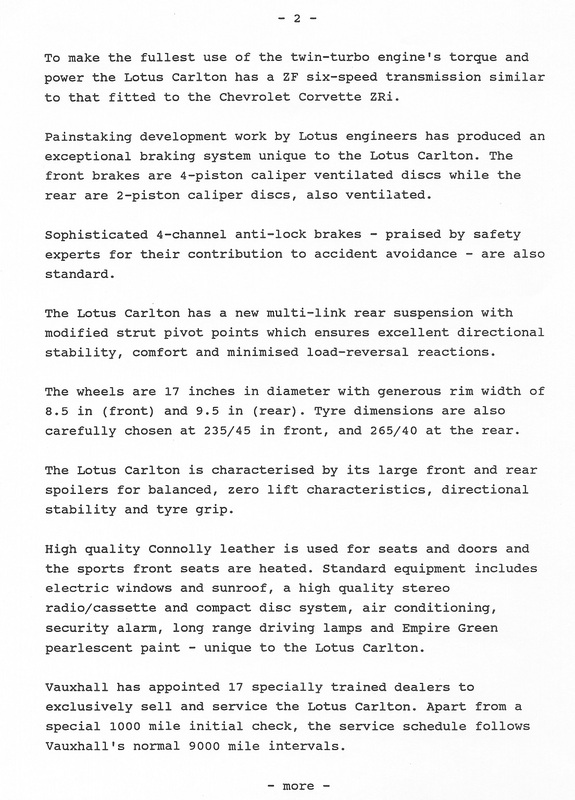 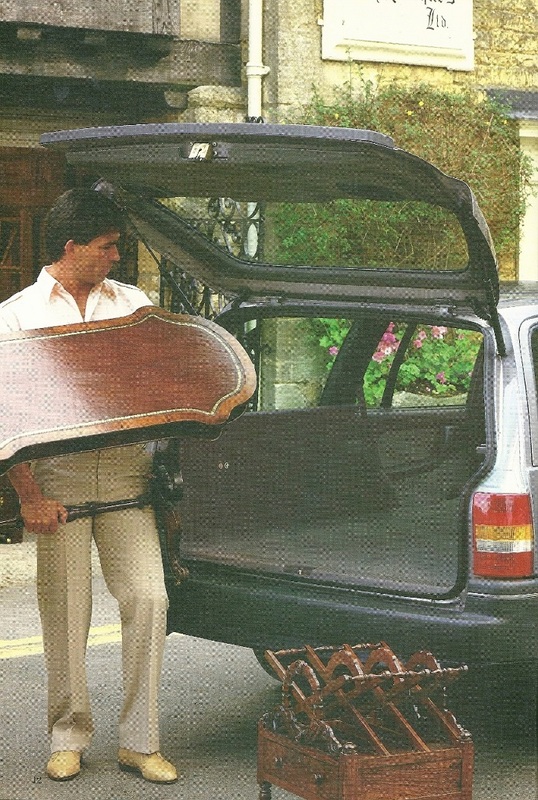 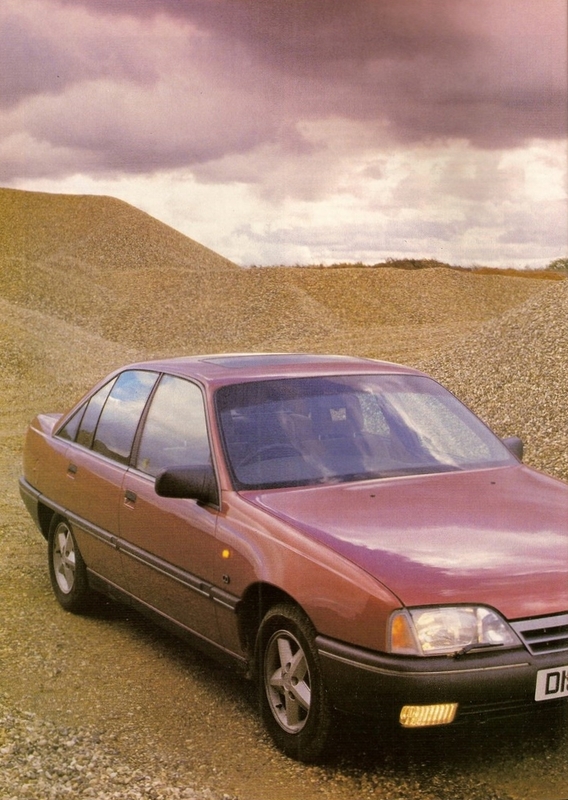 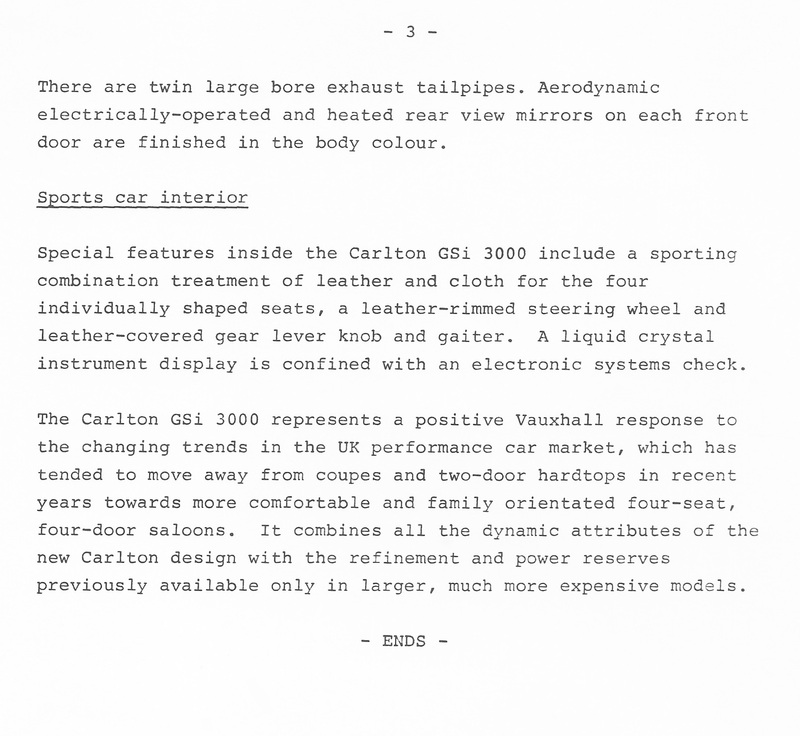 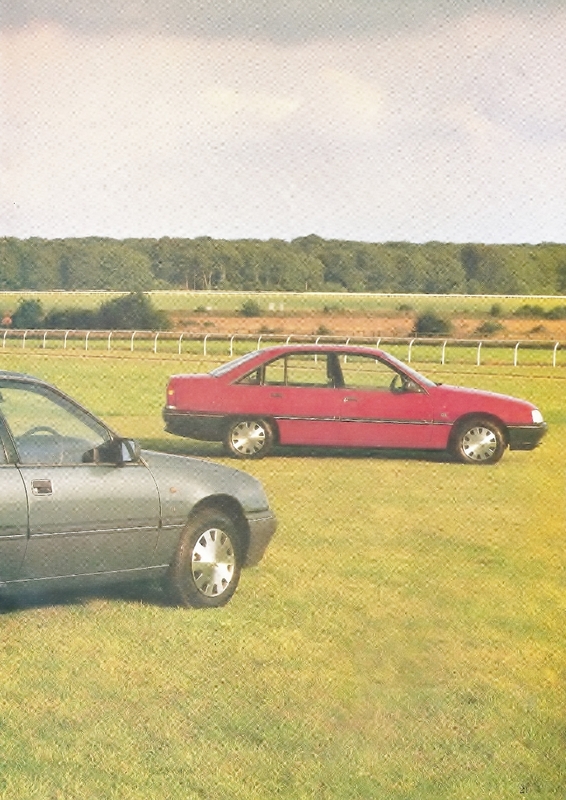 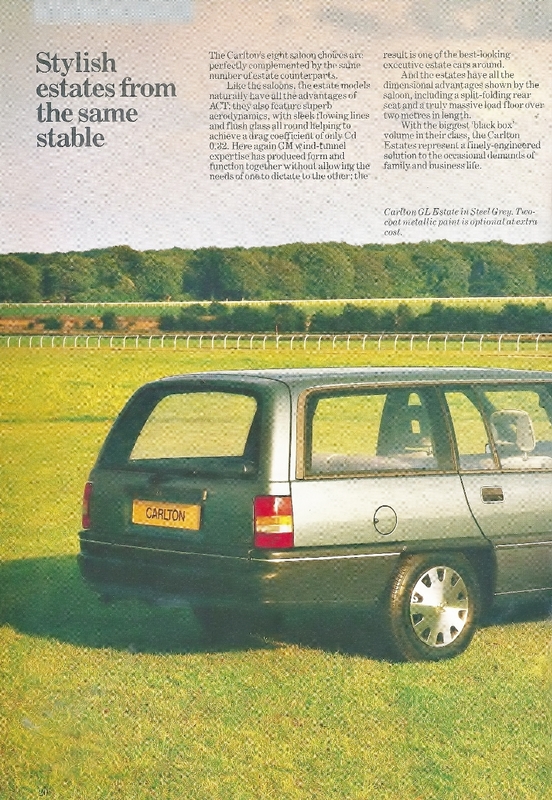 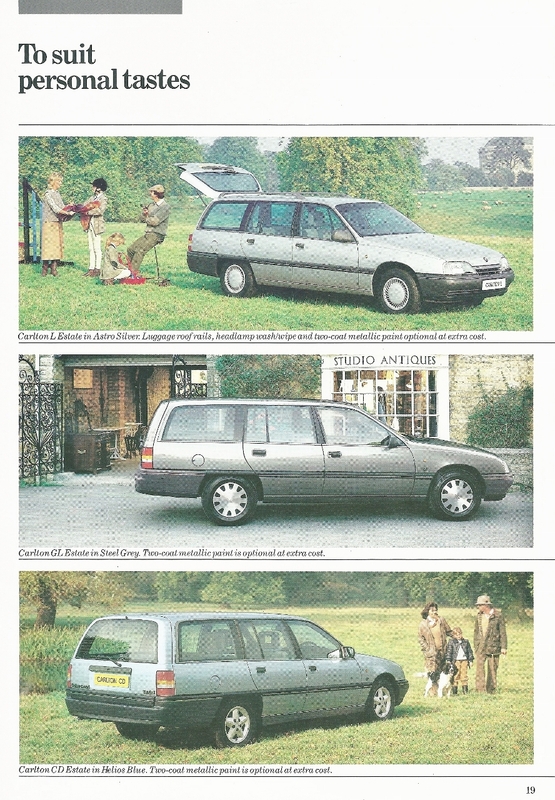 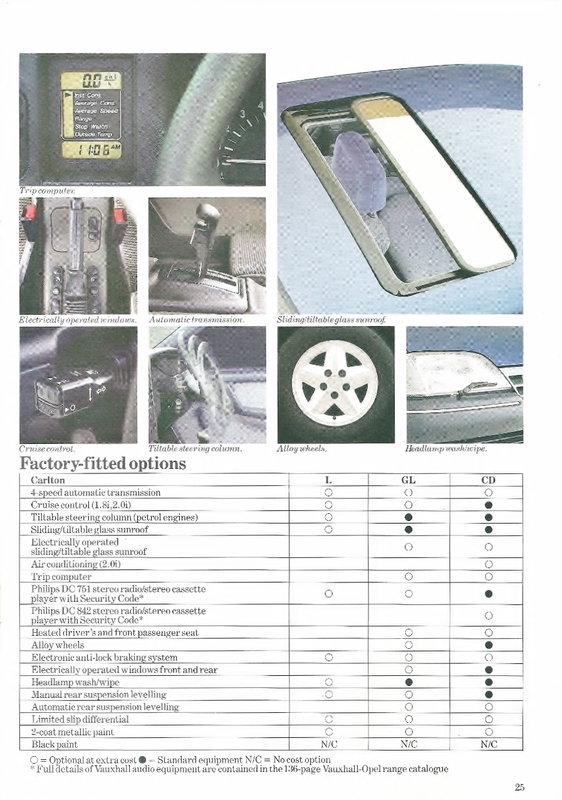 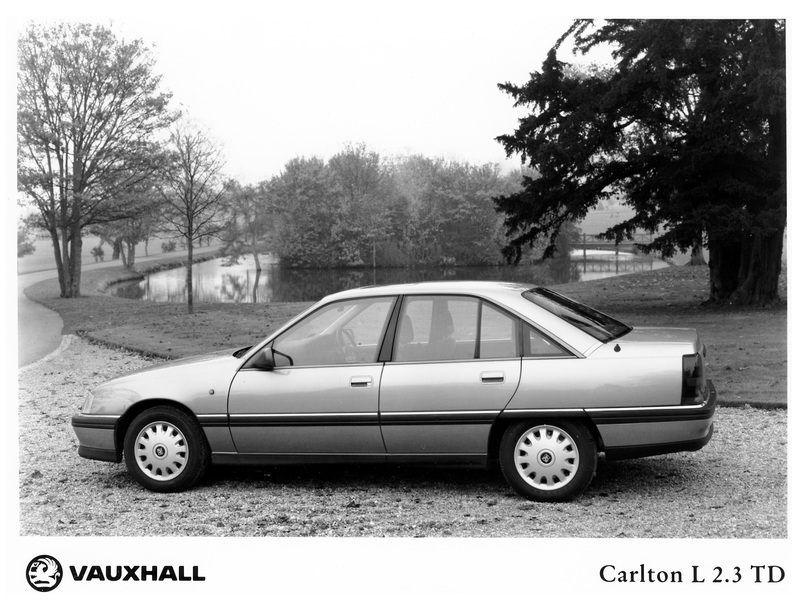 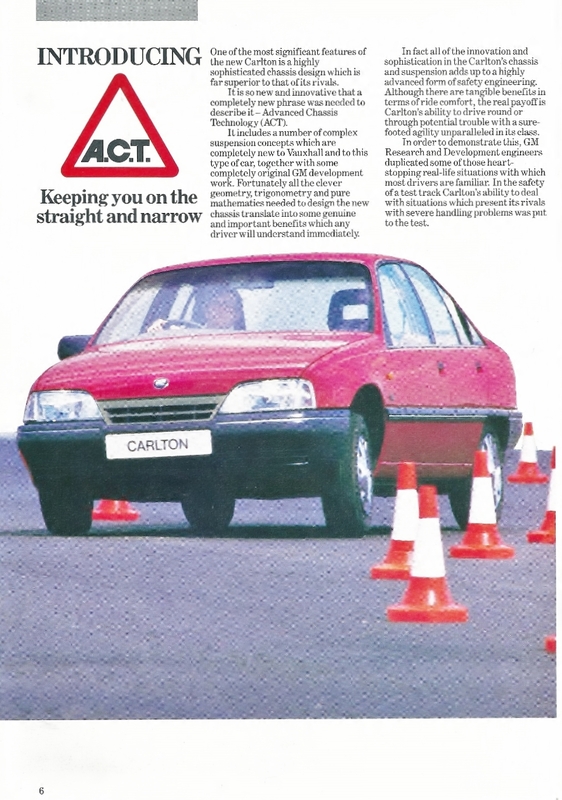 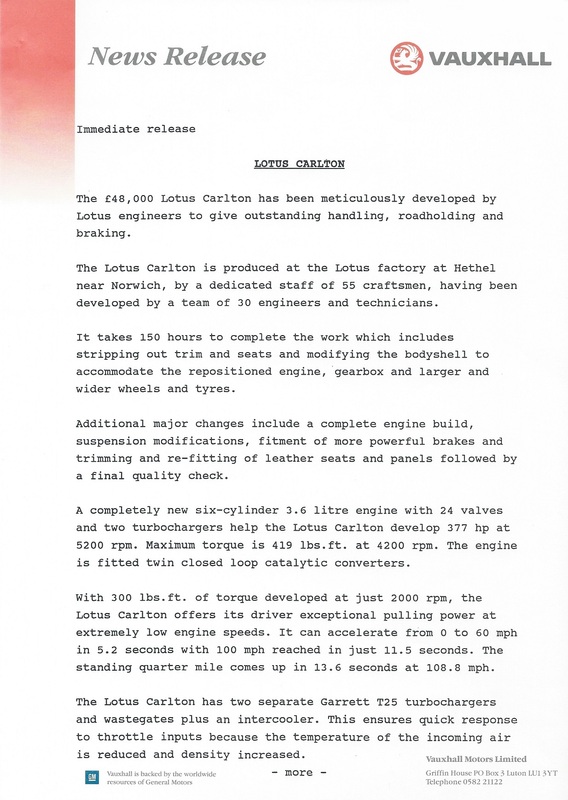 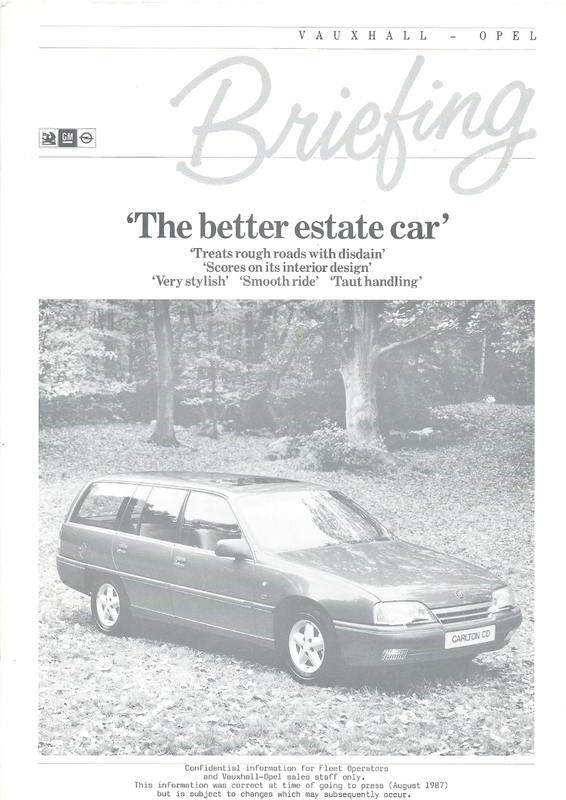 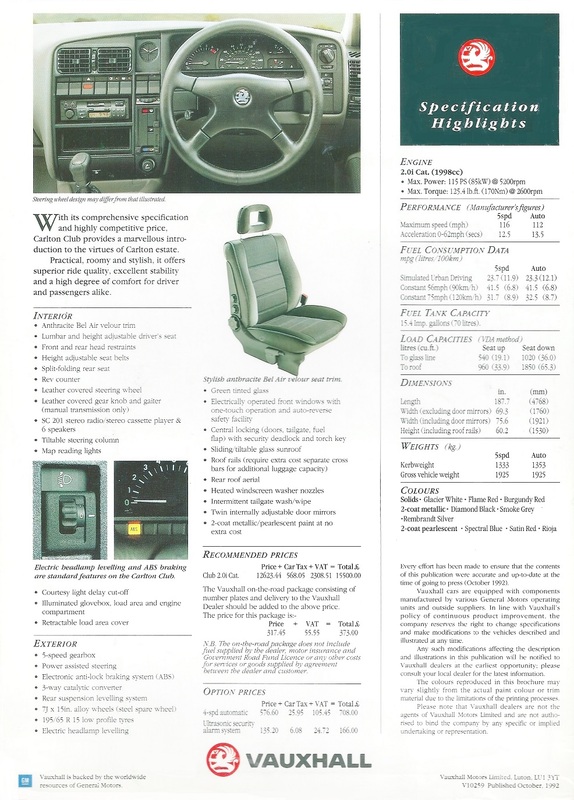 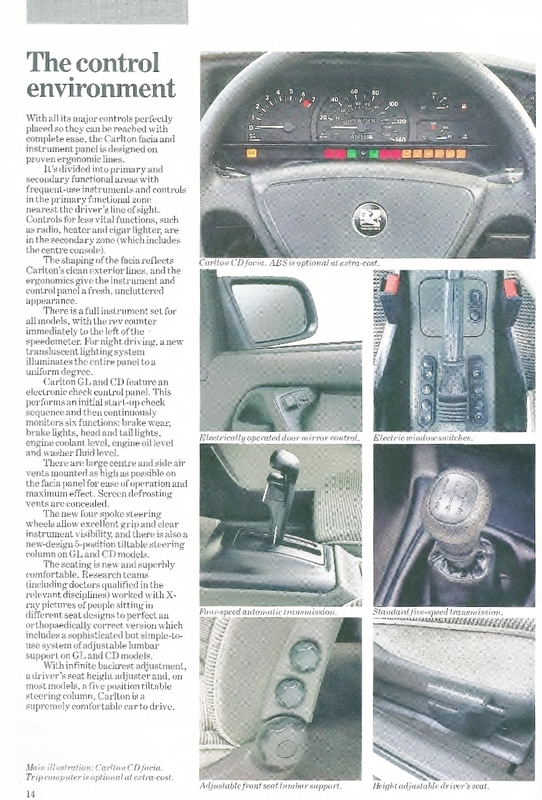 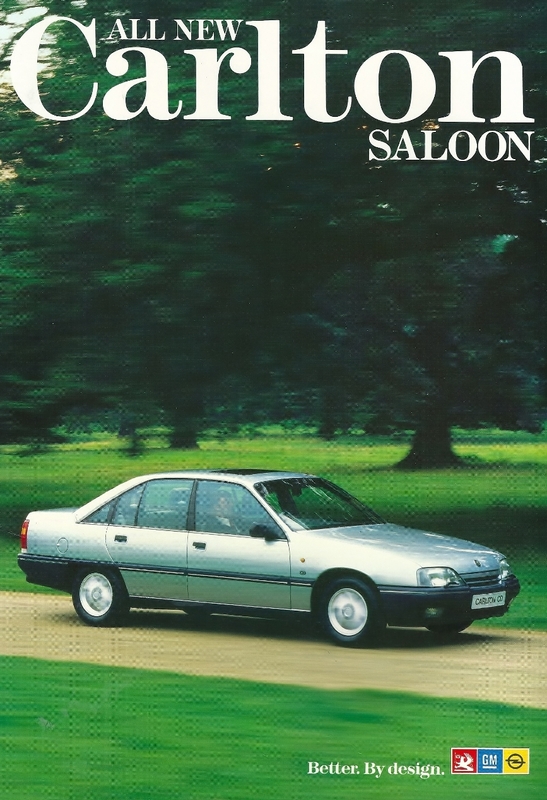 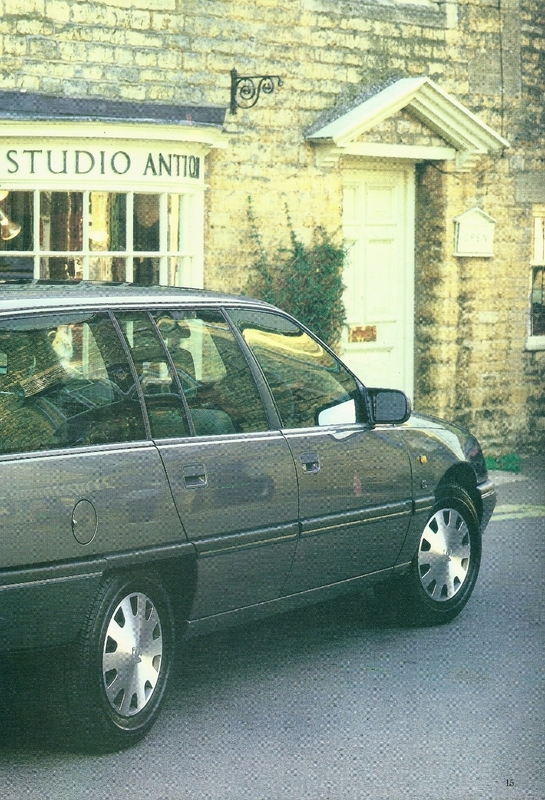 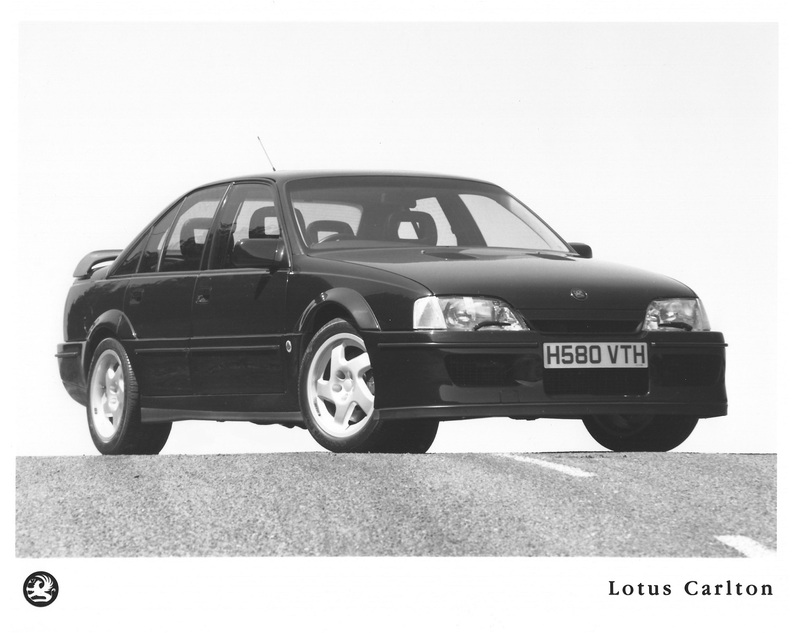 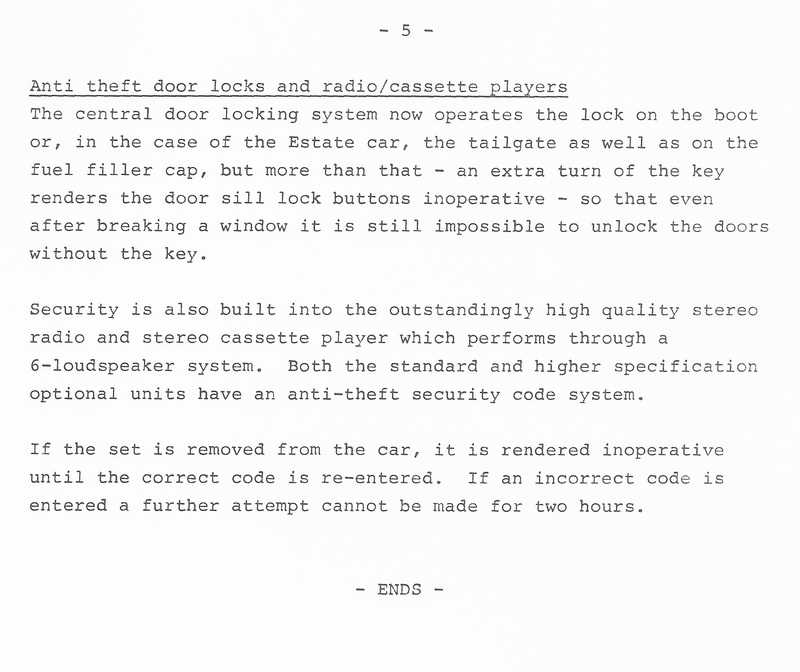 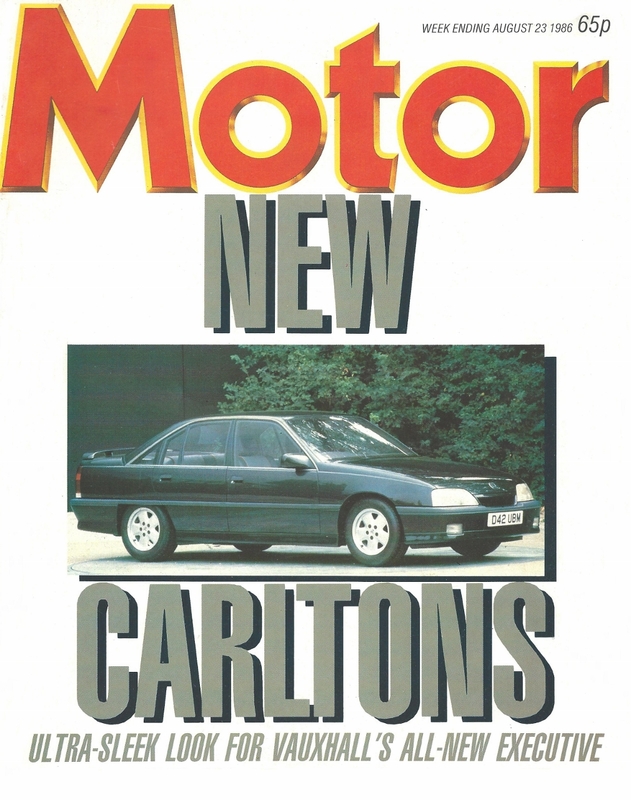 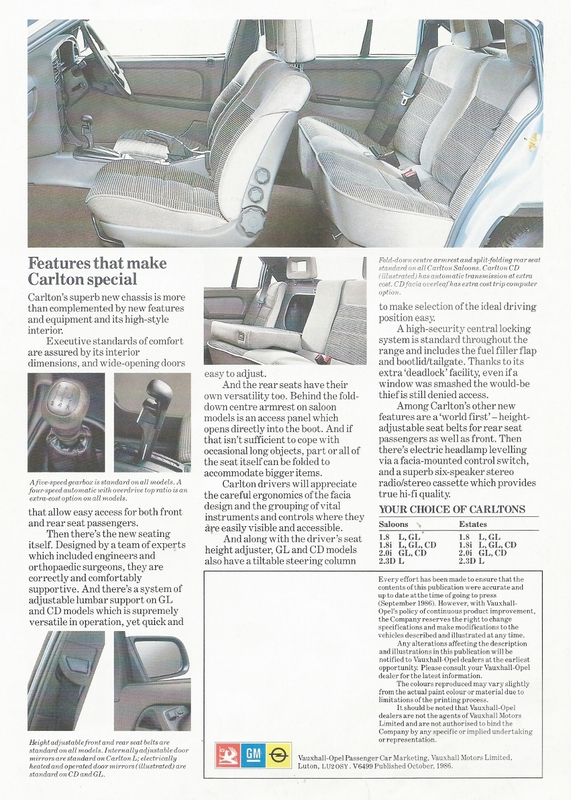 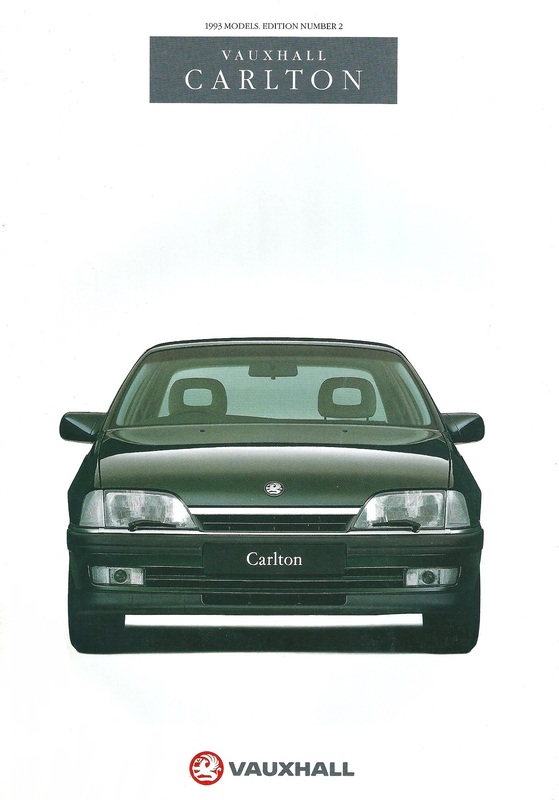 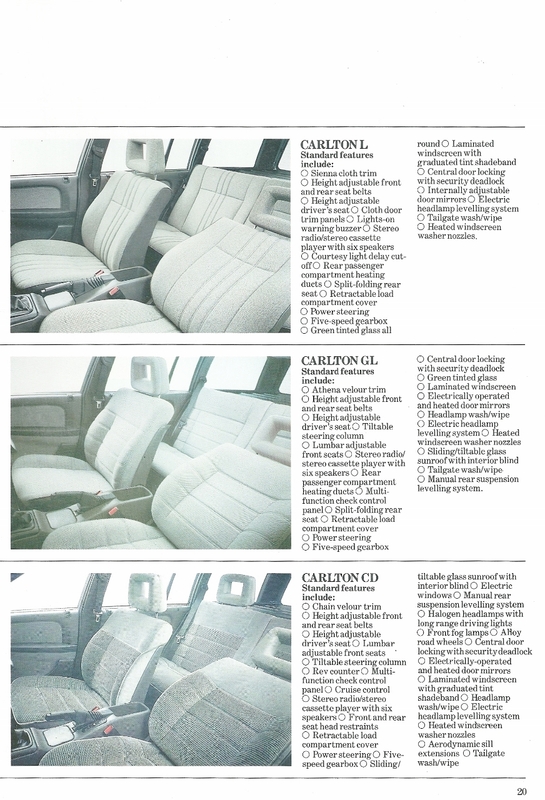 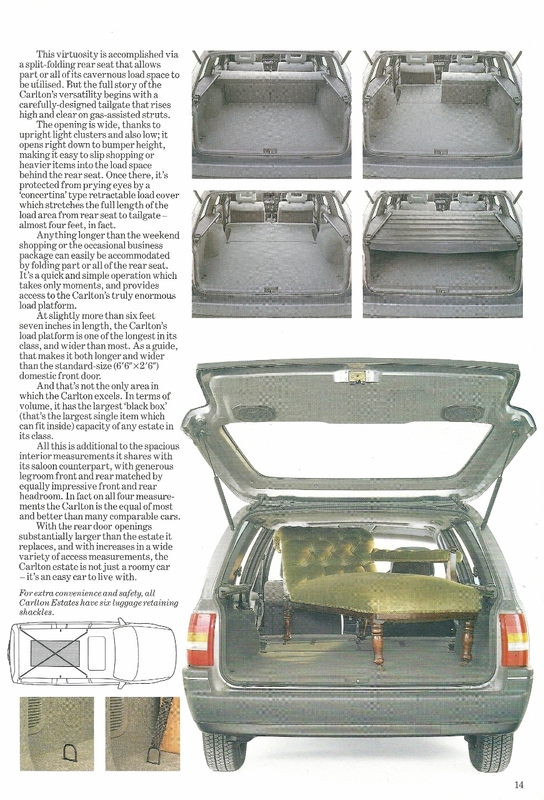 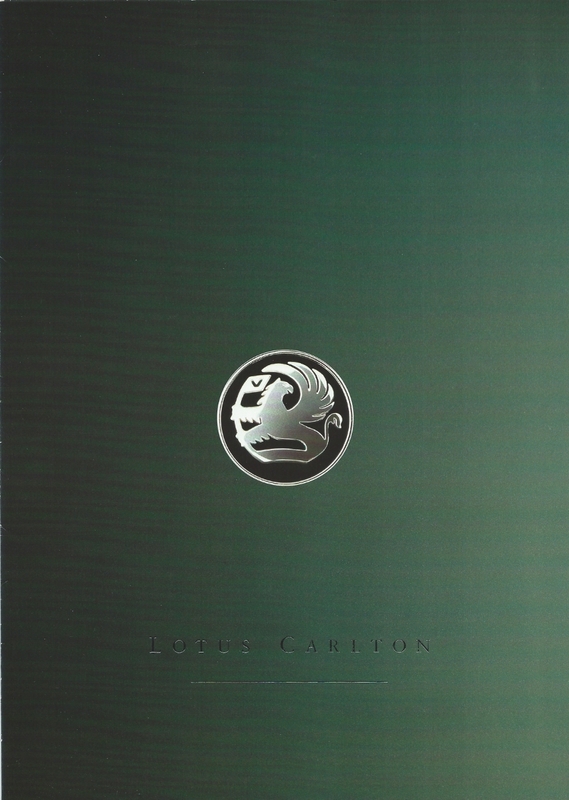 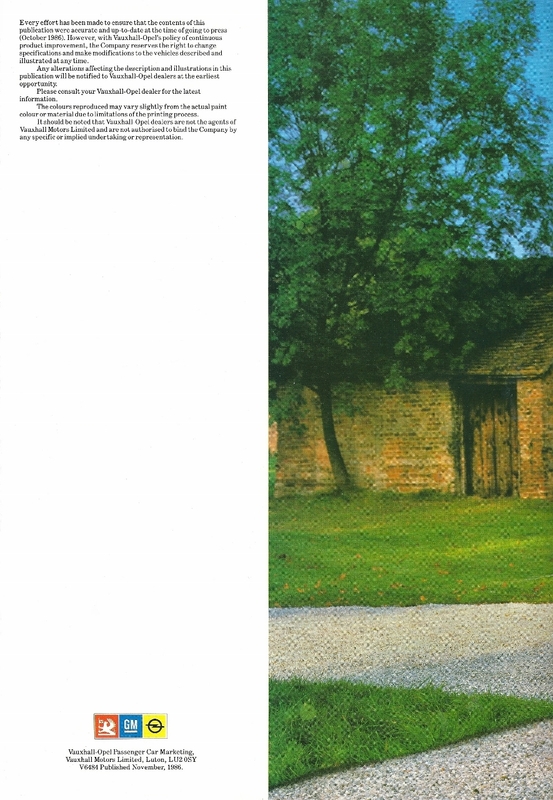 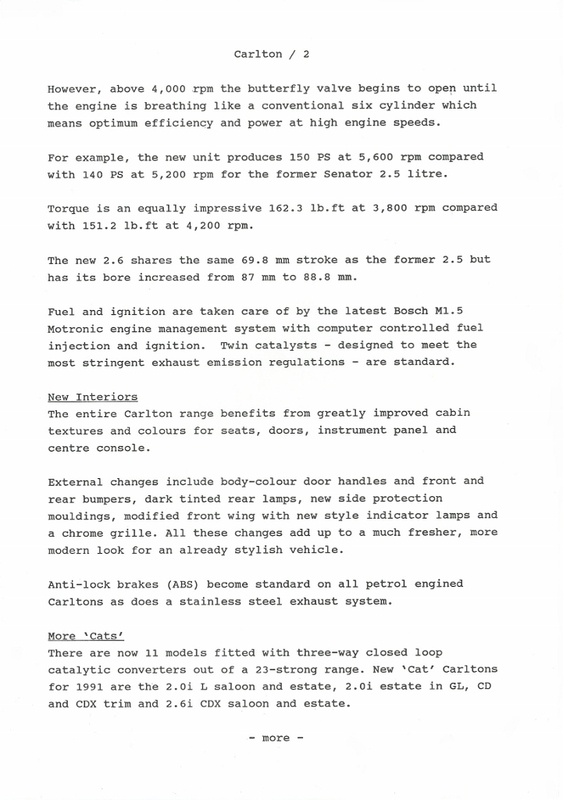 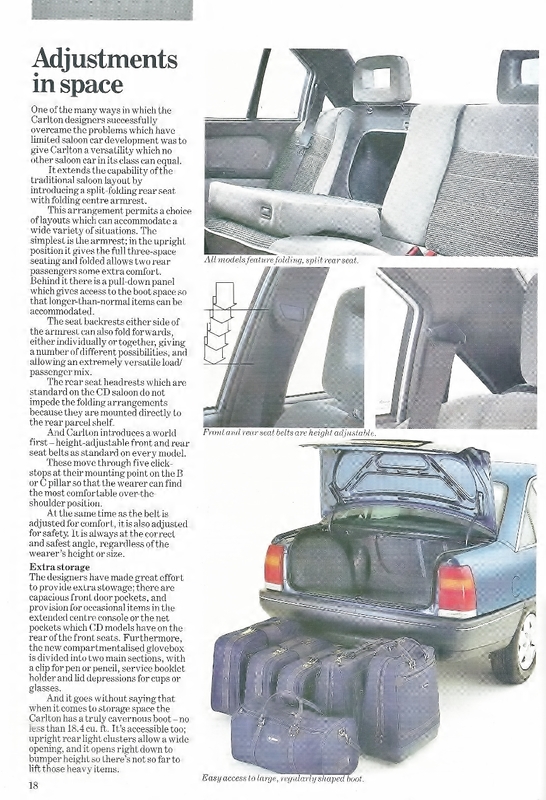 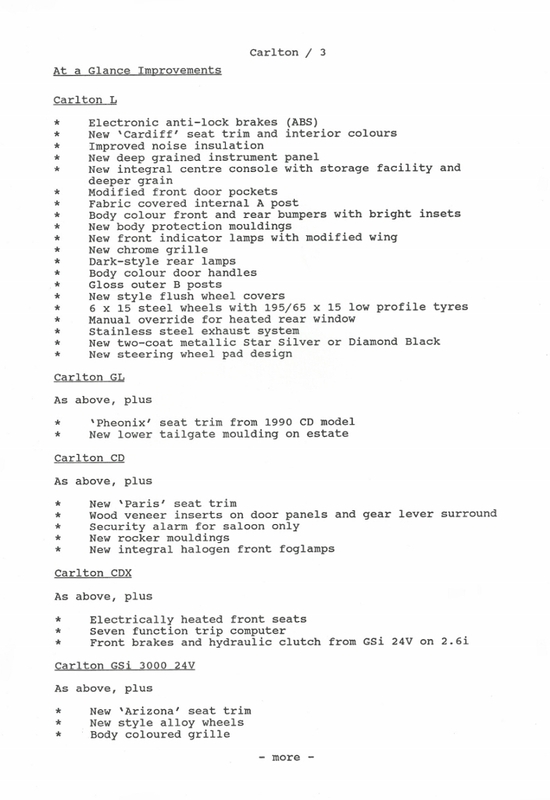 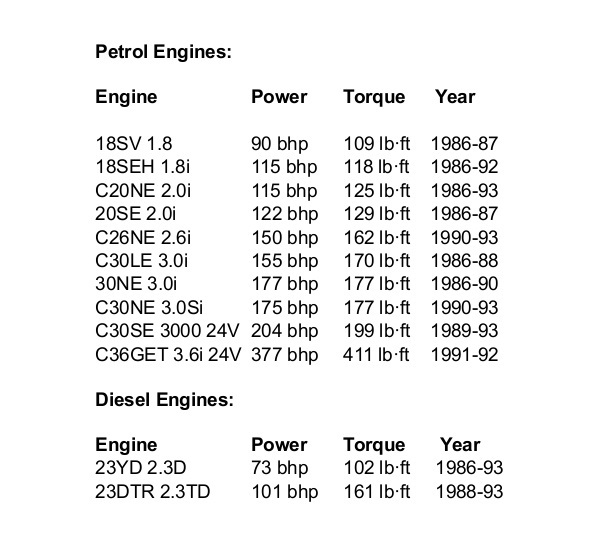 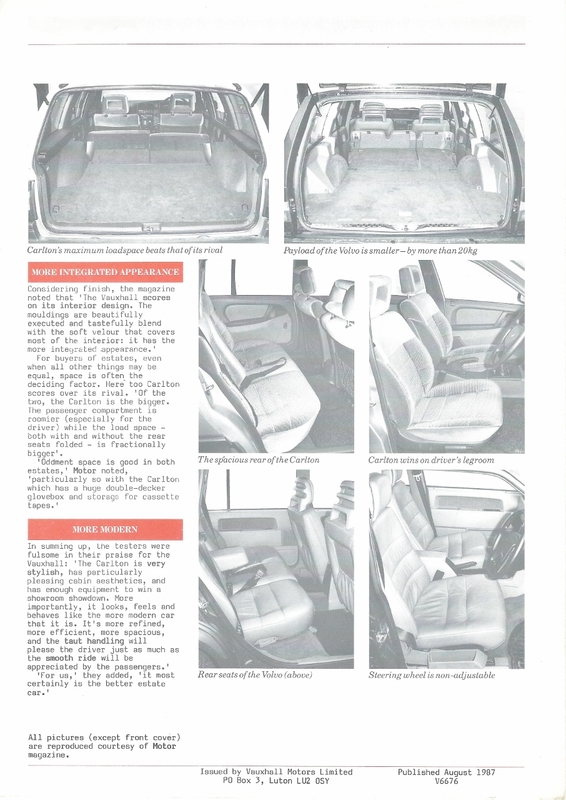 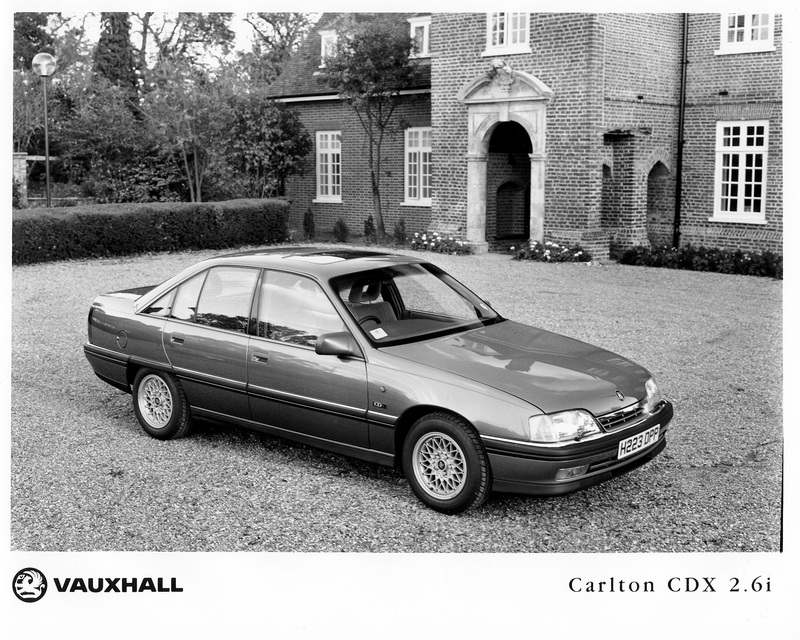 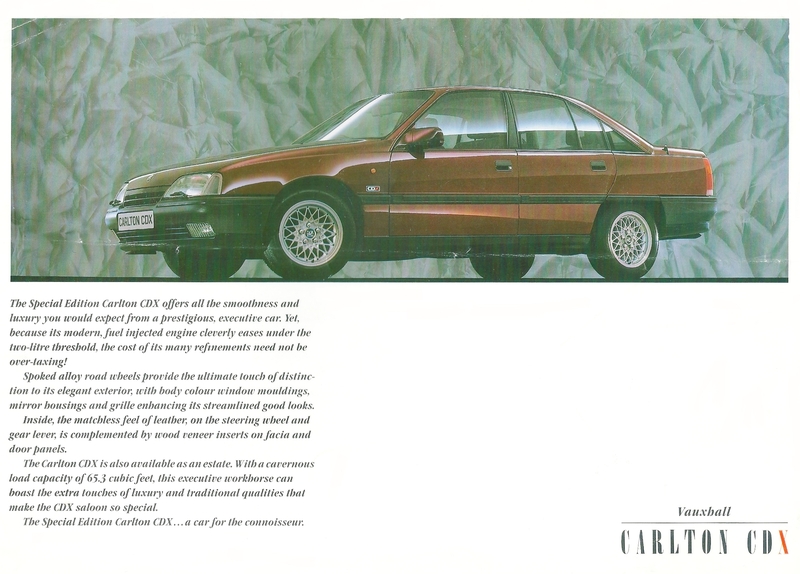 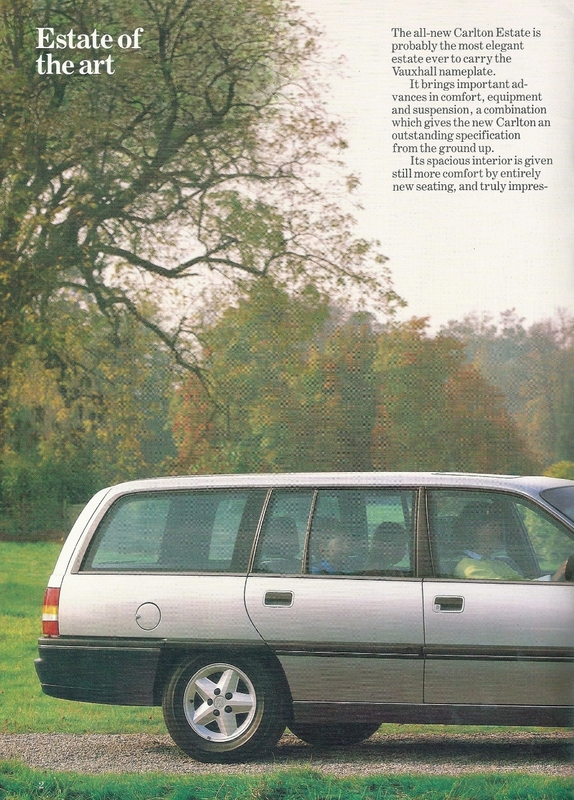 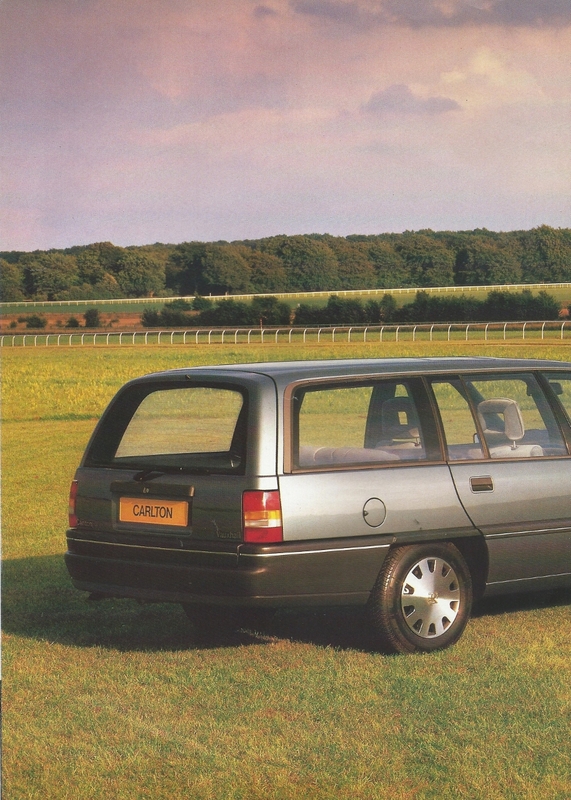 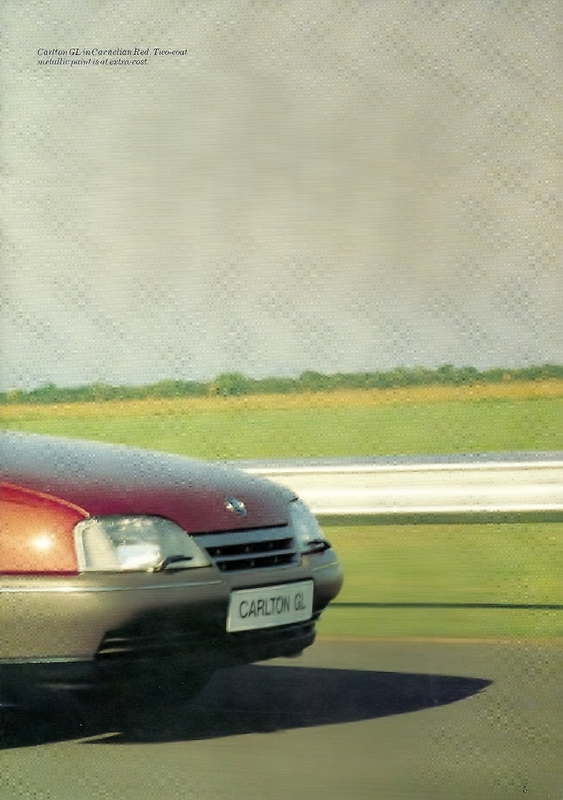 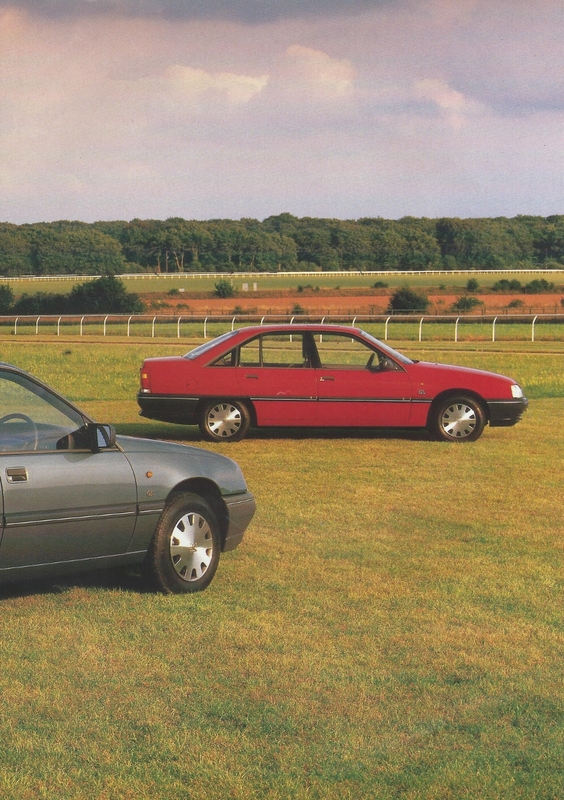 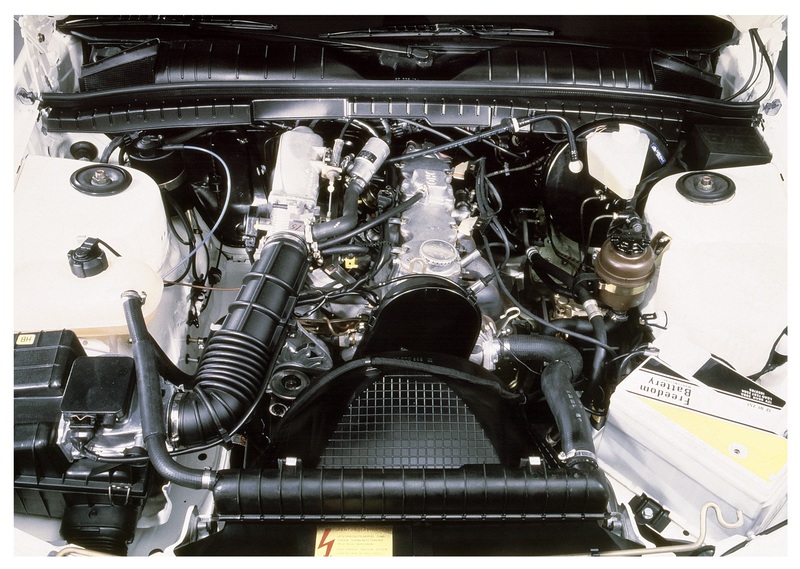 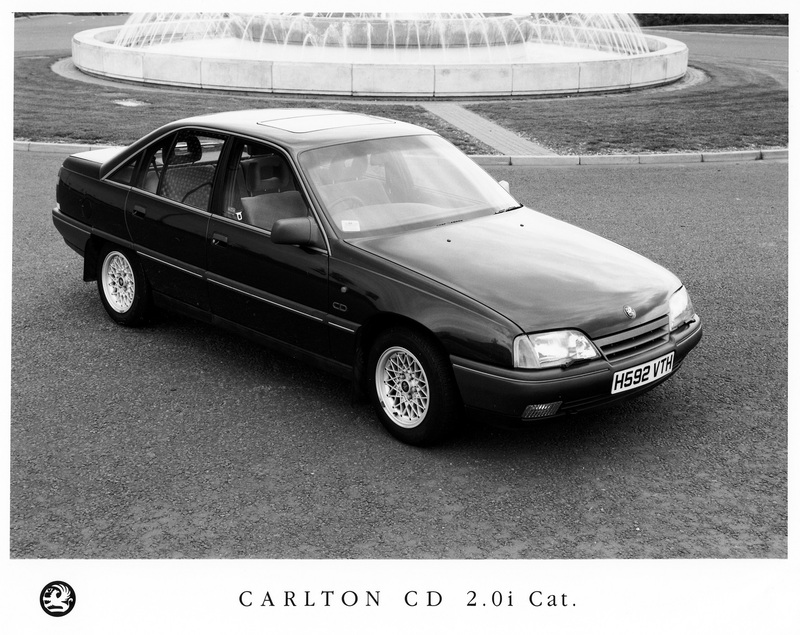 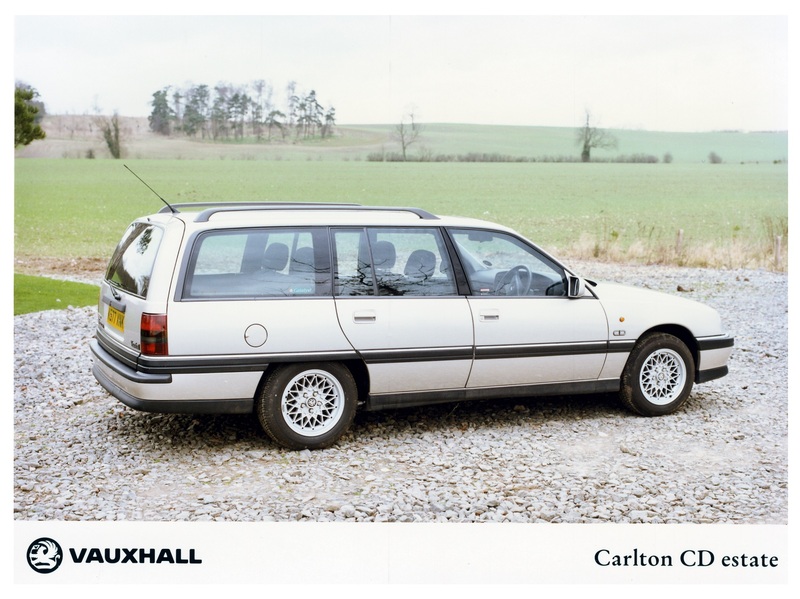 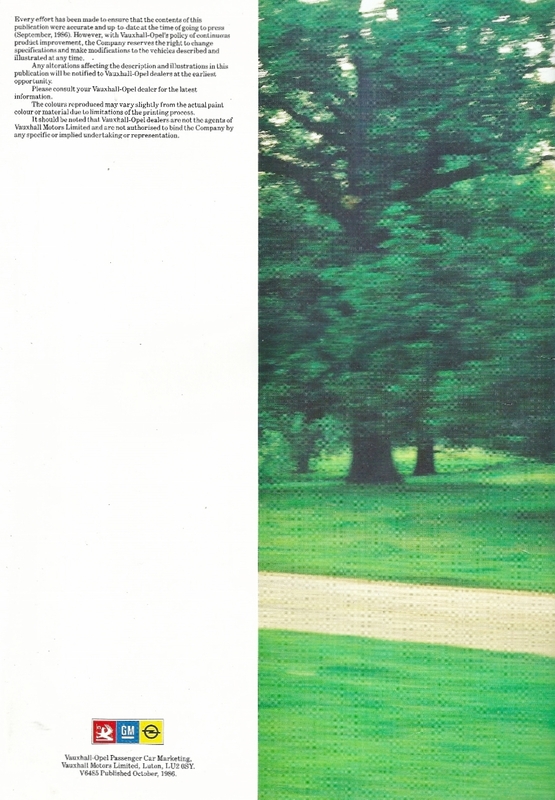 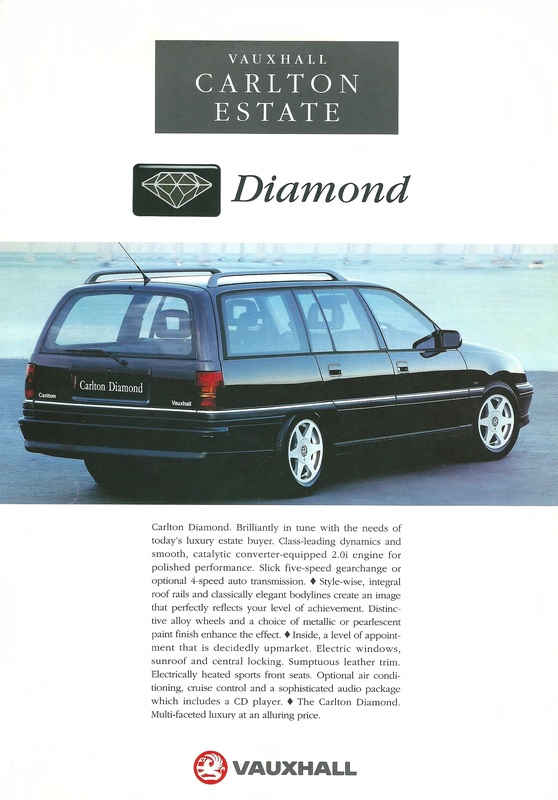 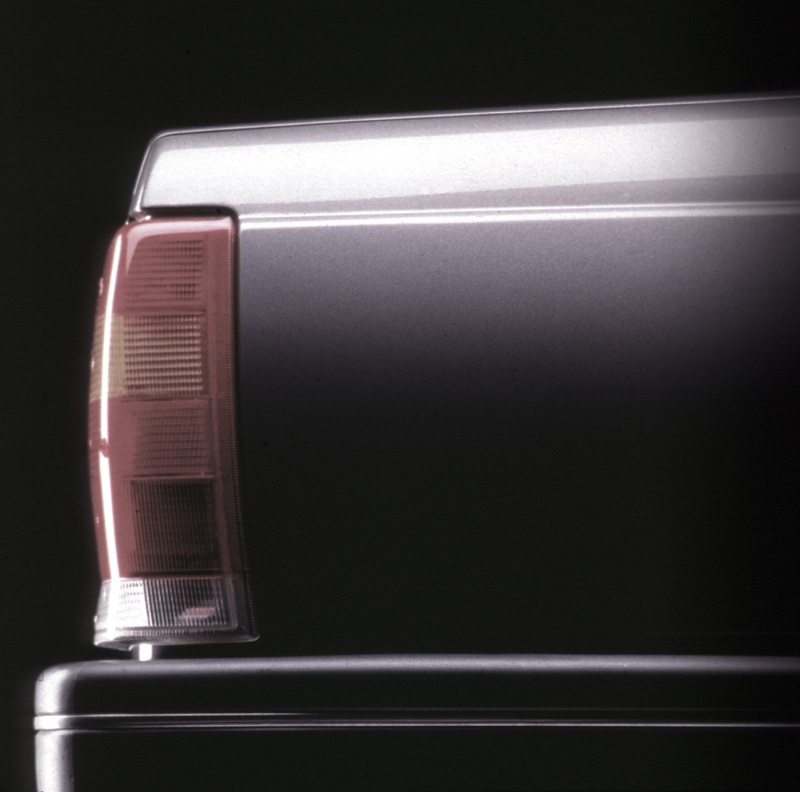 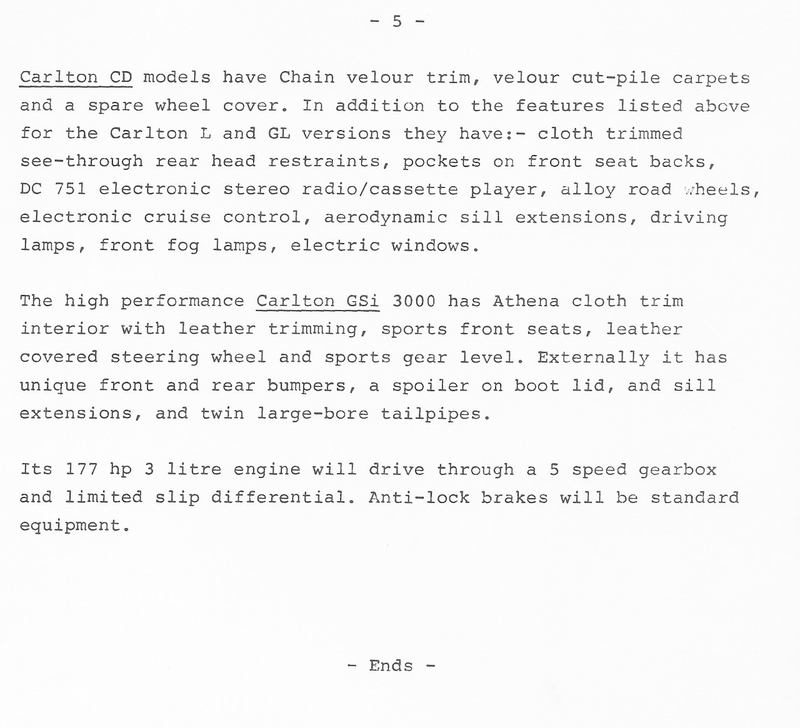 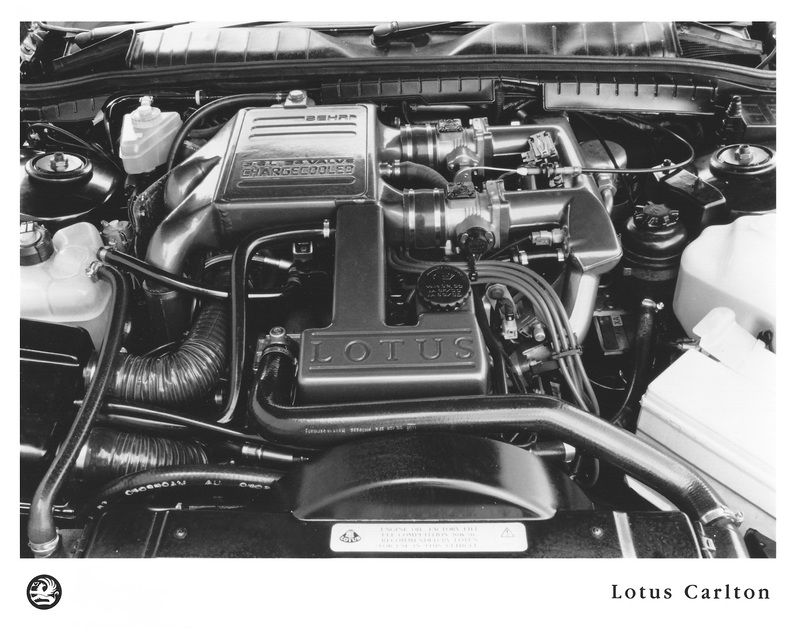 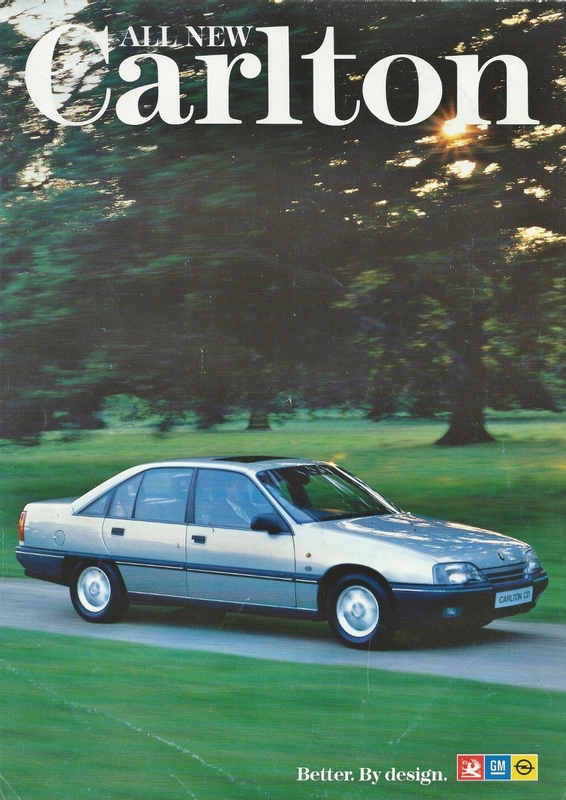 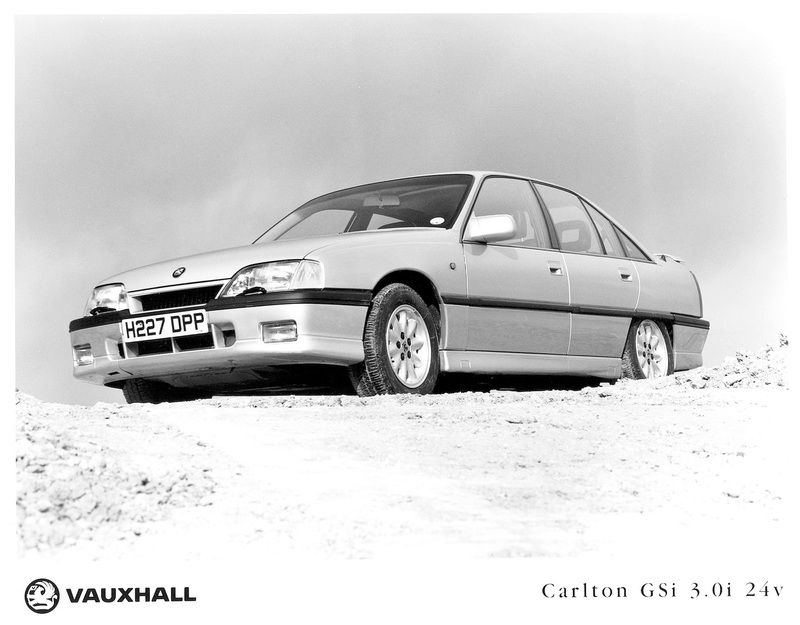 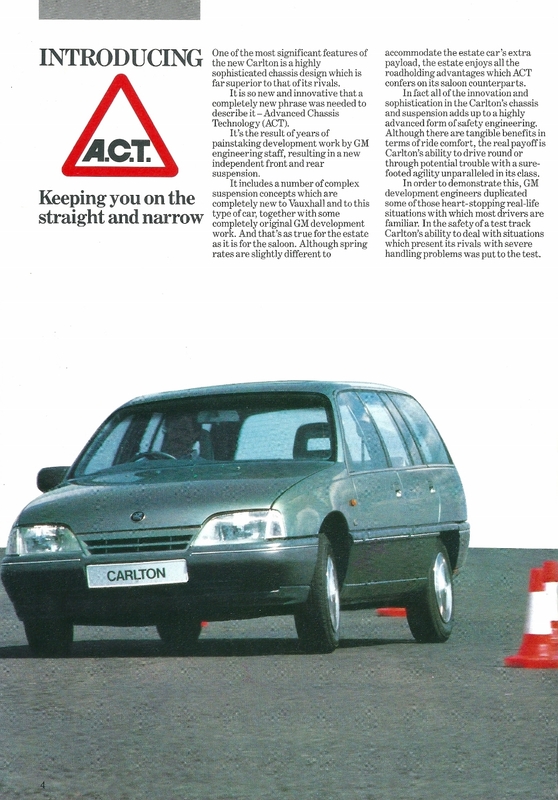 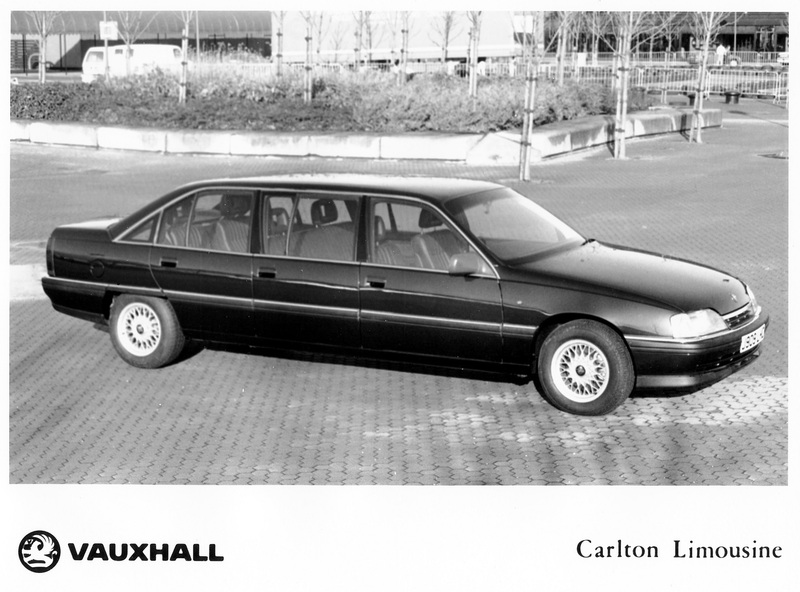 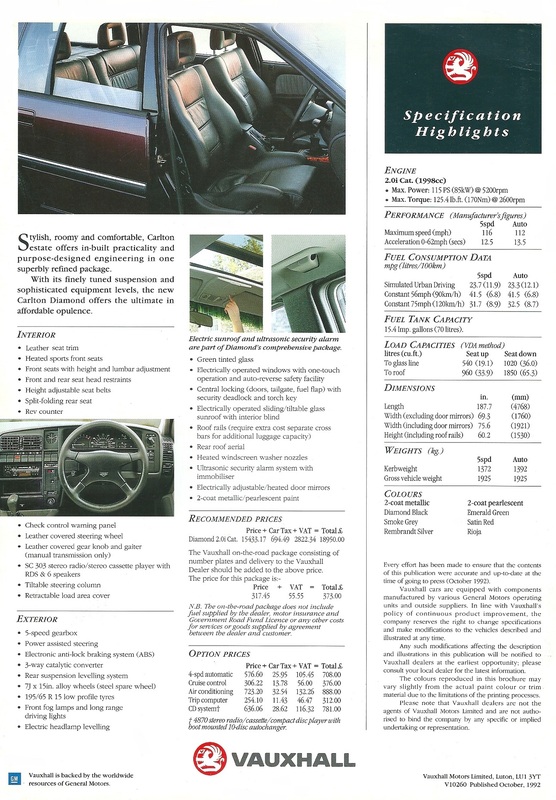 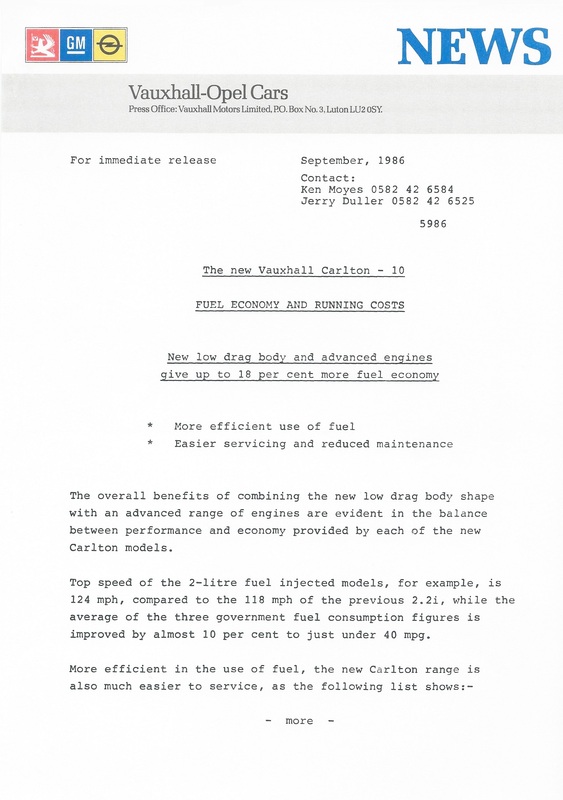 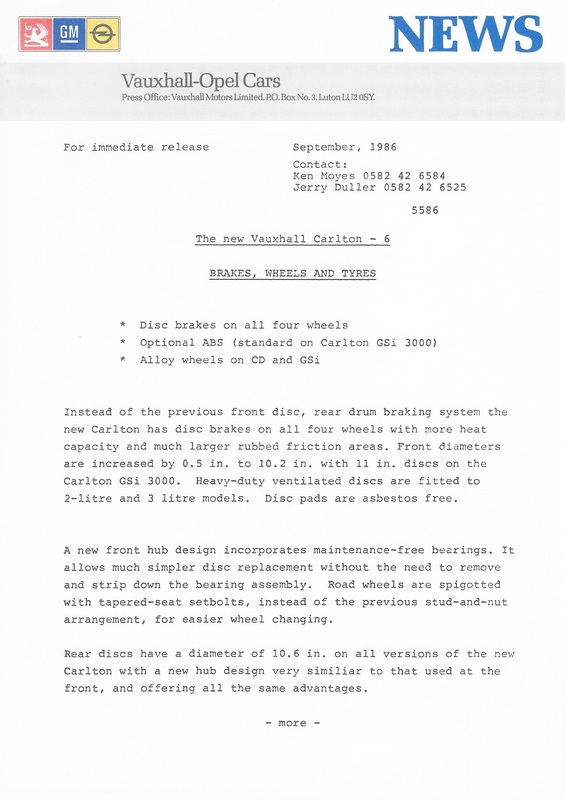 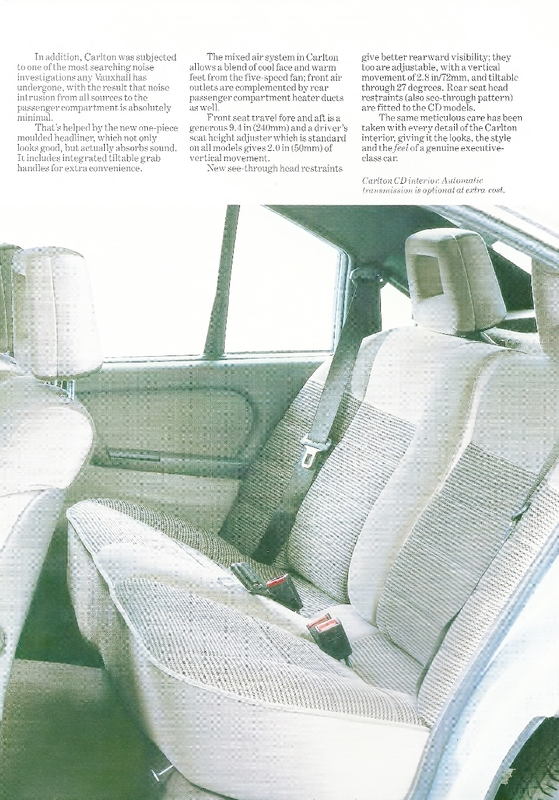 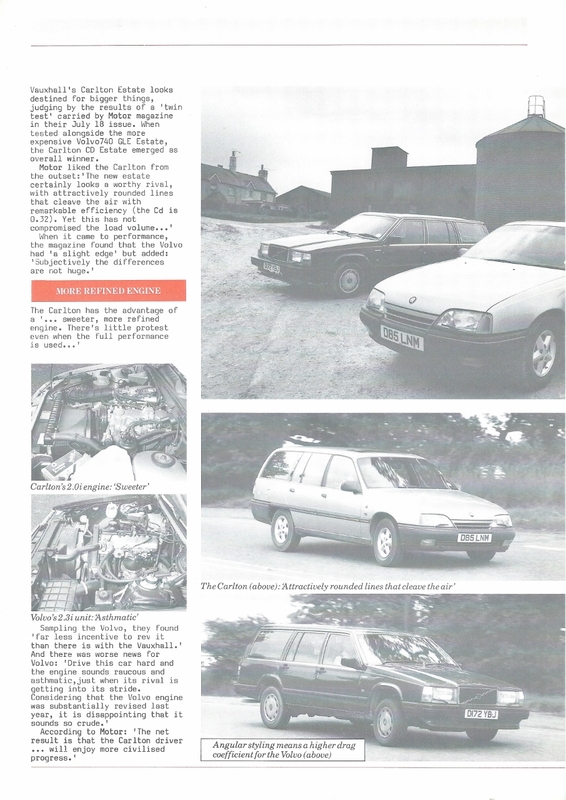 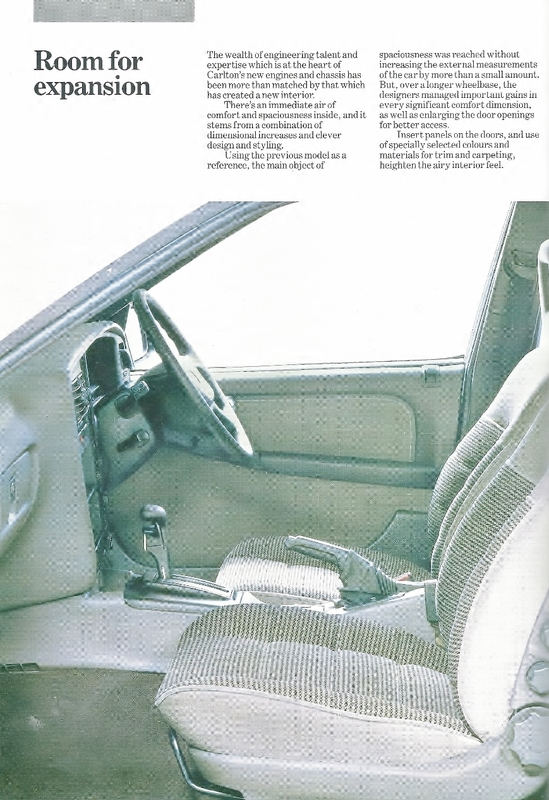 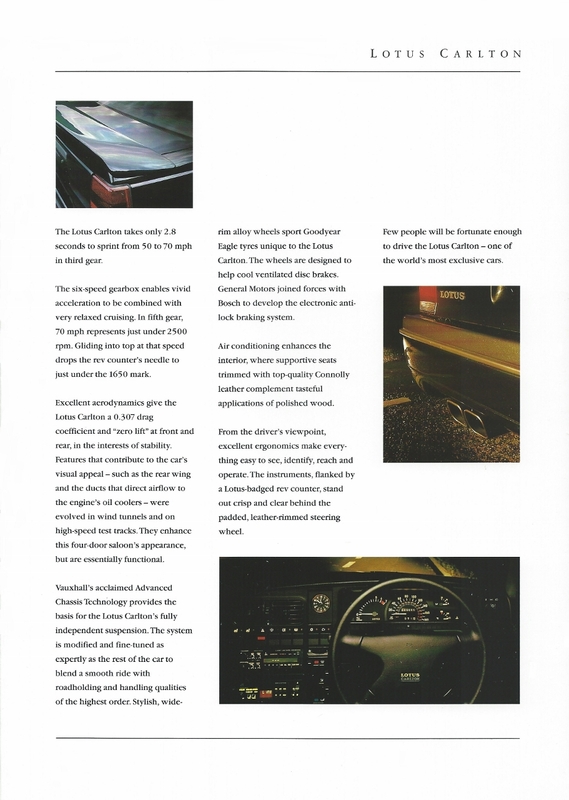 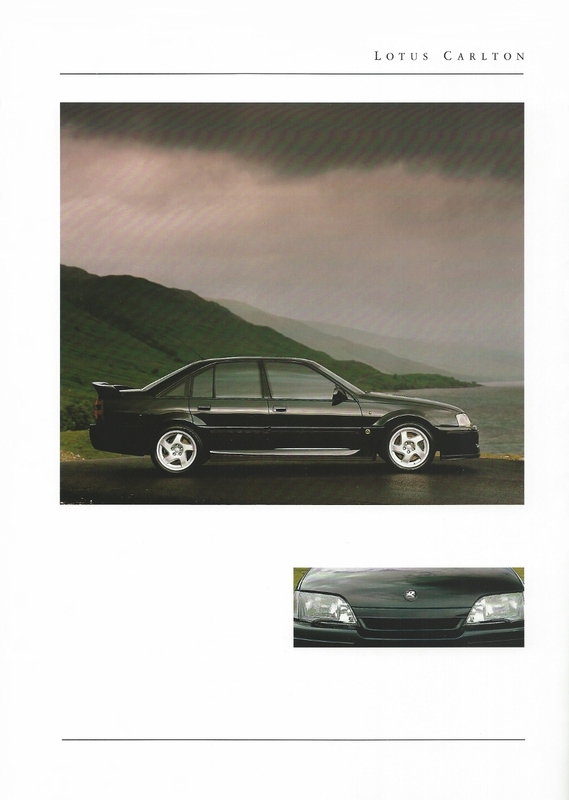 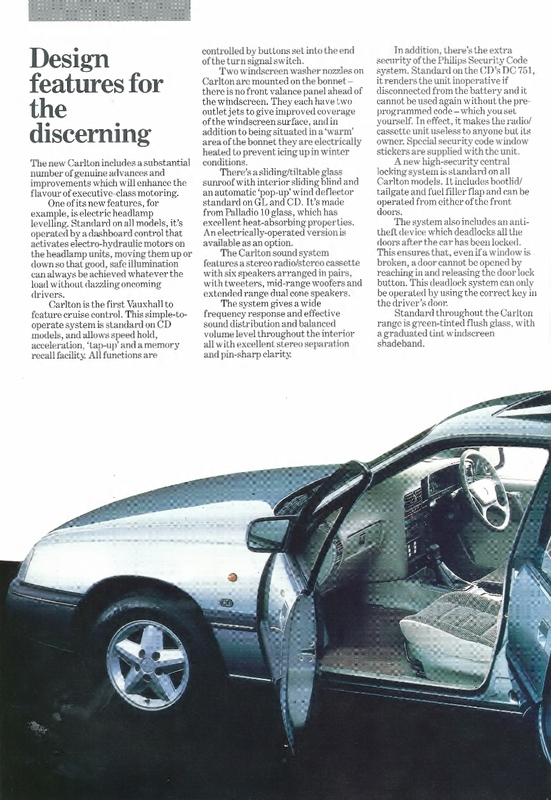 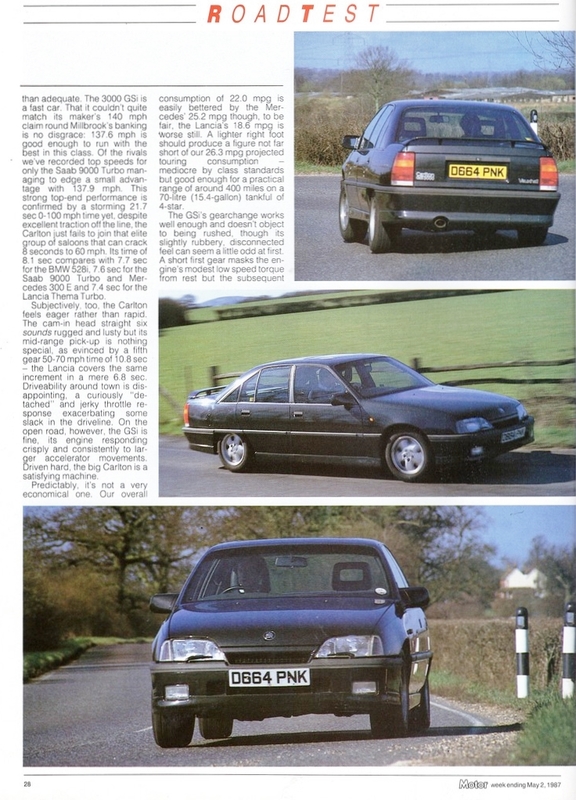 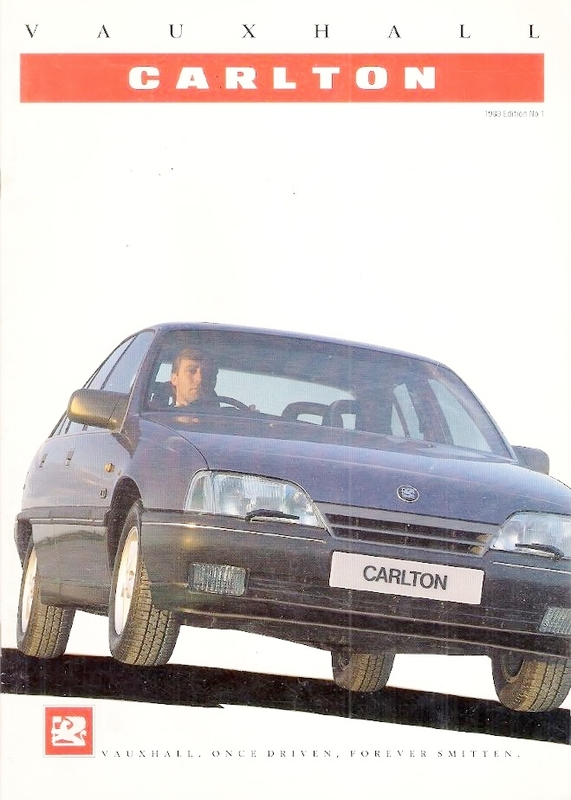 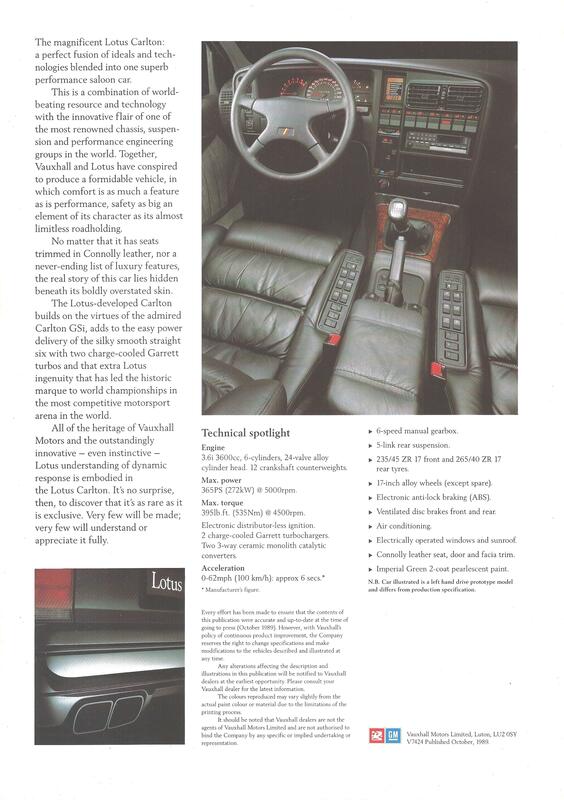 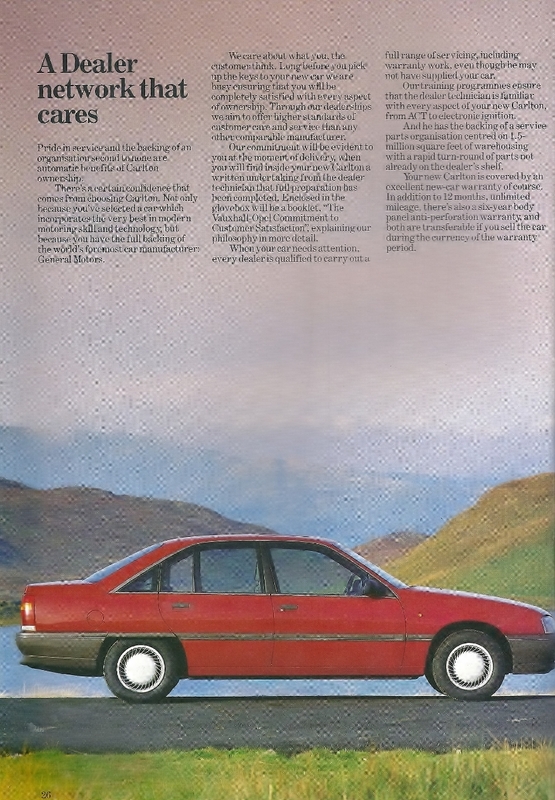 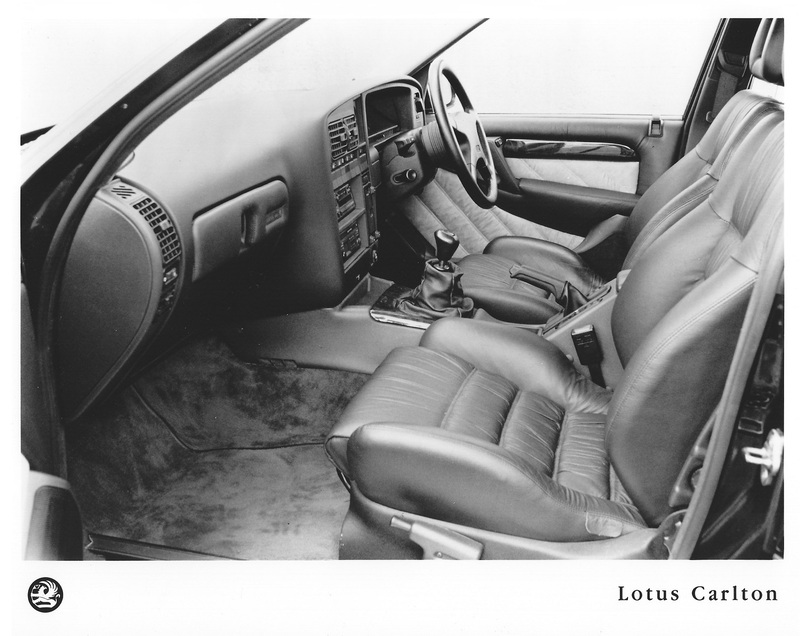 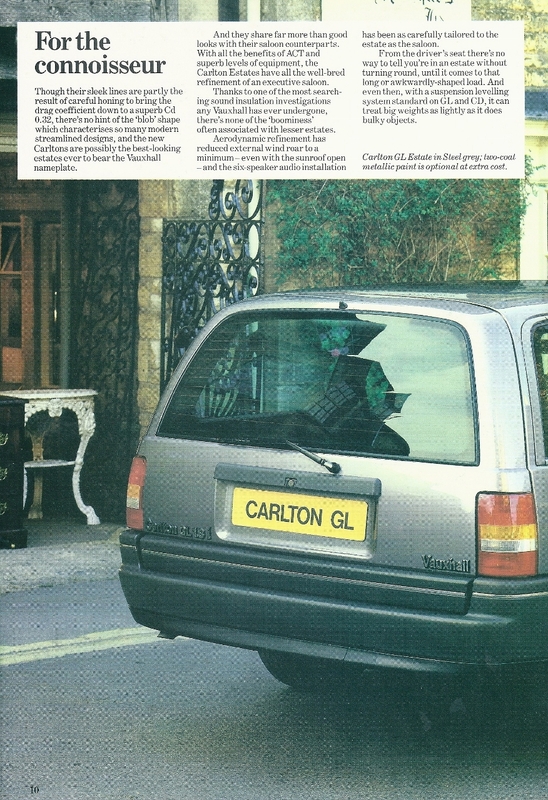 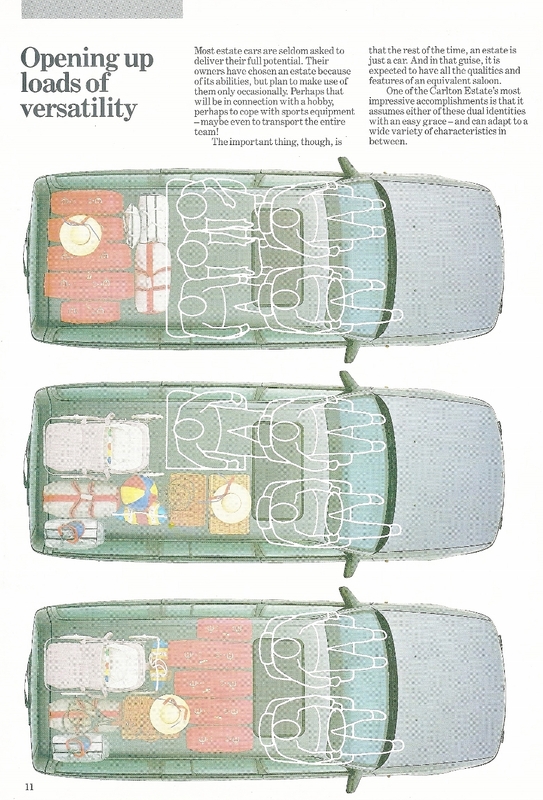 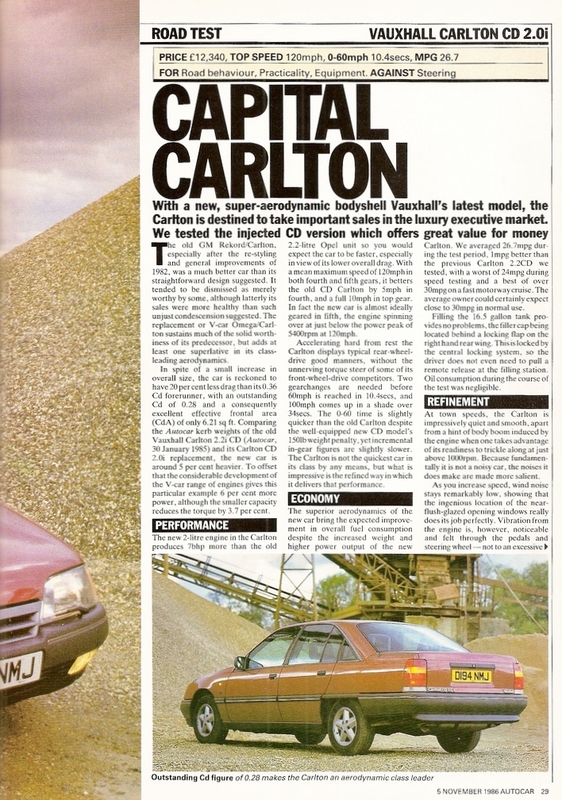 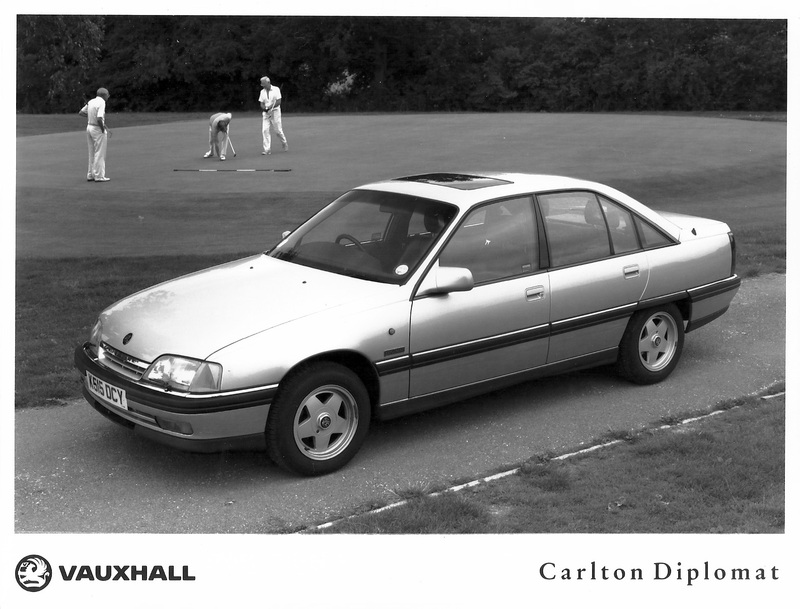 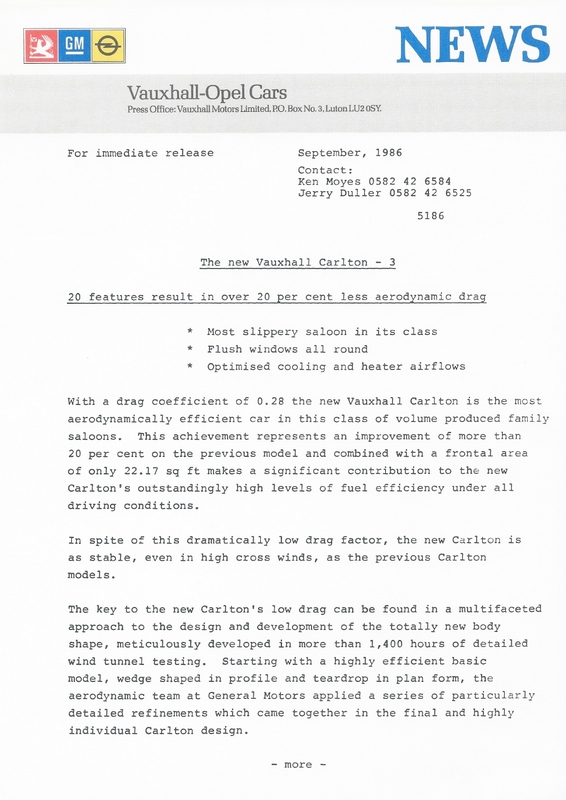 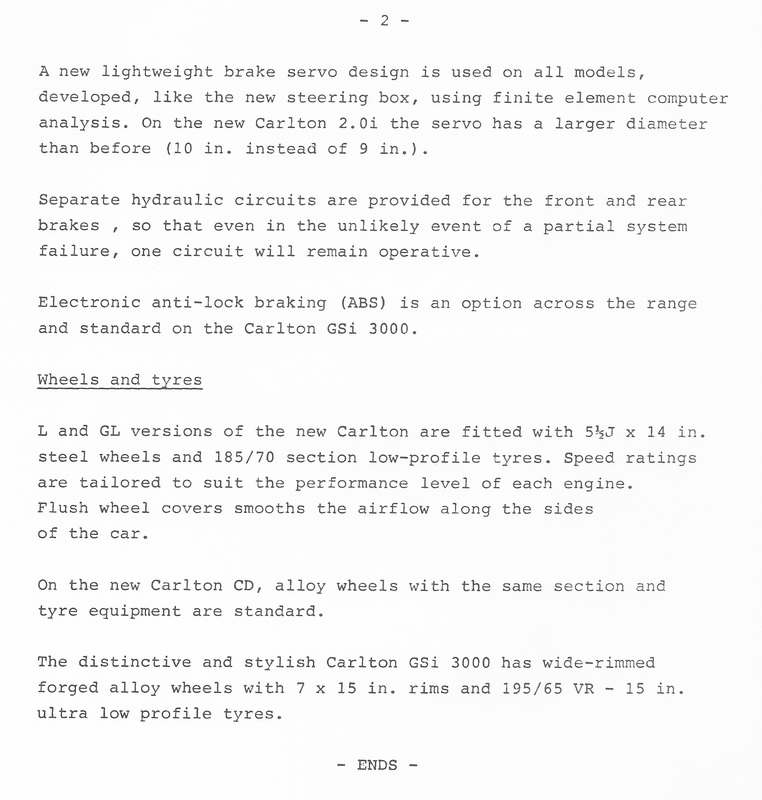 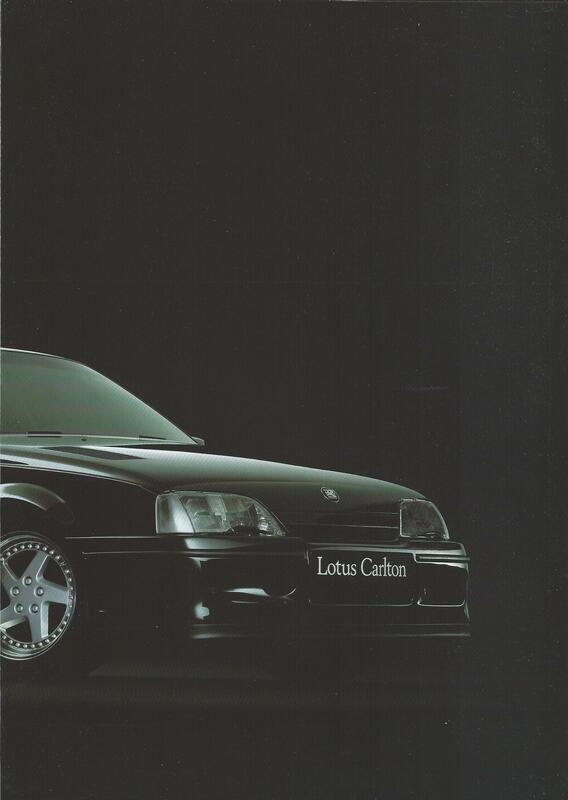 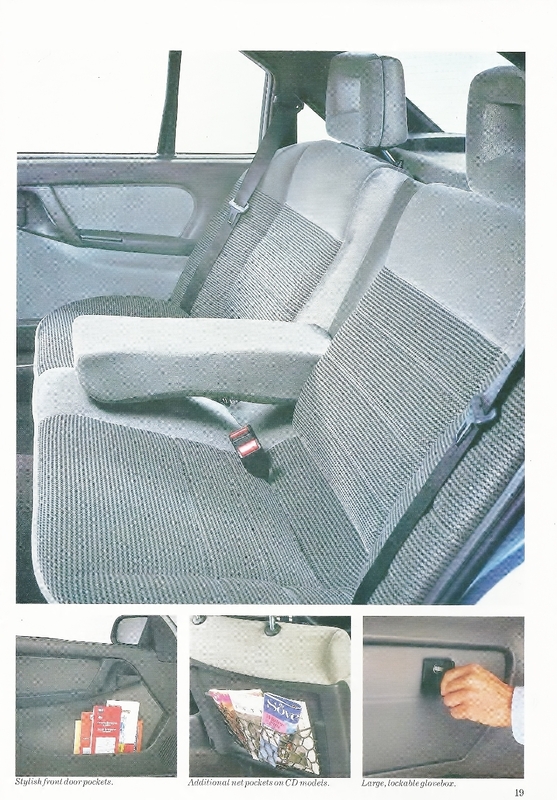 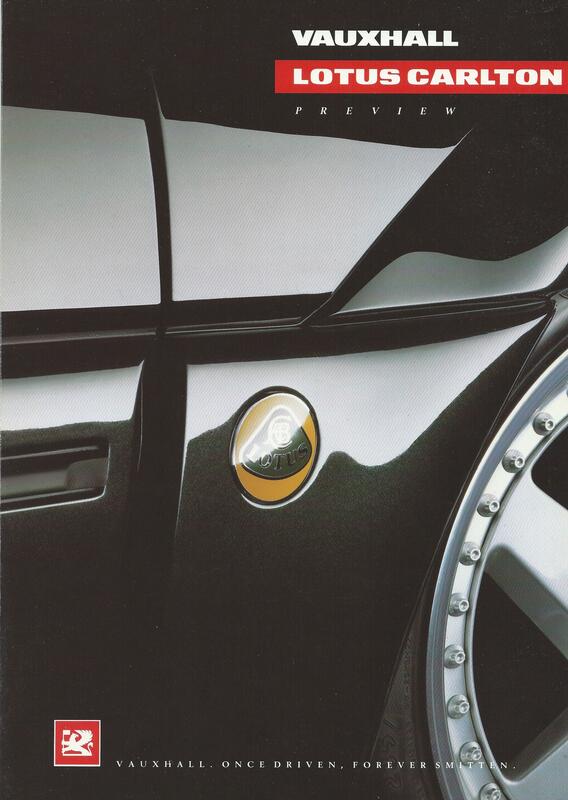 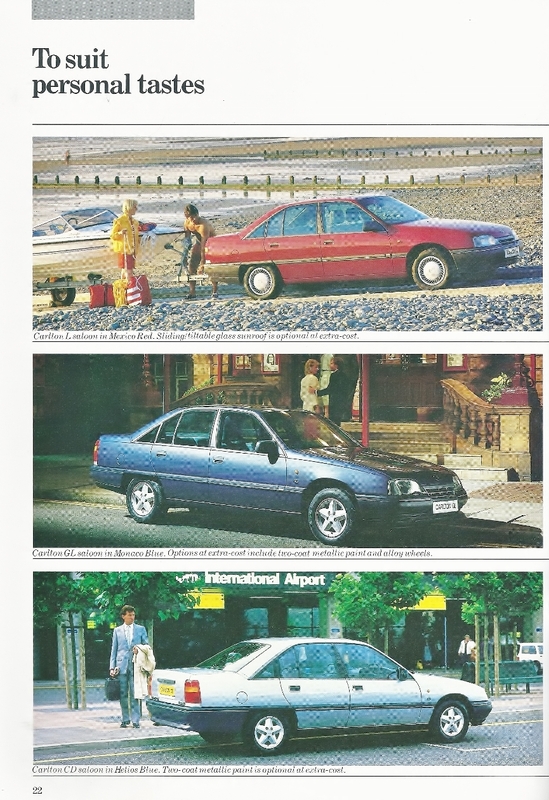 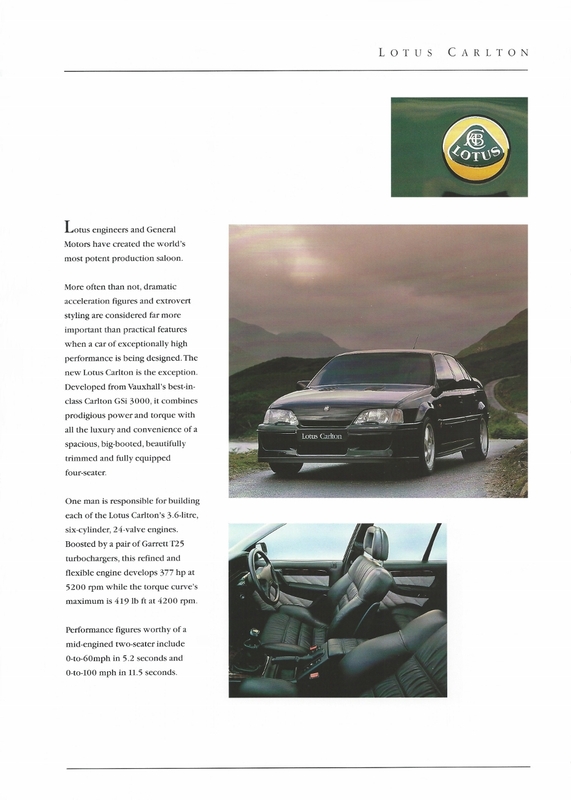 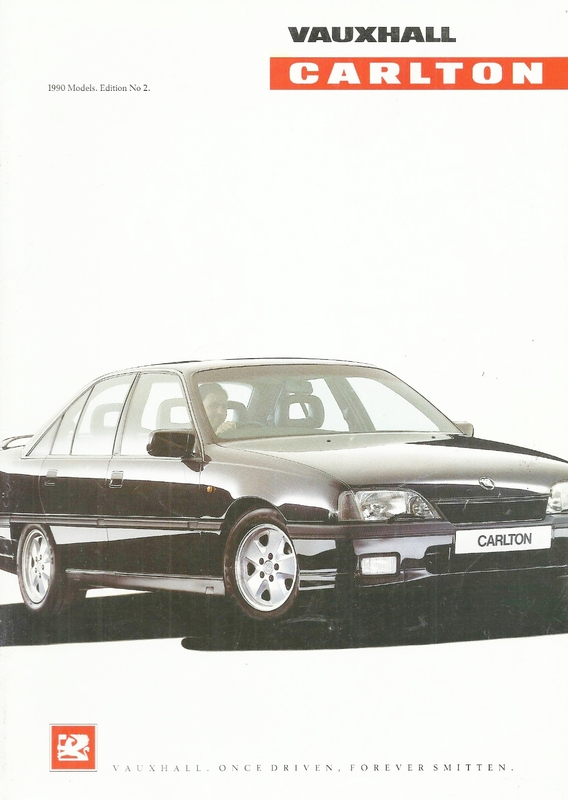 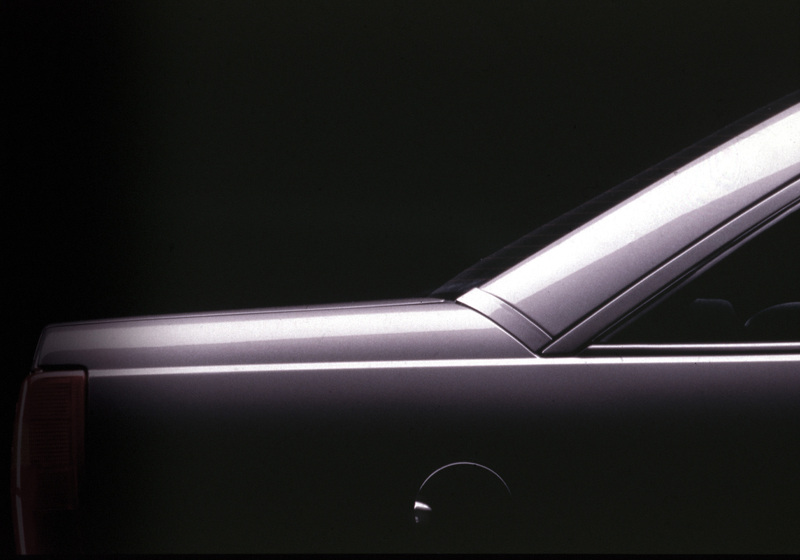 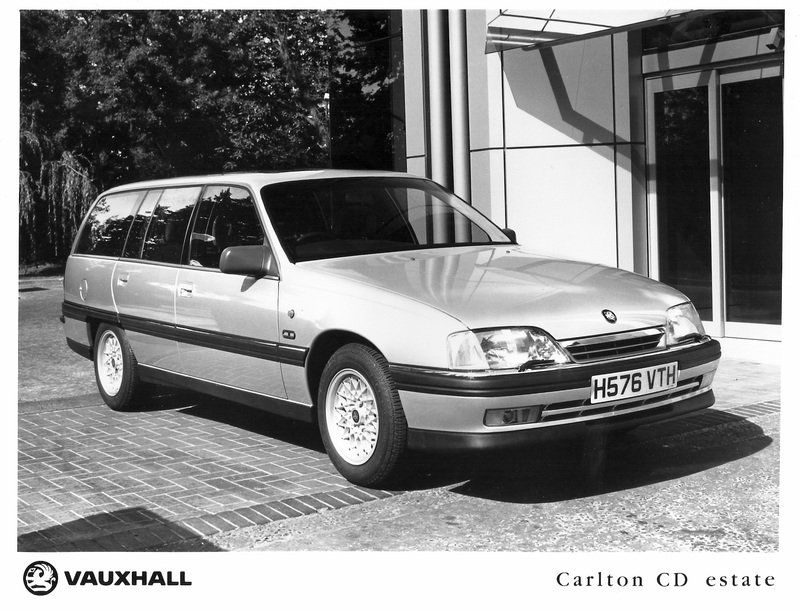 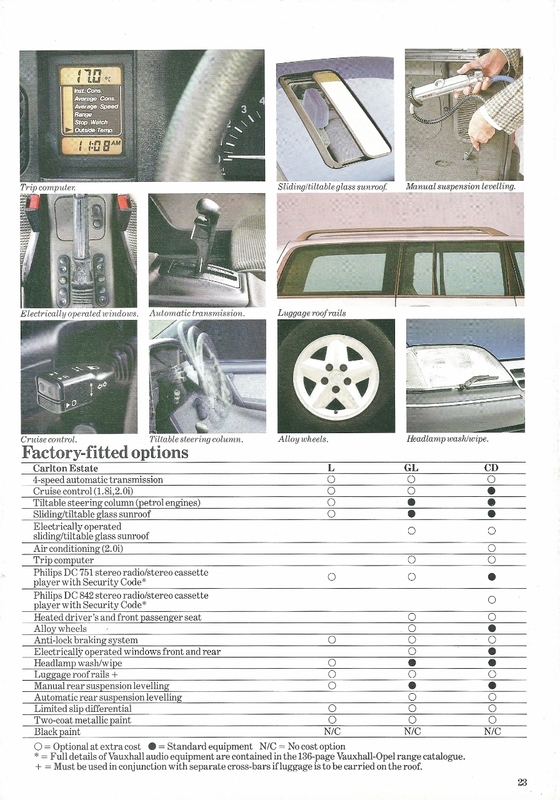 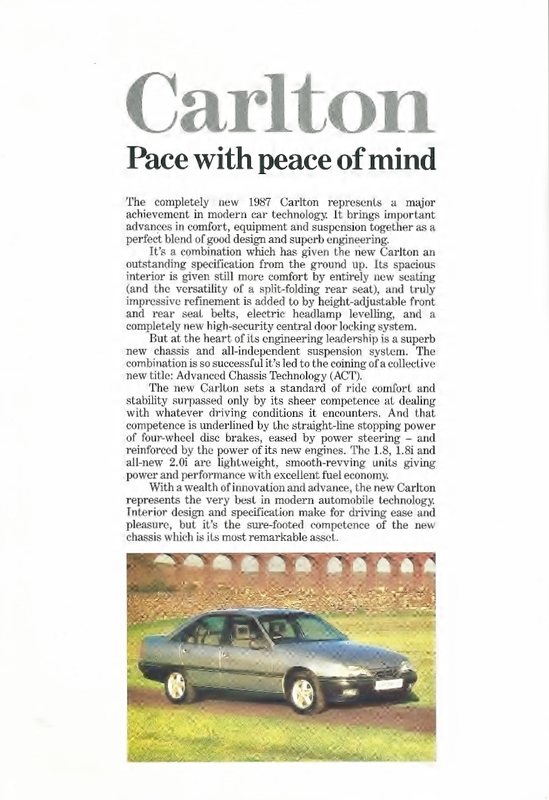 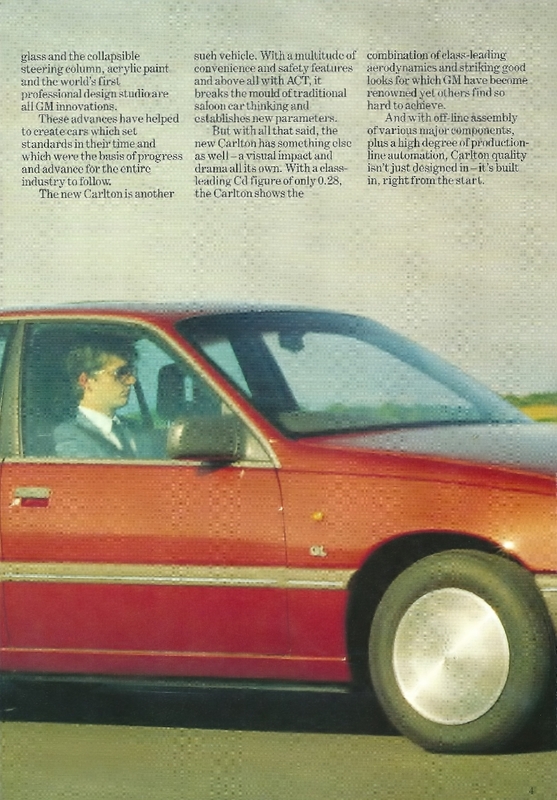 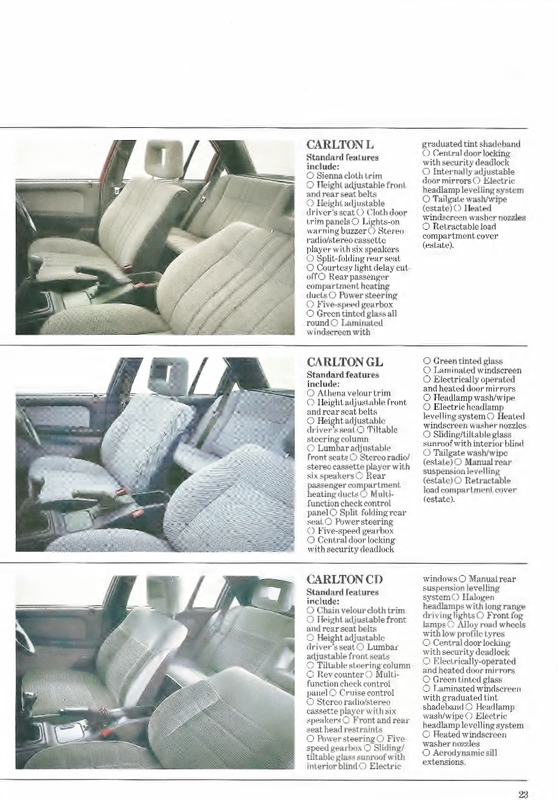 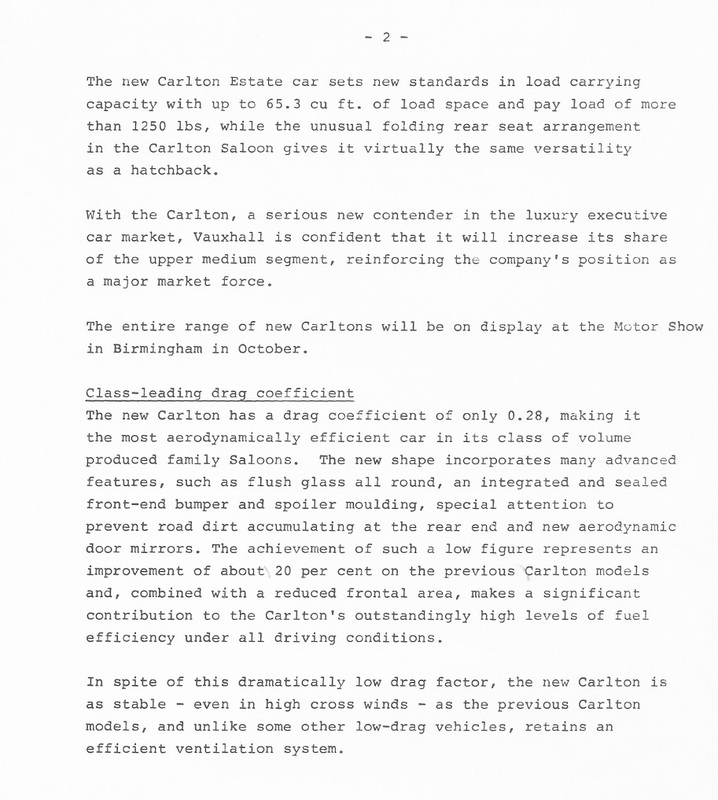 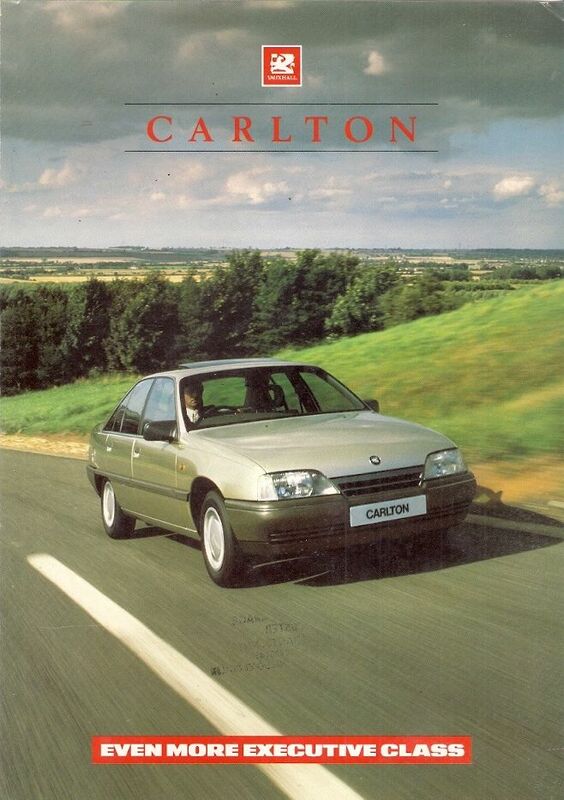 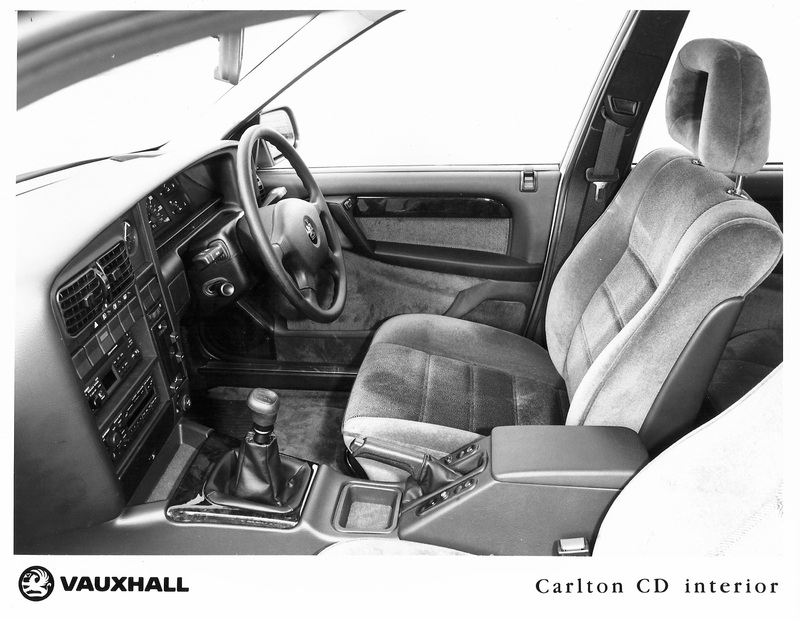 At launch the Carlton MK3 was available in 3 trim levels – L, GL & CD and a little later GSi was added. 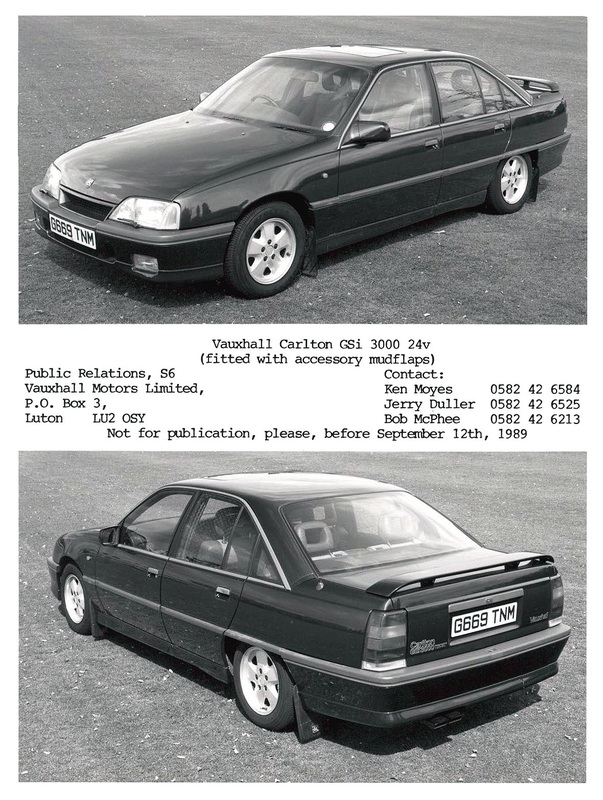 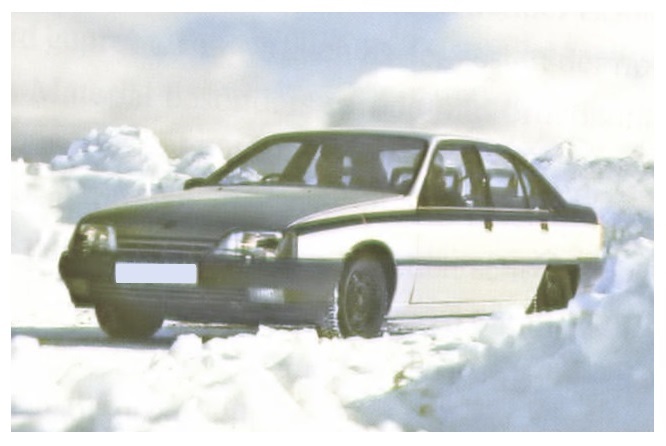 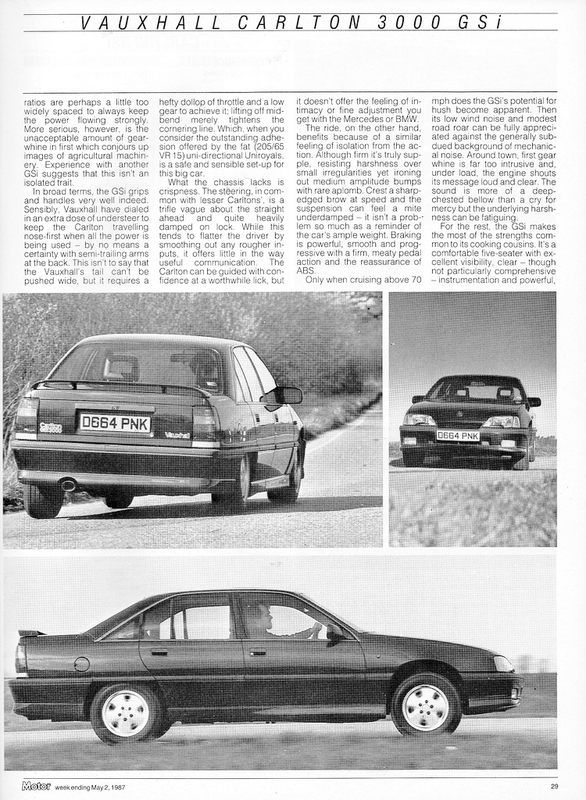 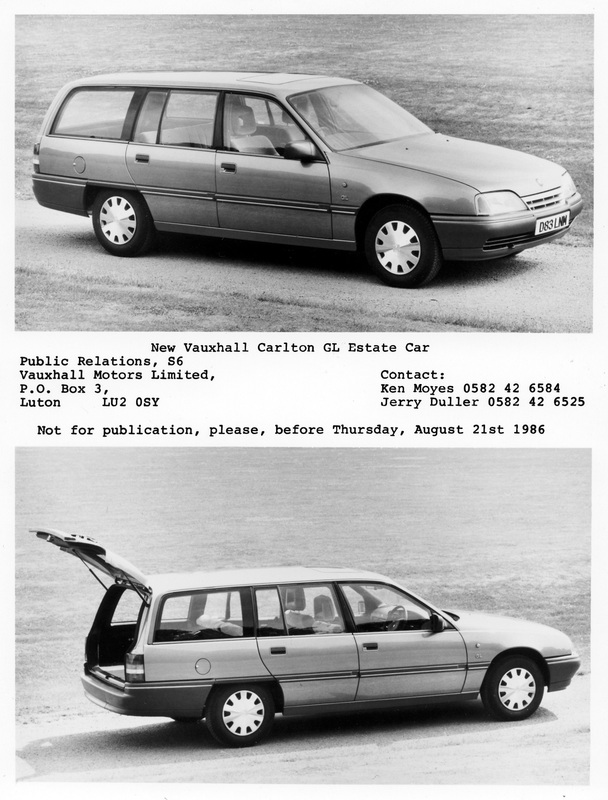 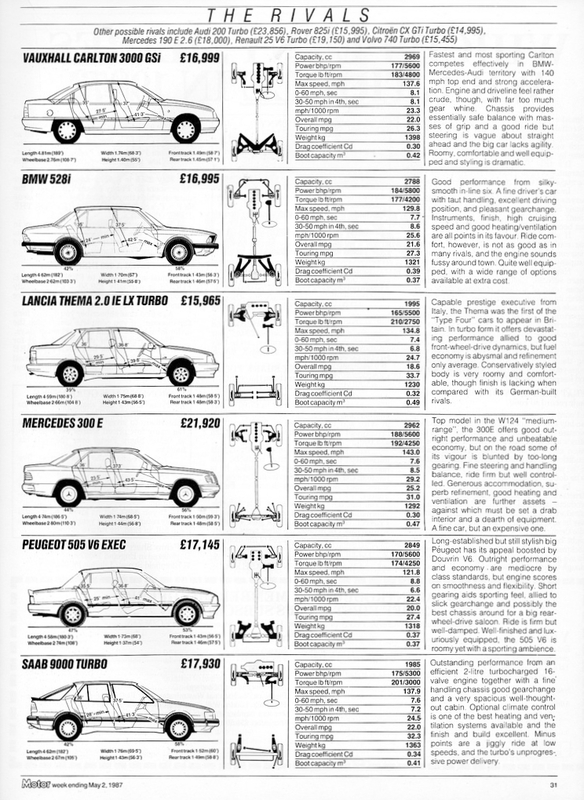 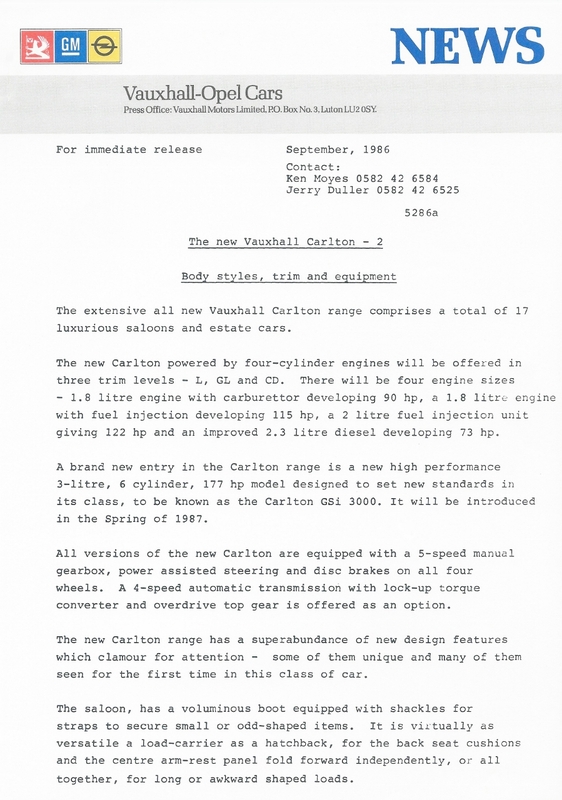 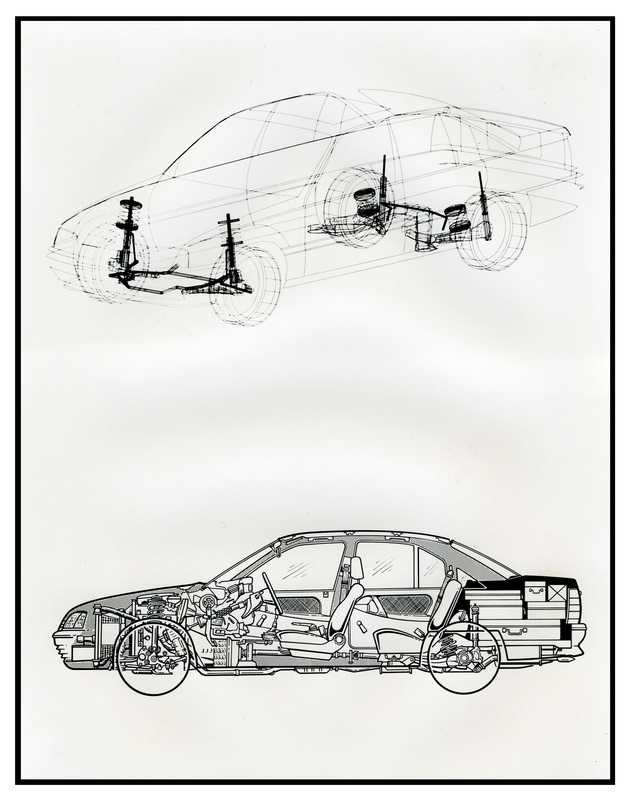 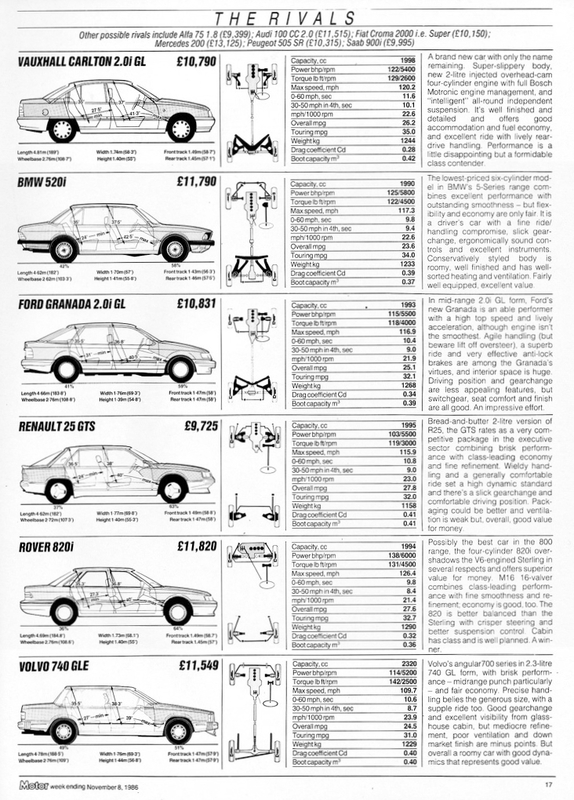 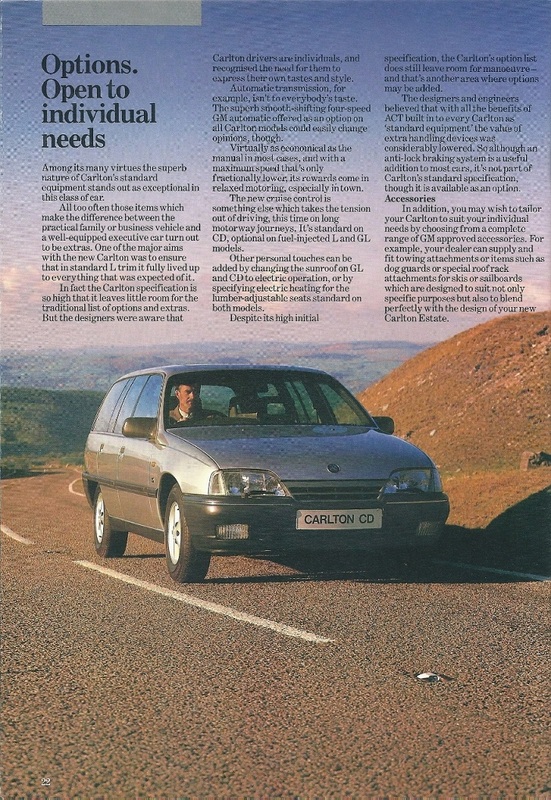 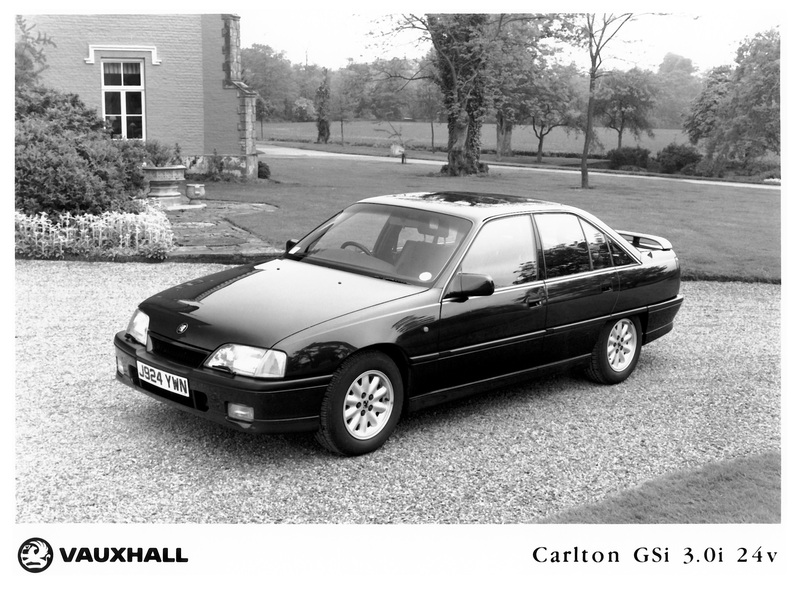 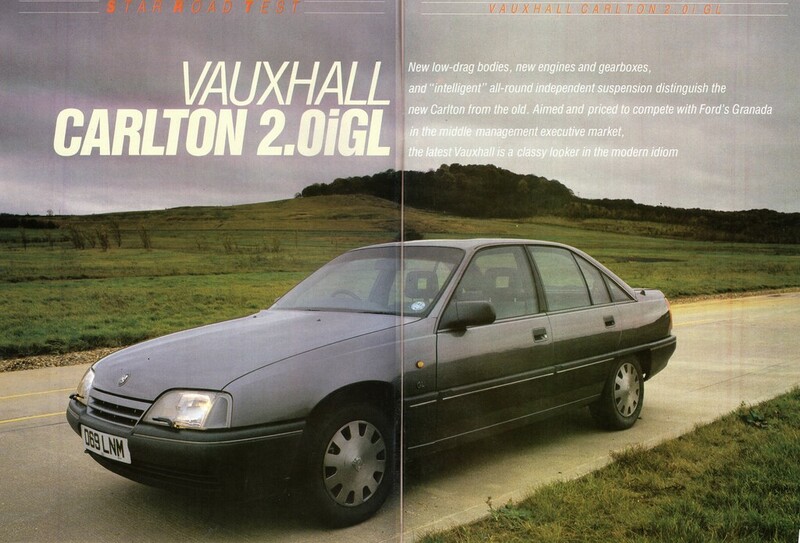 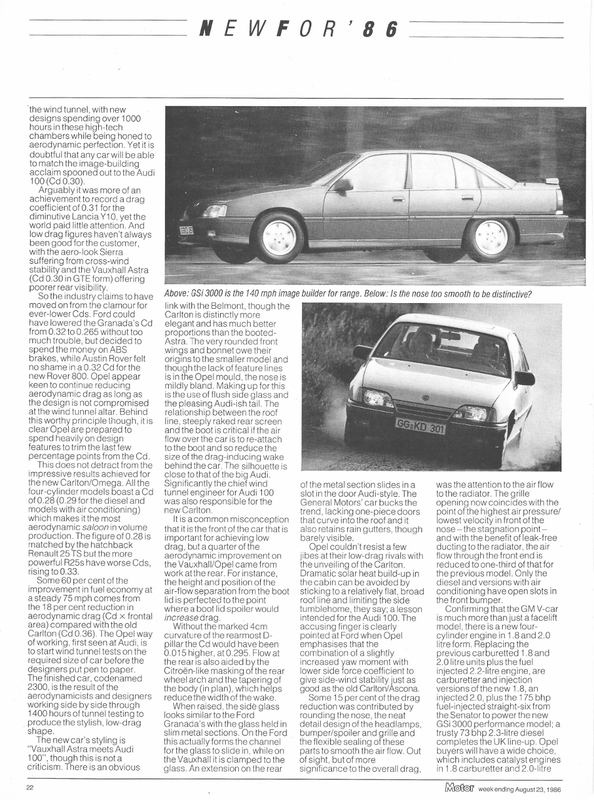 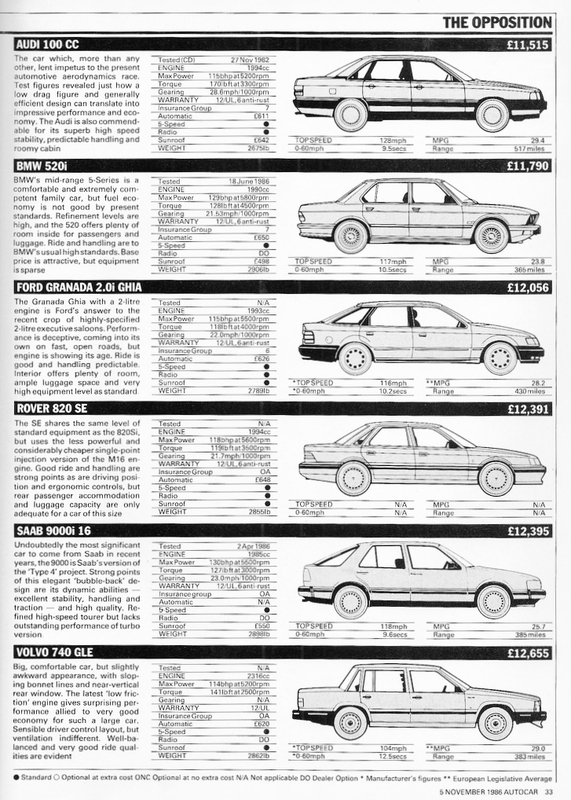 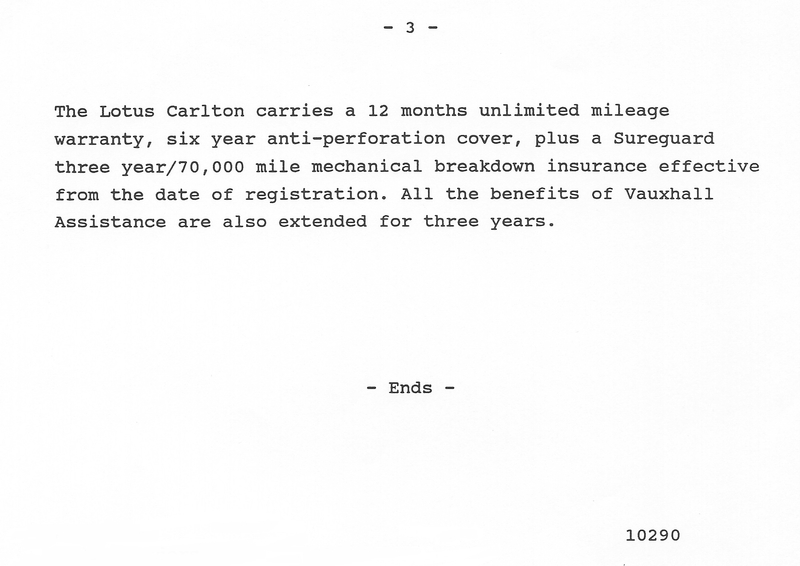 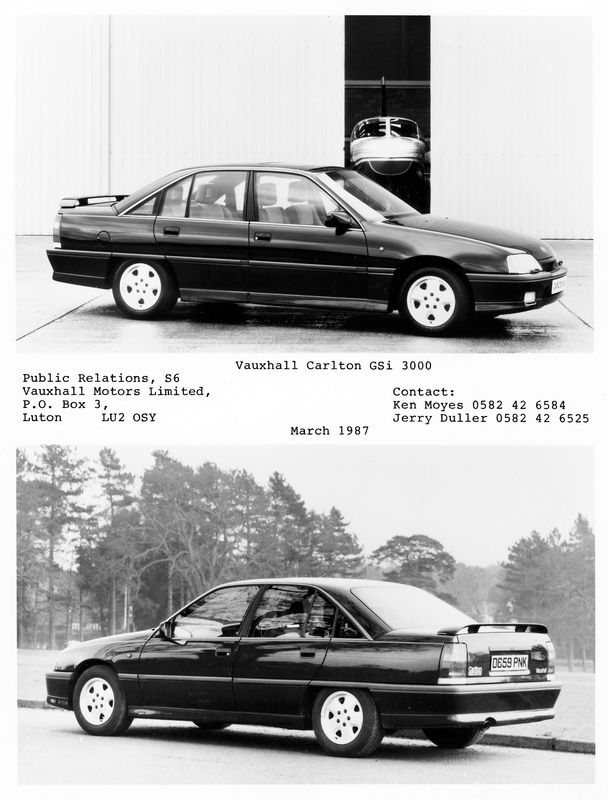 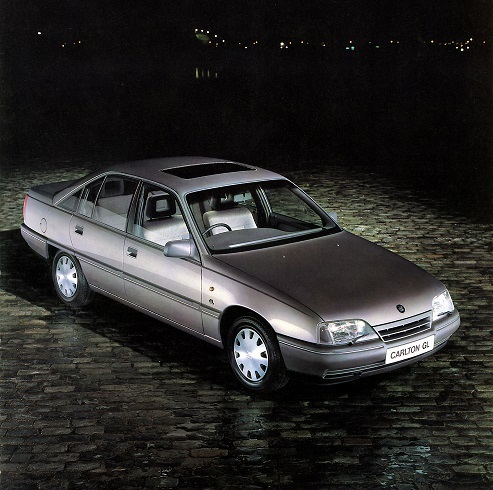 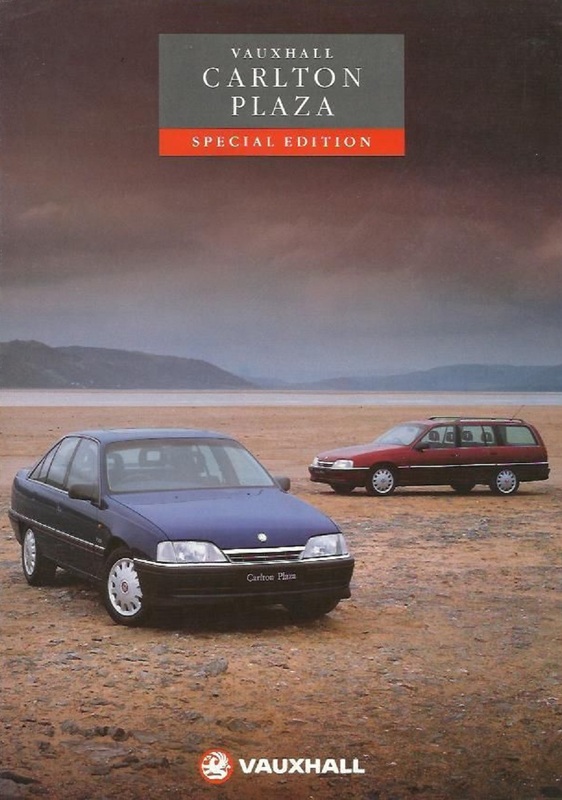 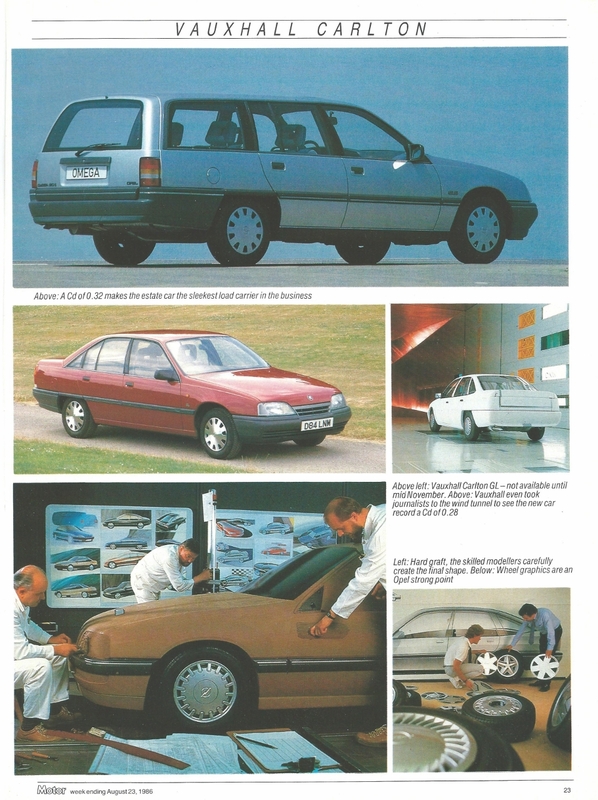 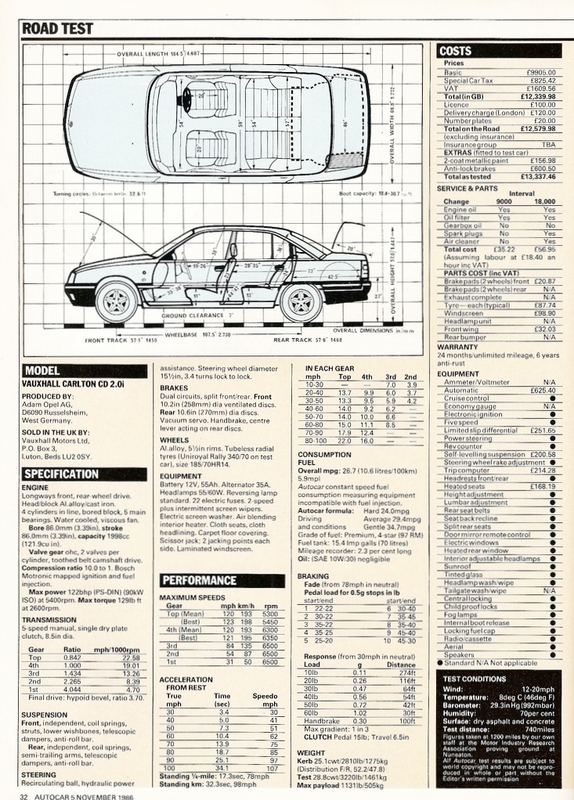 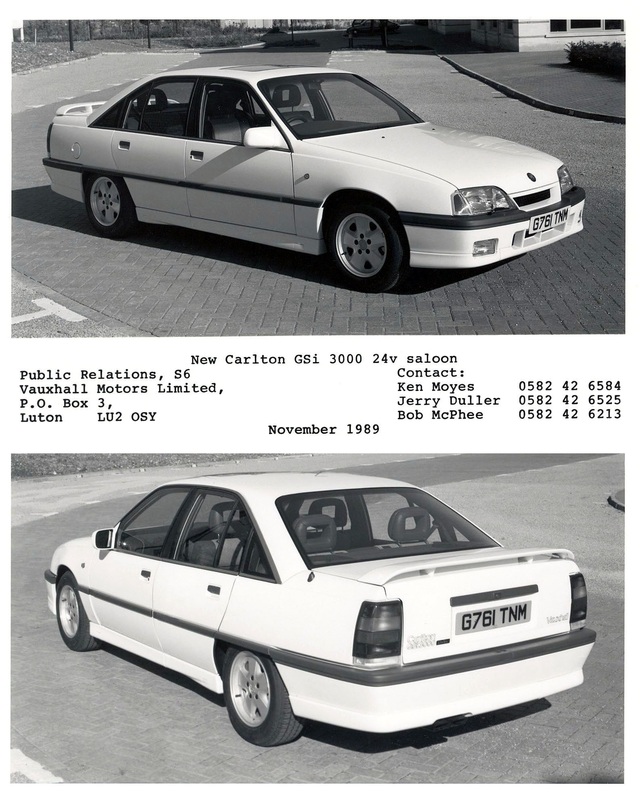 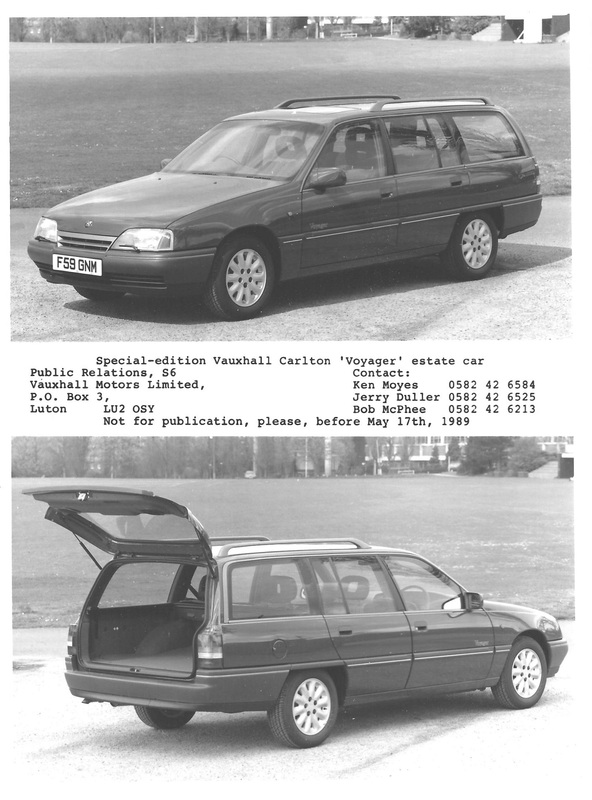 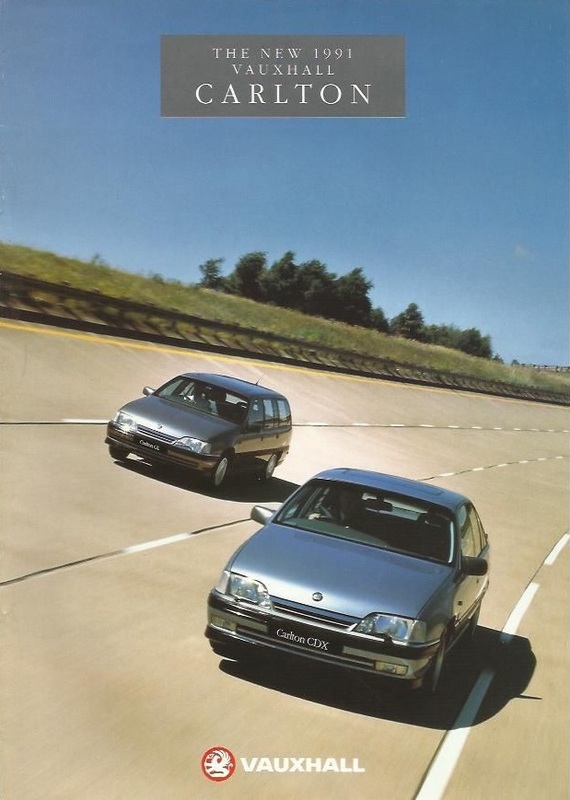 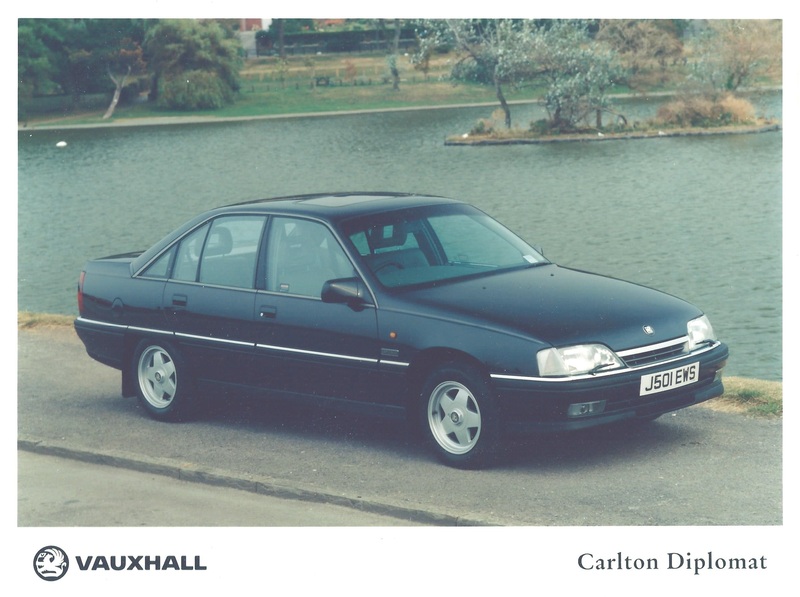 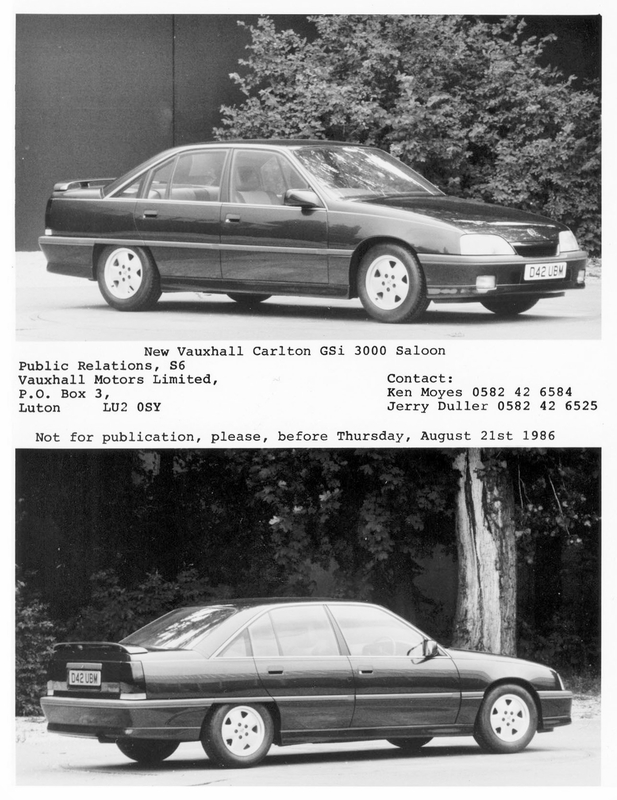 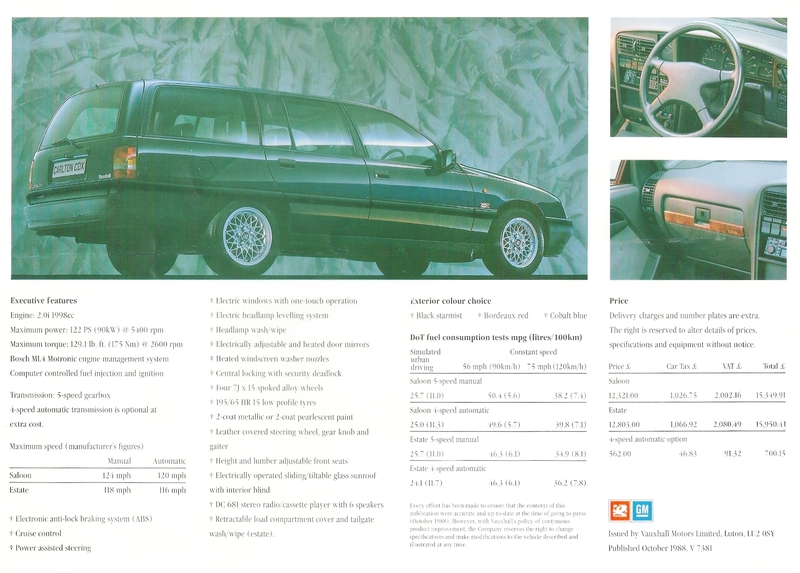 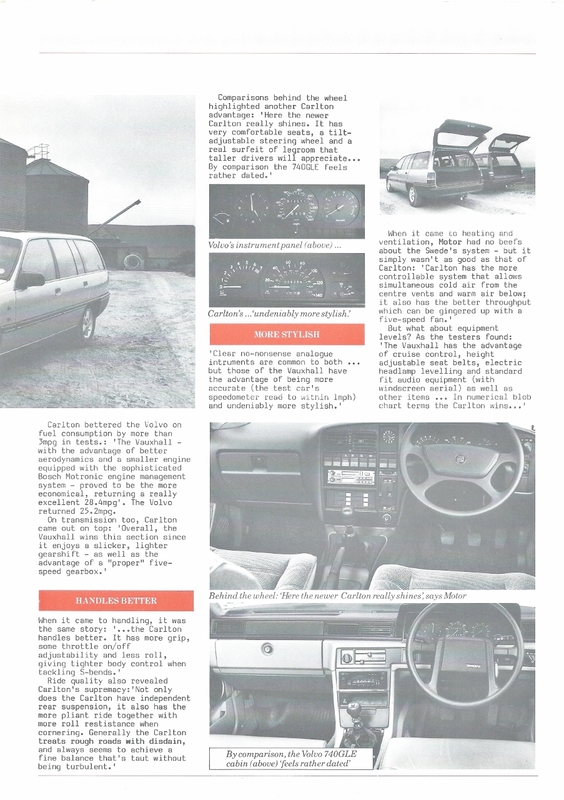 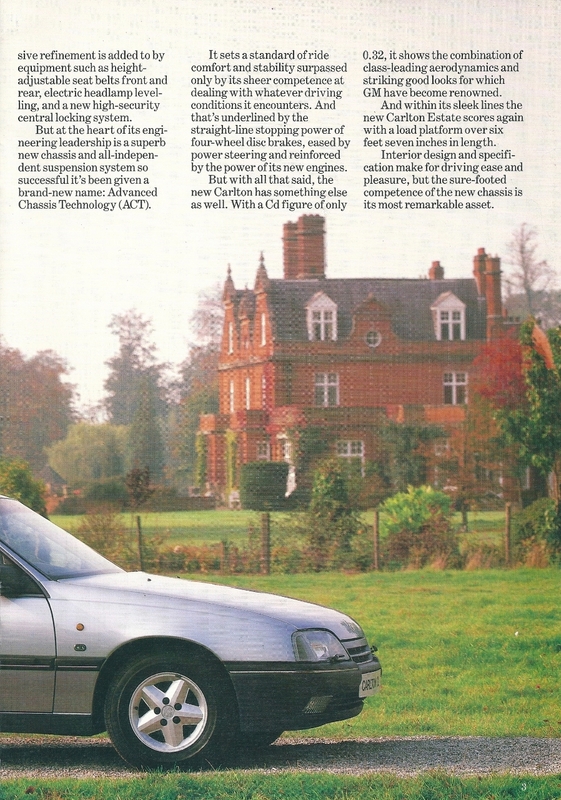 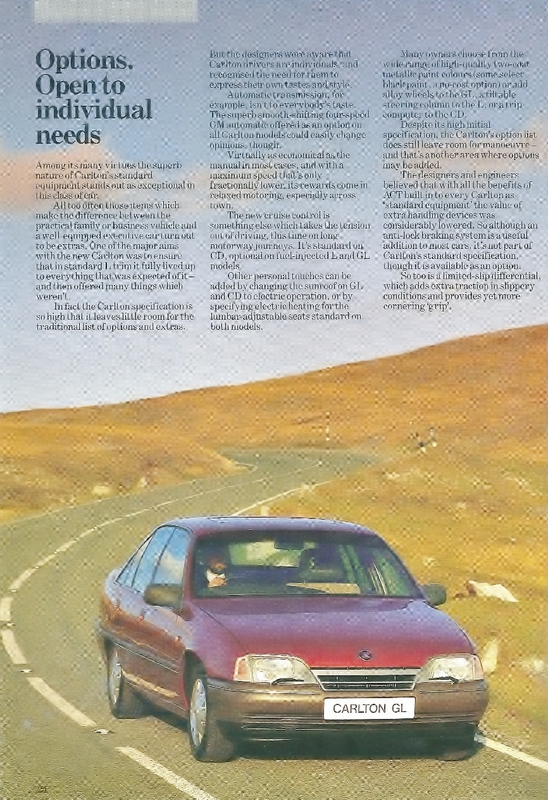 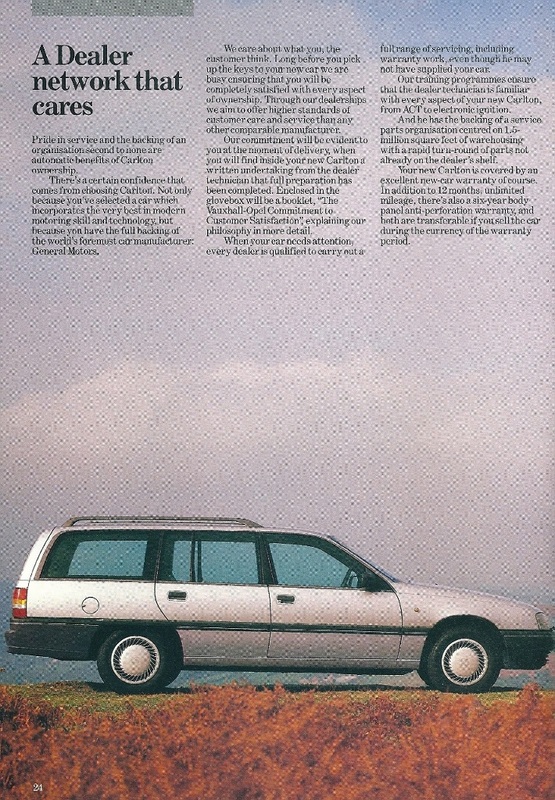 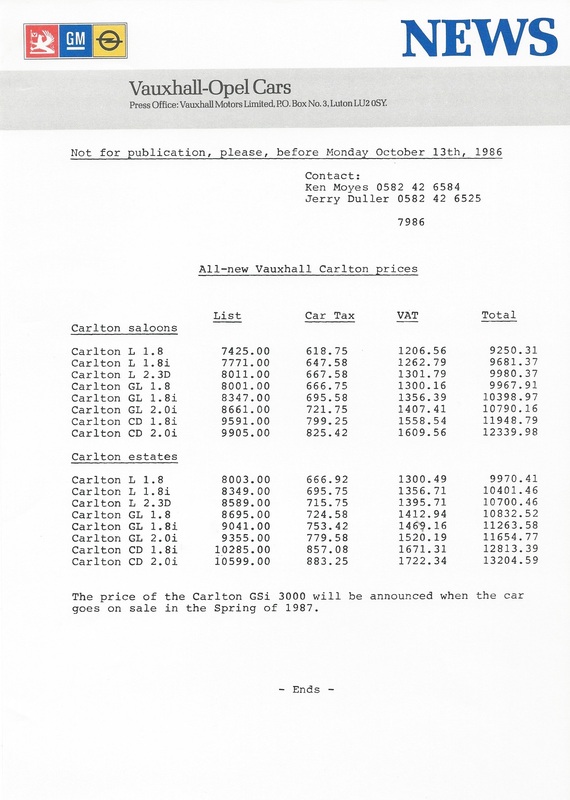 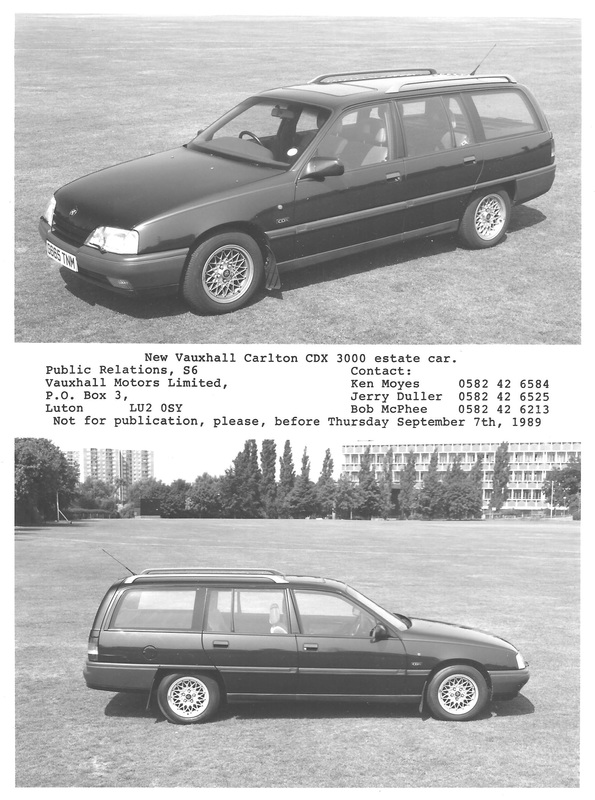 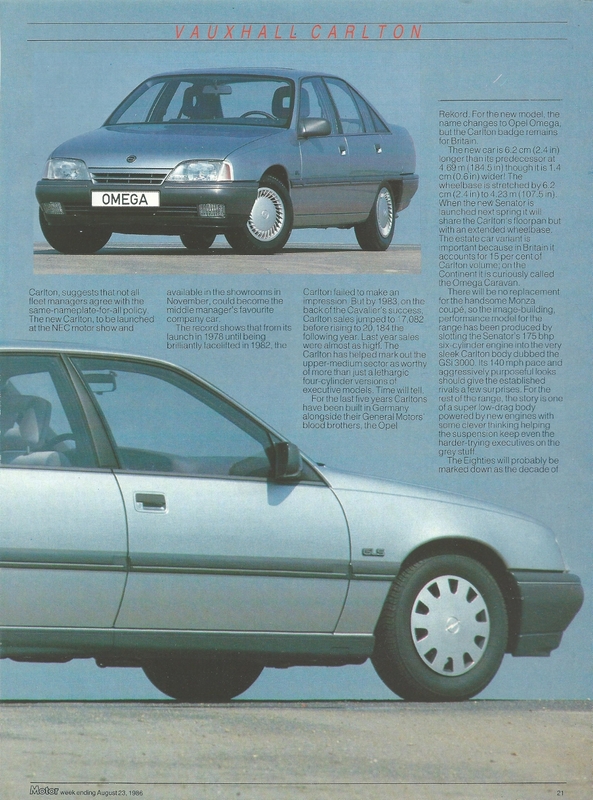 Although ABS was initially an extra cost option for all Carlton models, except the GSi on which it was standard, Vauxhall made much of the changes made to the chassis dynamics of the new Carlton and even gave it the name ACT – Advanced Chassis Technology. 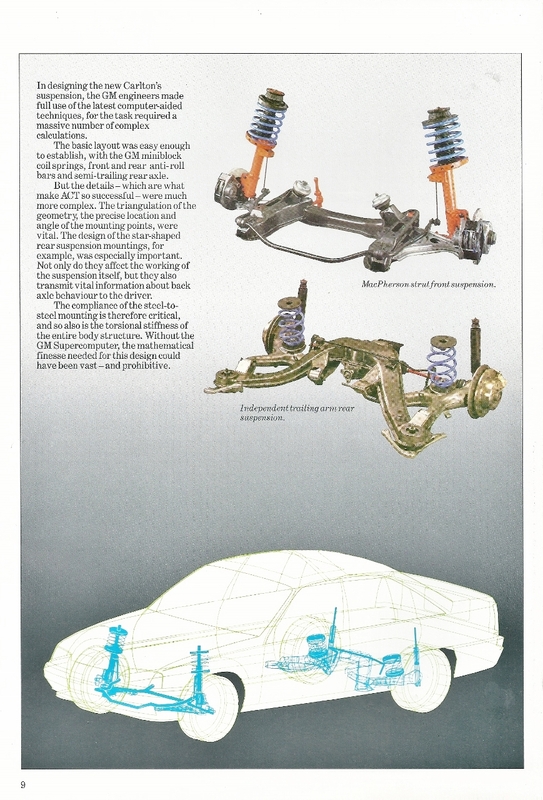 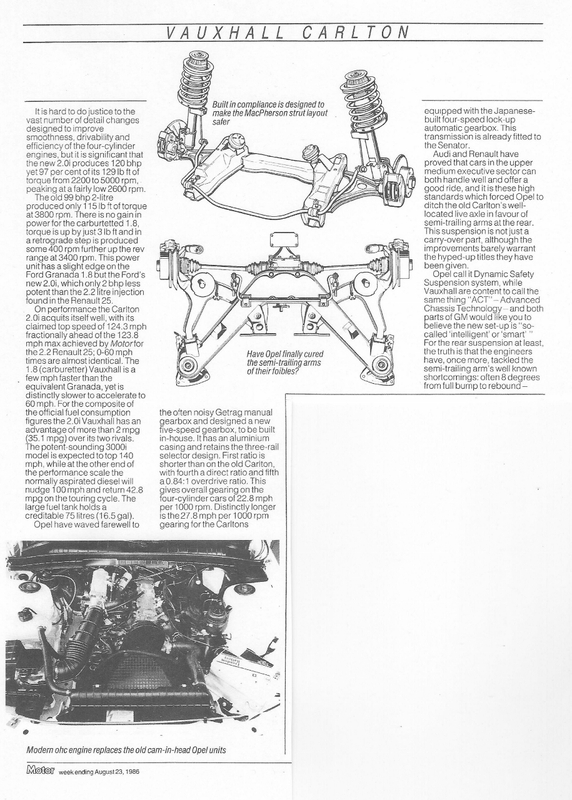 The previous live rear axle was ditched in favour of a heavily modified version of the Royale independent suspension using trailing arms. 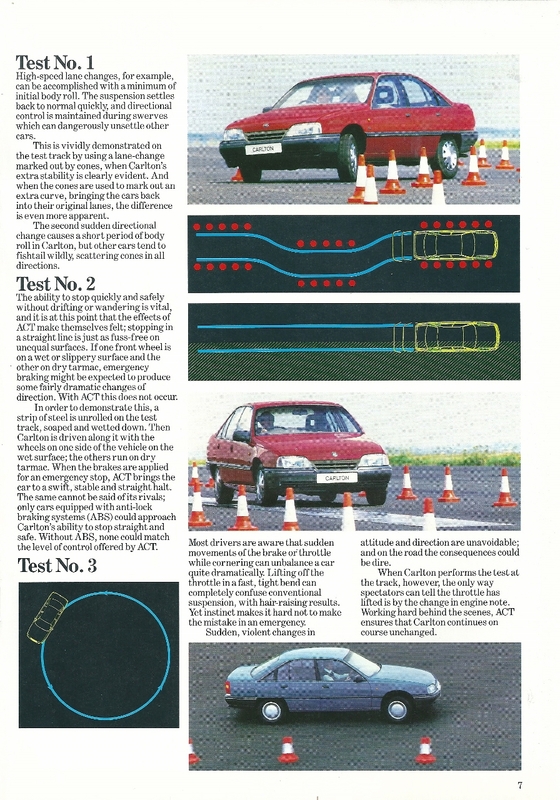 In reality it was just careful attention to this kind of set up’s common shortcomings: up to 8 degrees from full bump to rebound which limited grip and caused excessive tyre wear plus toe-in changes producing lift off over-steer. 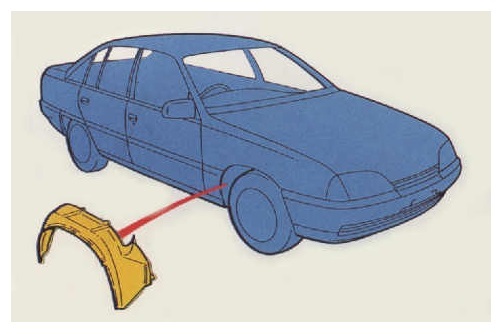 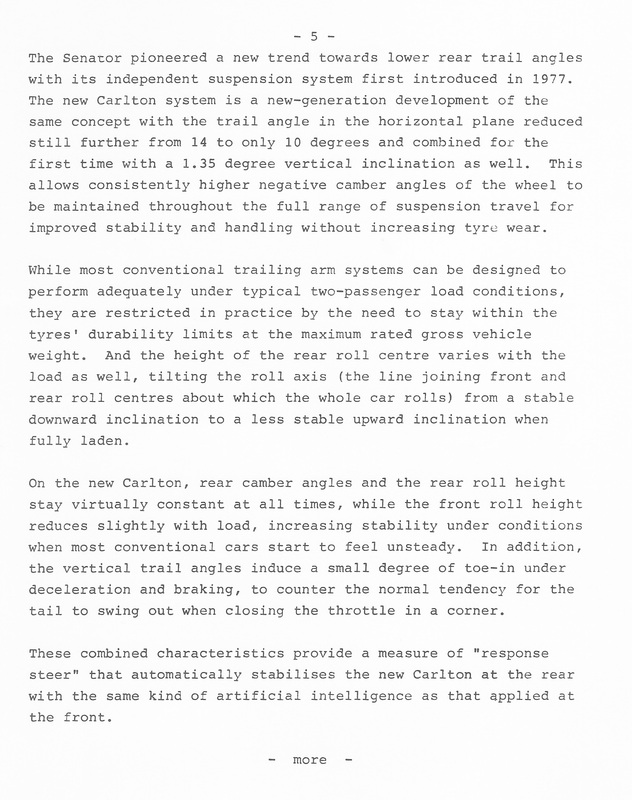 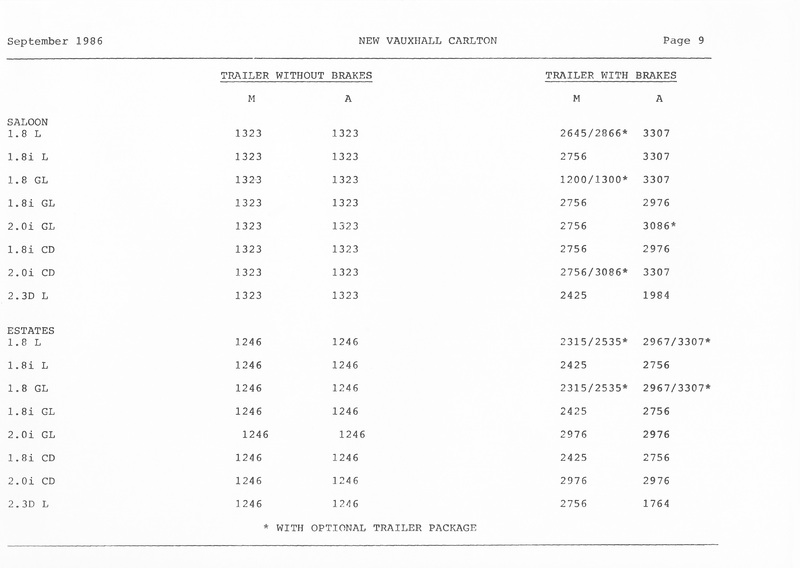 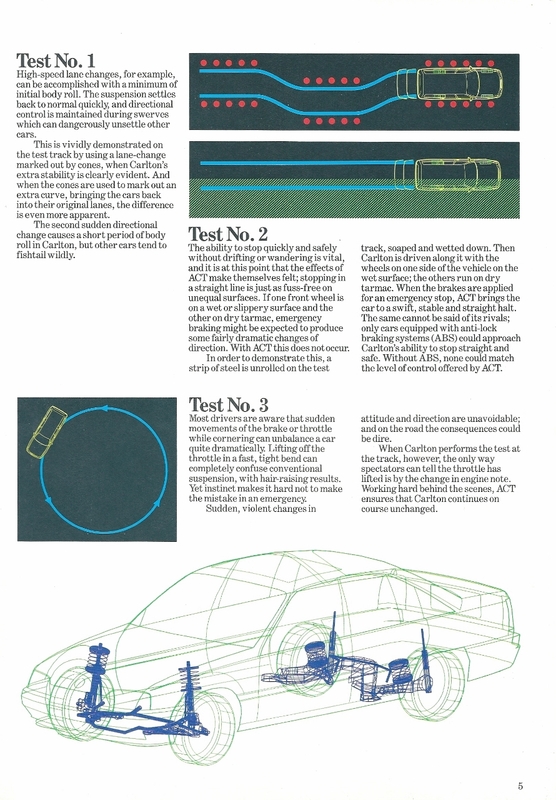 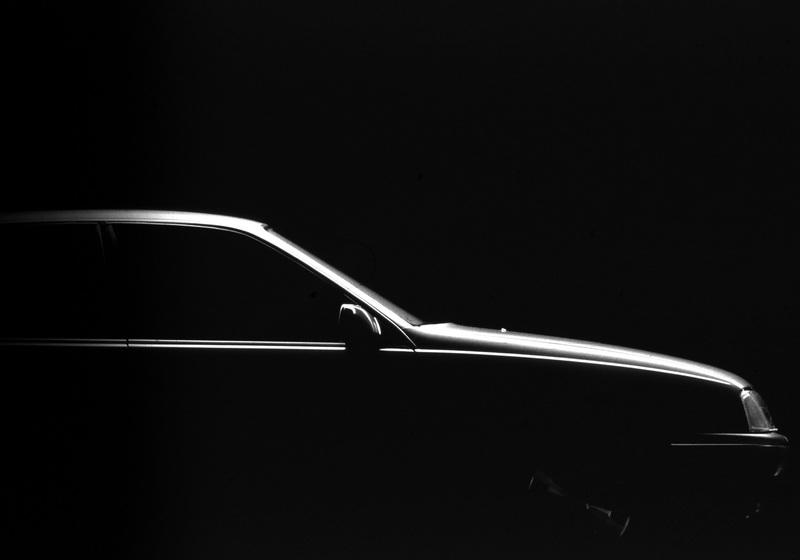 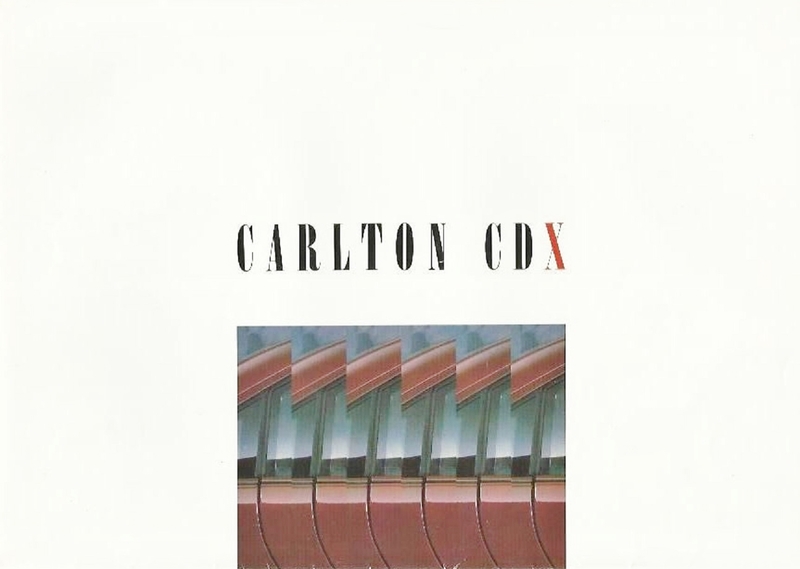 The trail angle is the angle the pivot axis makes with the cars lateral axis, typically this ranges from 14 to 26 degrees on different cars, the ACT on the Carlton MK3 reduced this to 10. 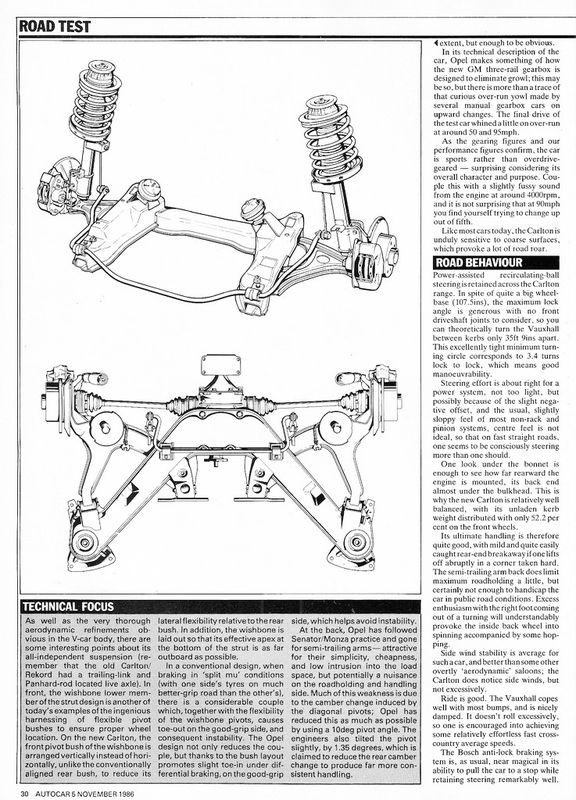 In addition, the axis of the trailing arms’ pivot was set at 1.35 degrees to the horizontal. 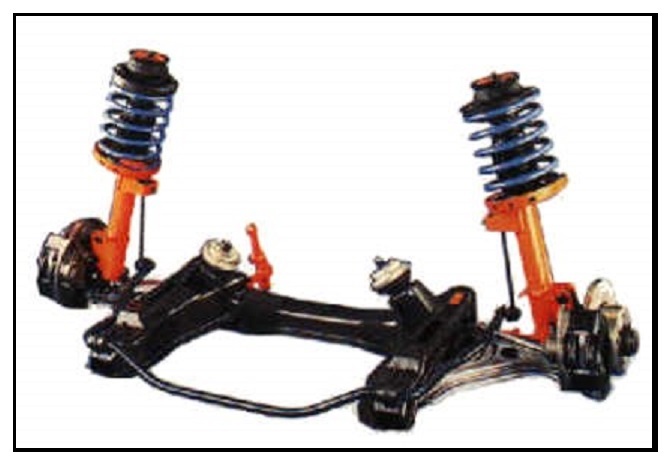 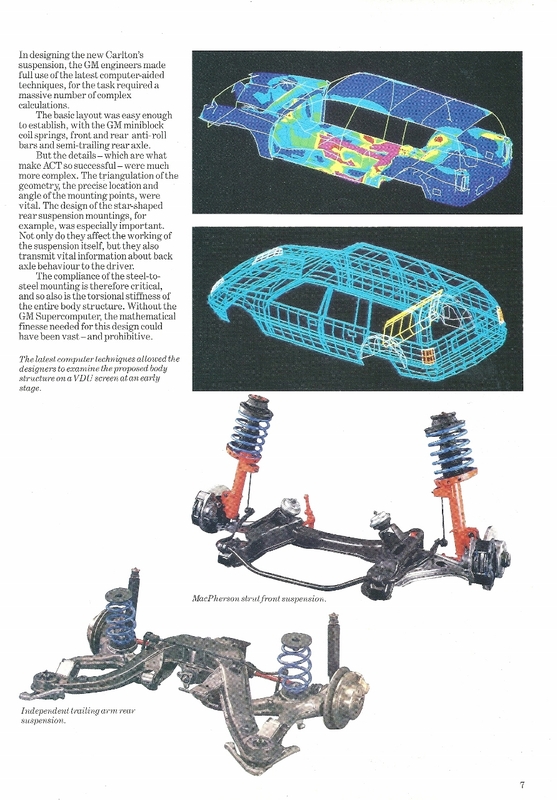 With this set up it reduced the rear roll centre and new, stiffer, Miniblock springs with an anti-roll bar countered the effect. 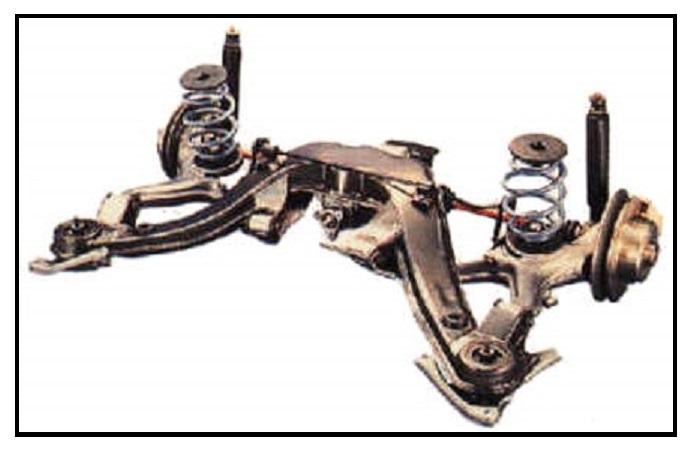 The front MacPherson struts were similar but the front wishbone bush was mounted vertically, the rear horizontally. 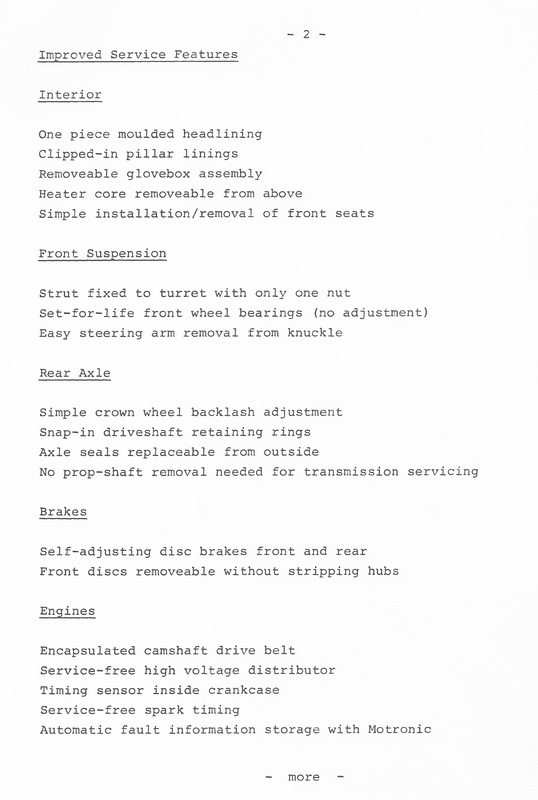 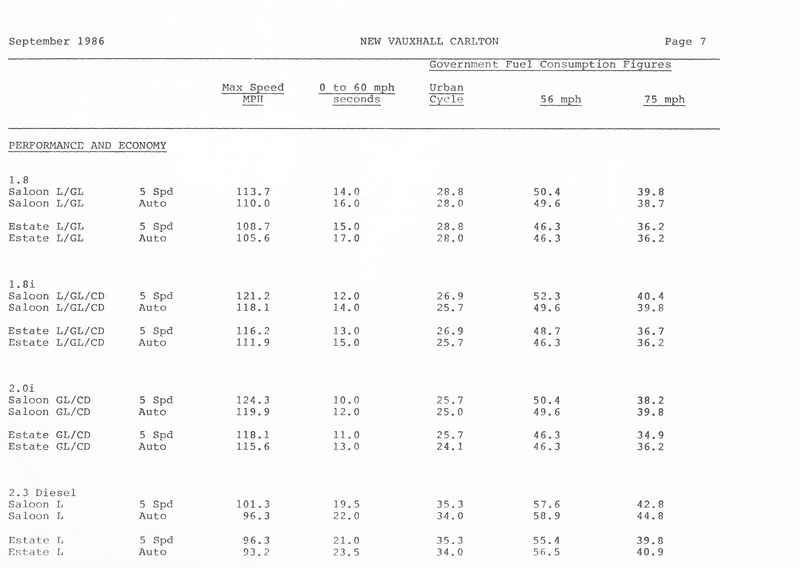 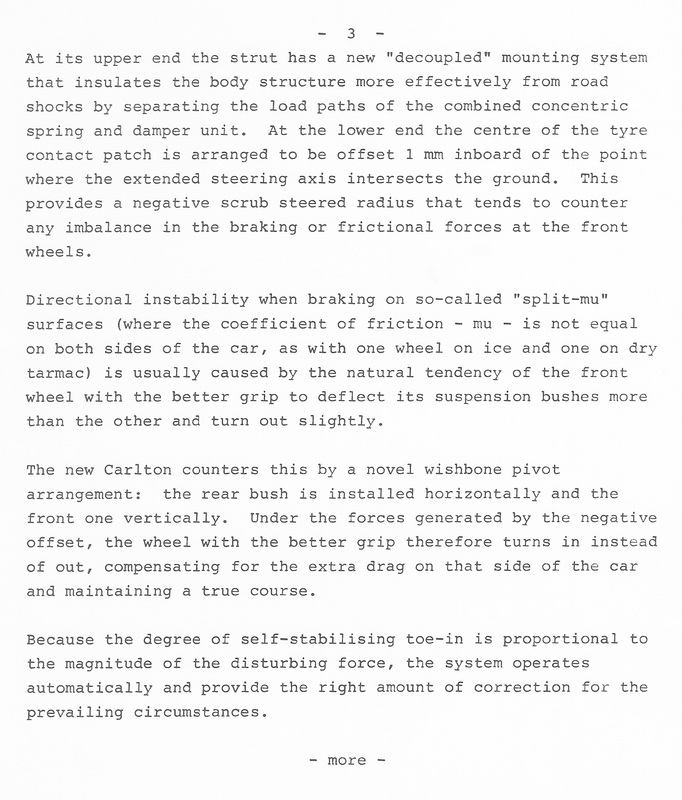 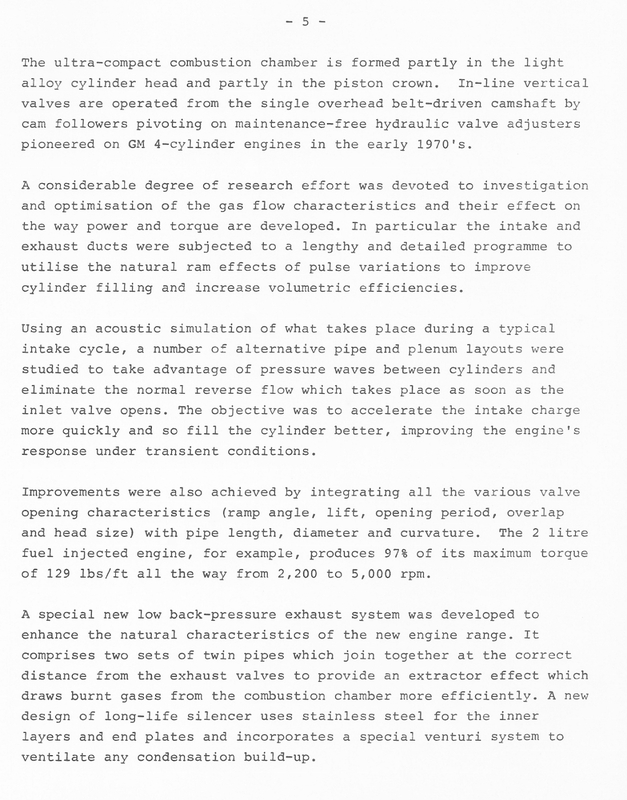 The result was that when braking on a surface with uneven grip the compliance in the rear bush would allow a small change in steering angle due to the influence of the moment generated by the negative scrub radius. 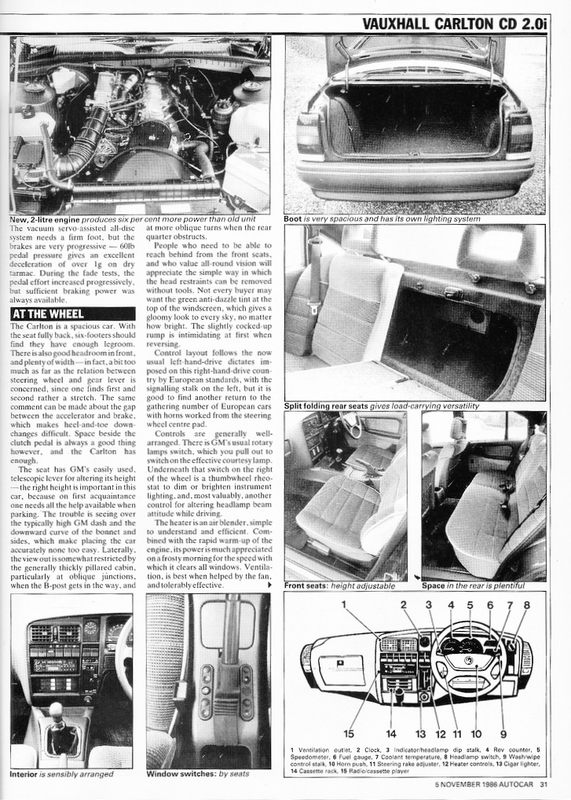 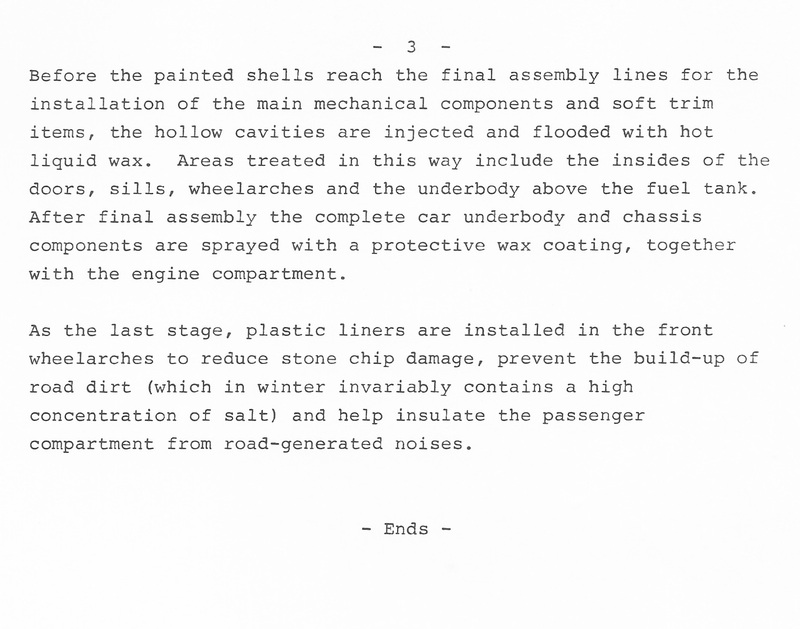 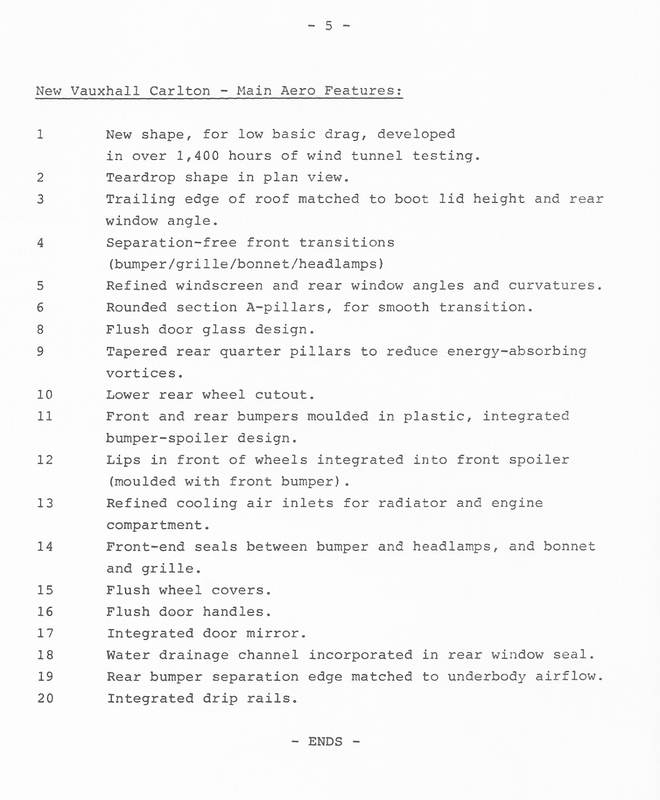 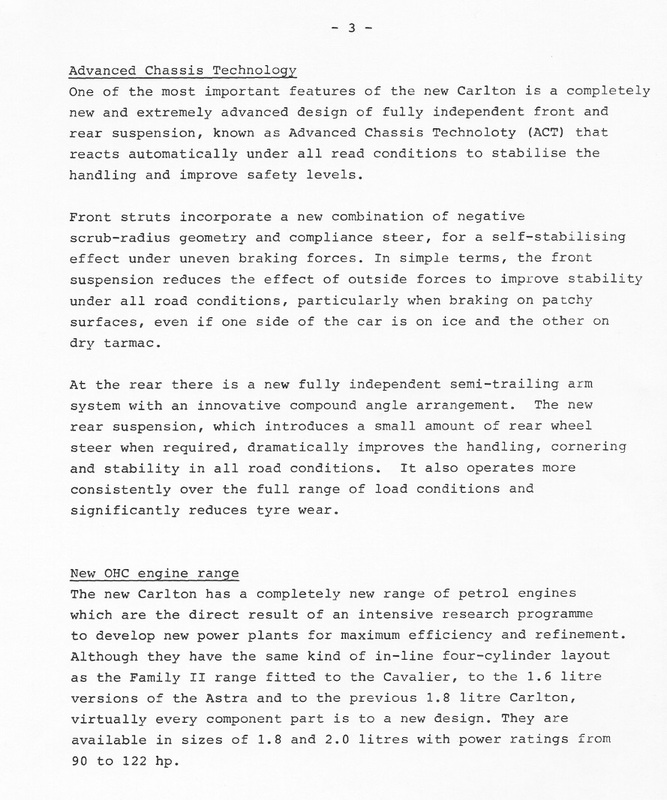 ACT was a mixed success, as an alternative to ABS it was a non-starter, but even as a chassis improvement it had one major flaw – it was fine when new but after 20,000 miles the bushes would have worn enough to make the system completely ineffective. 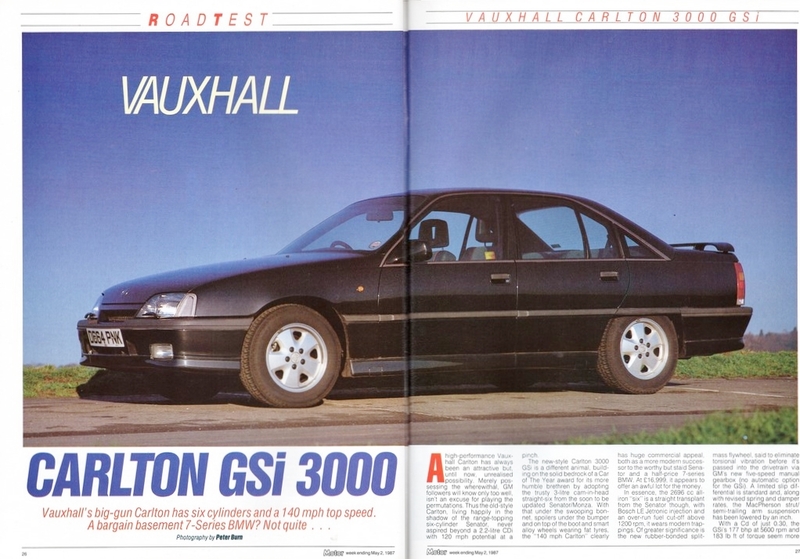 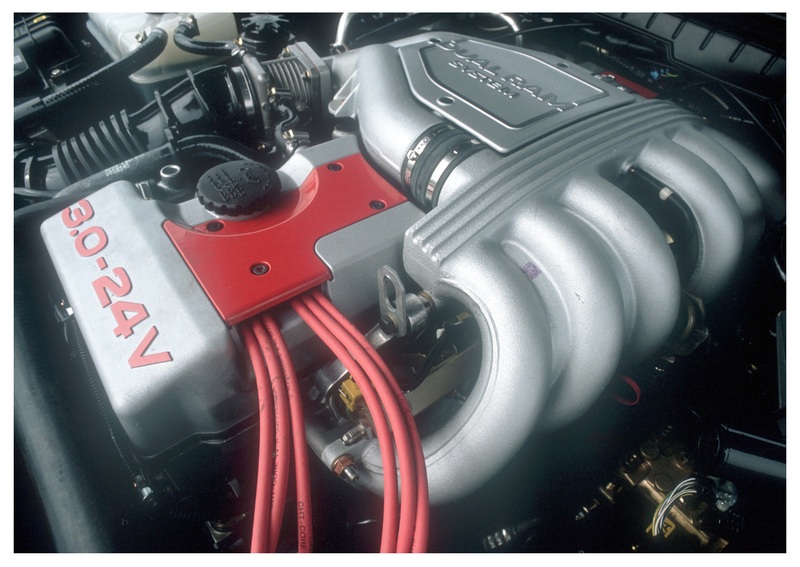 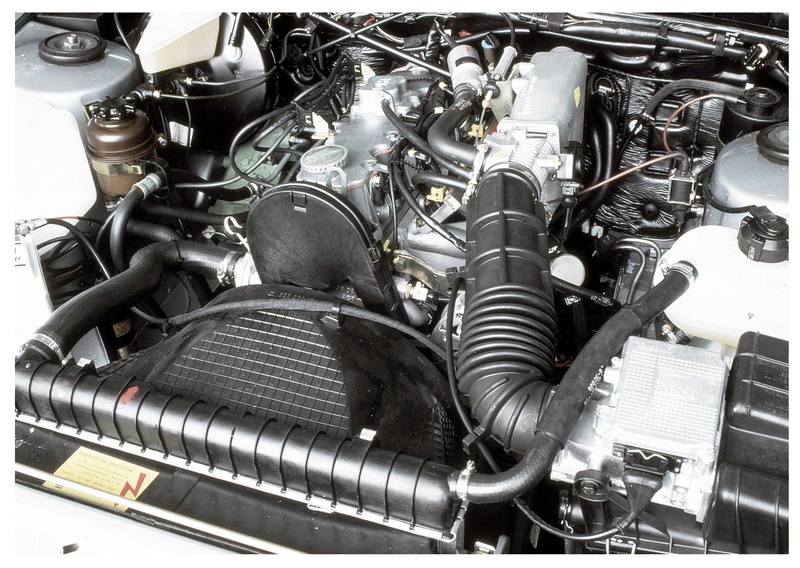 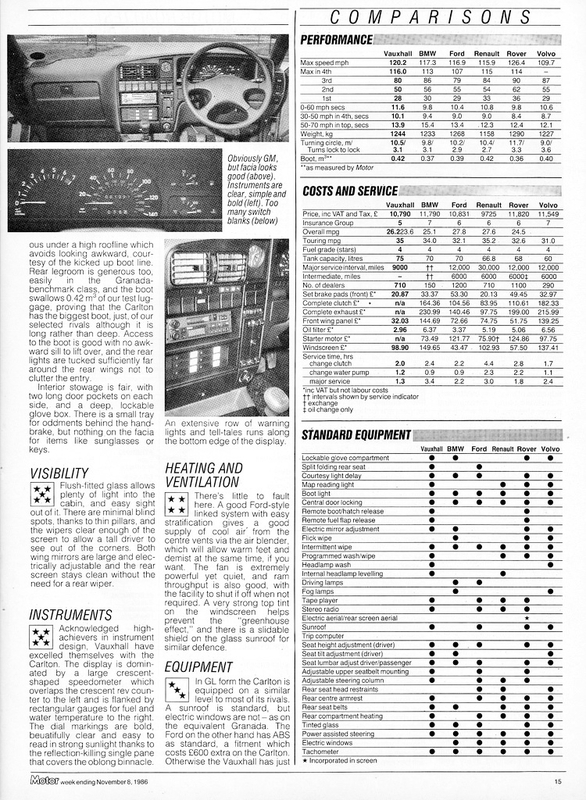 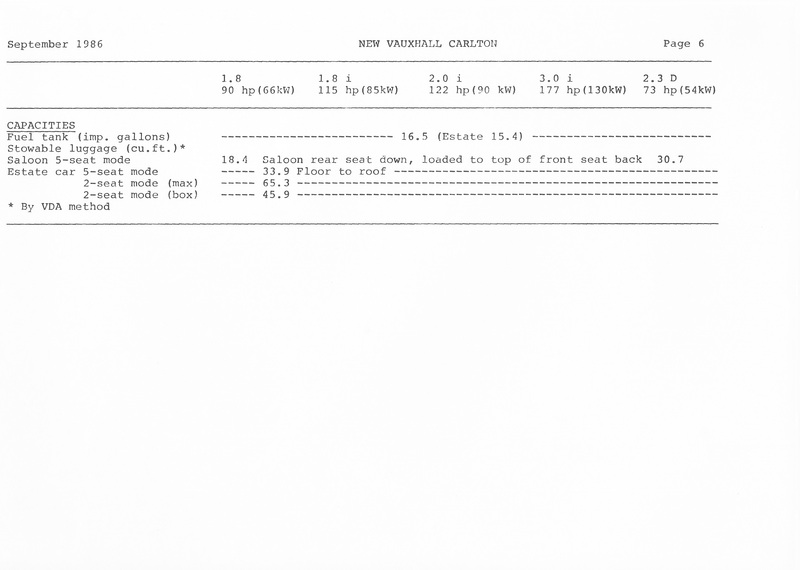 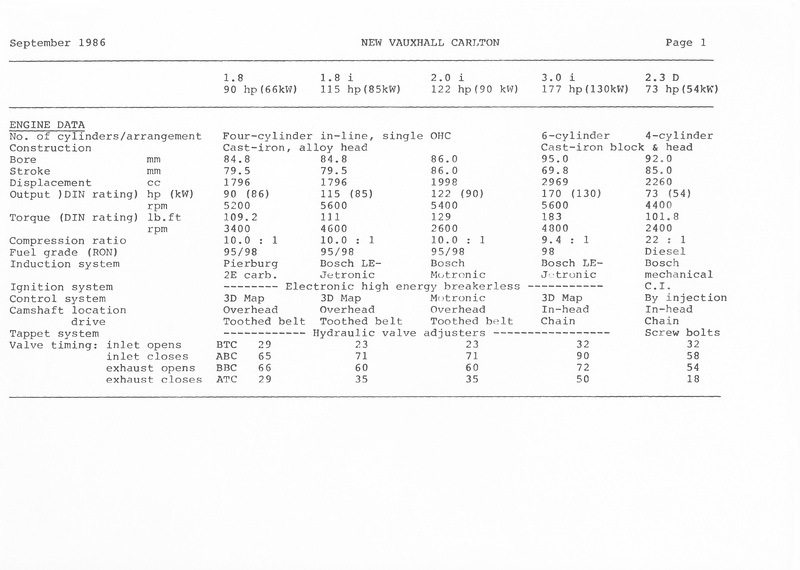 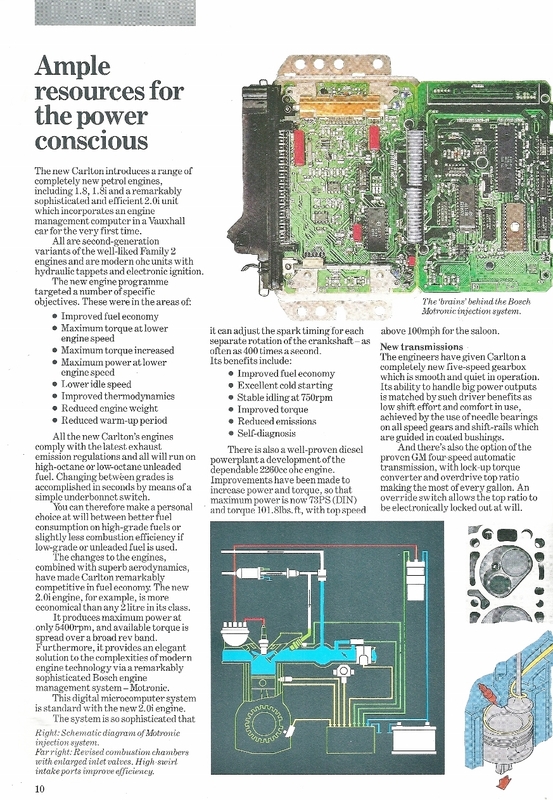 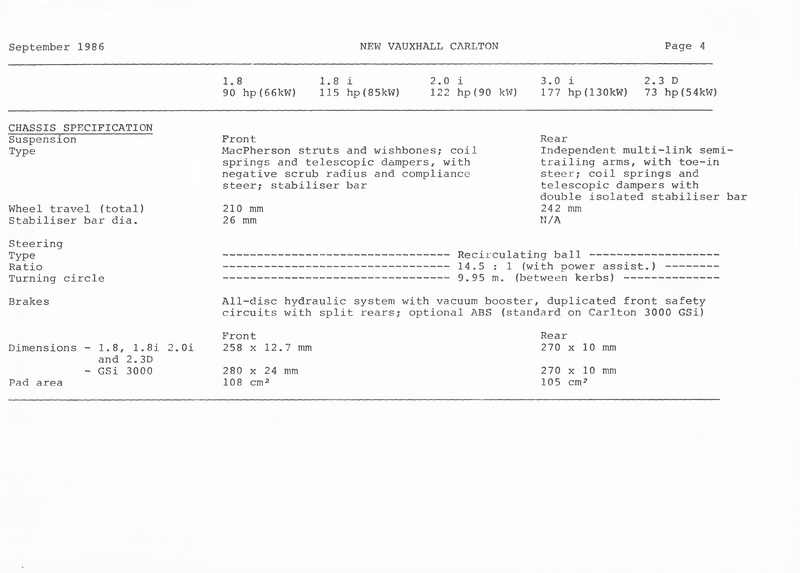 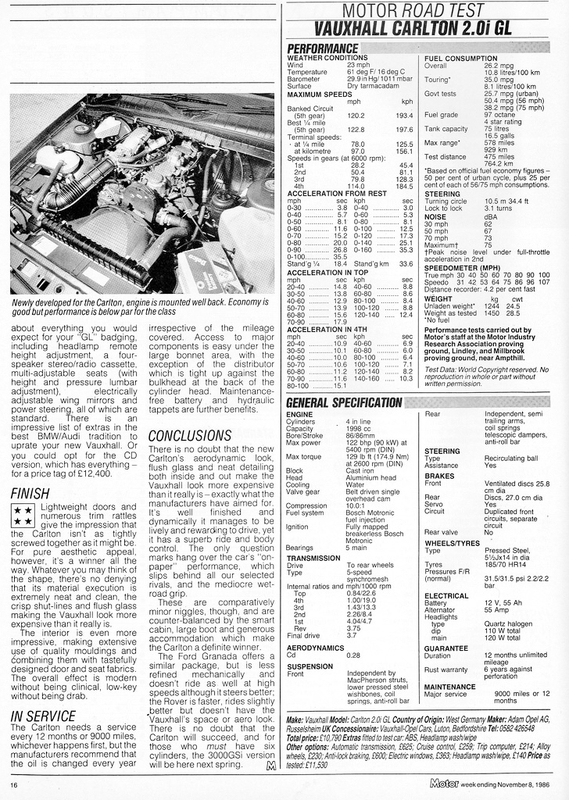 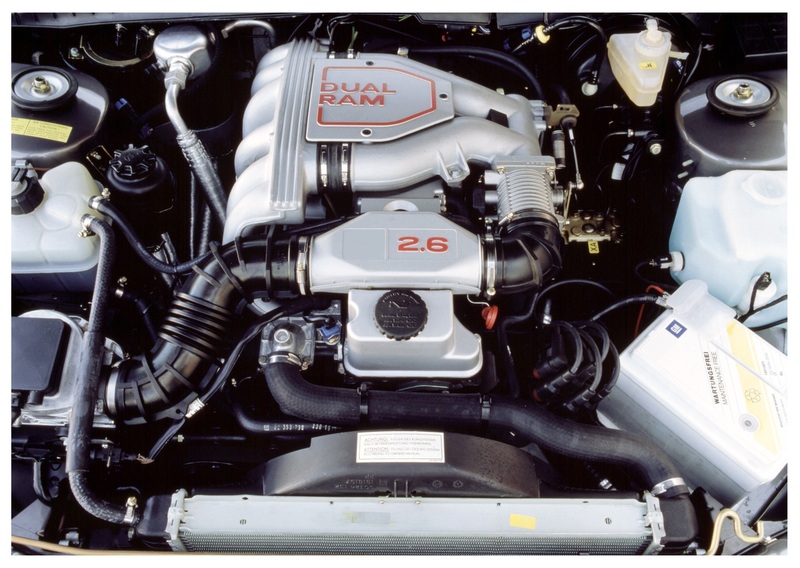 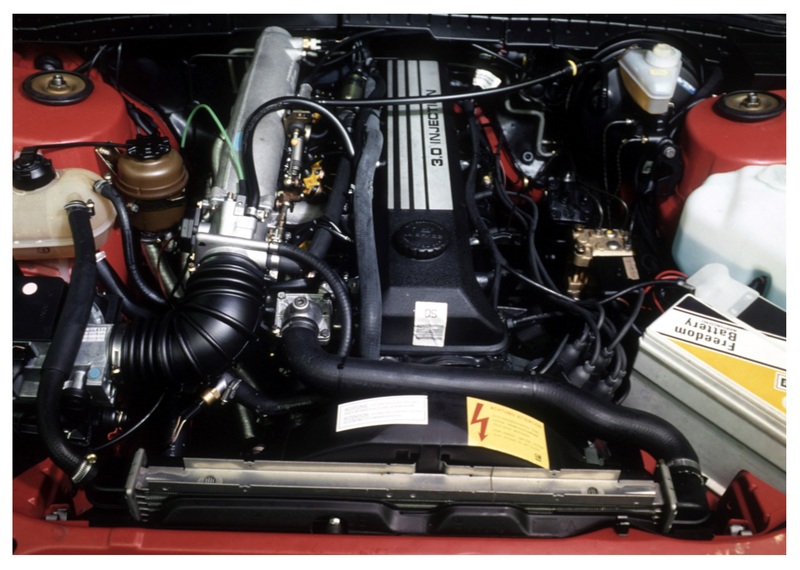 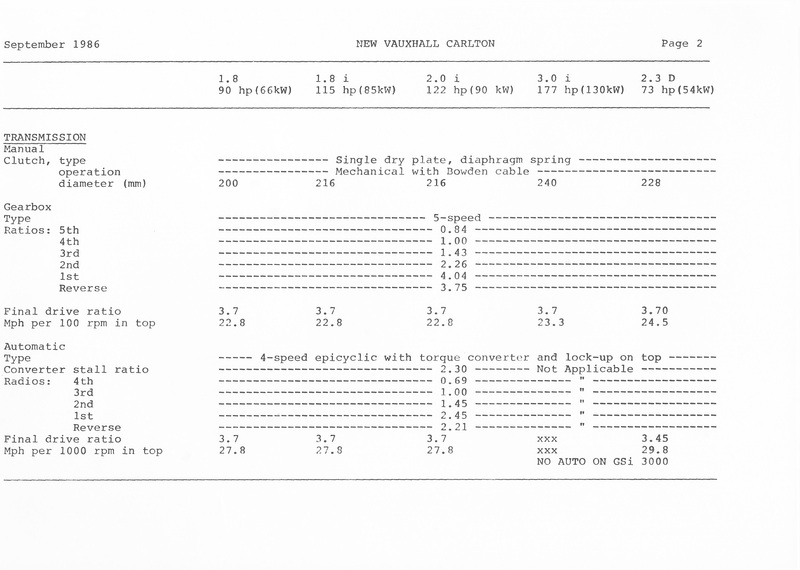 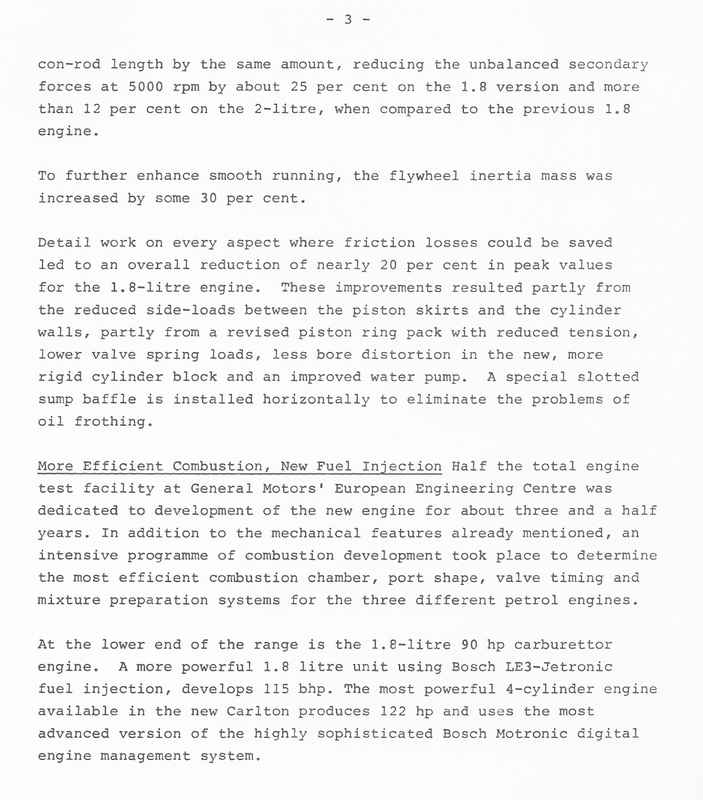 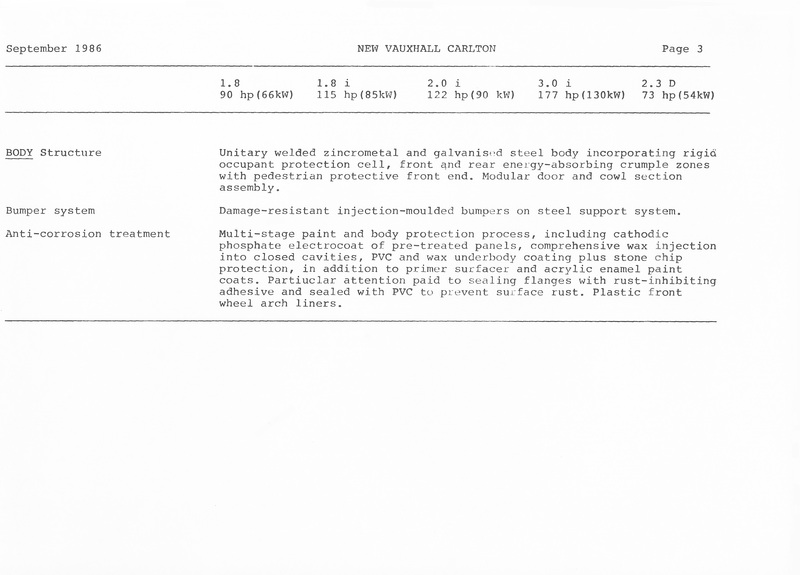 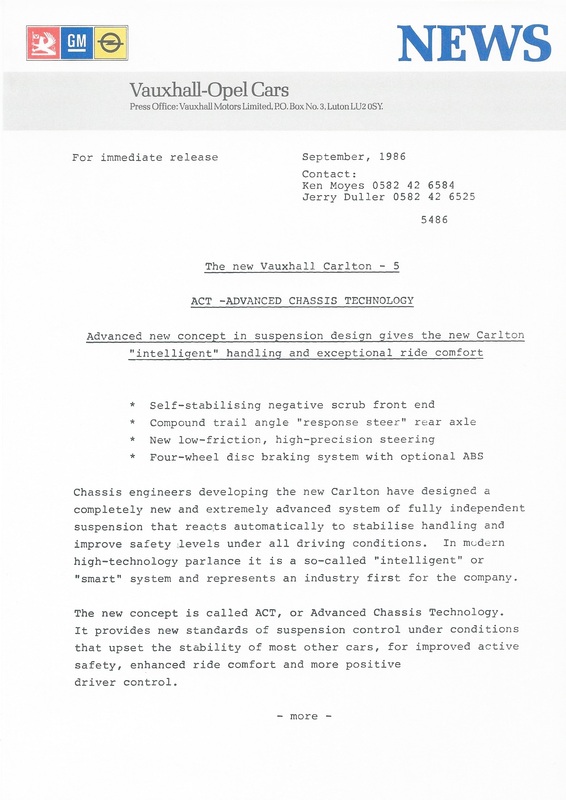 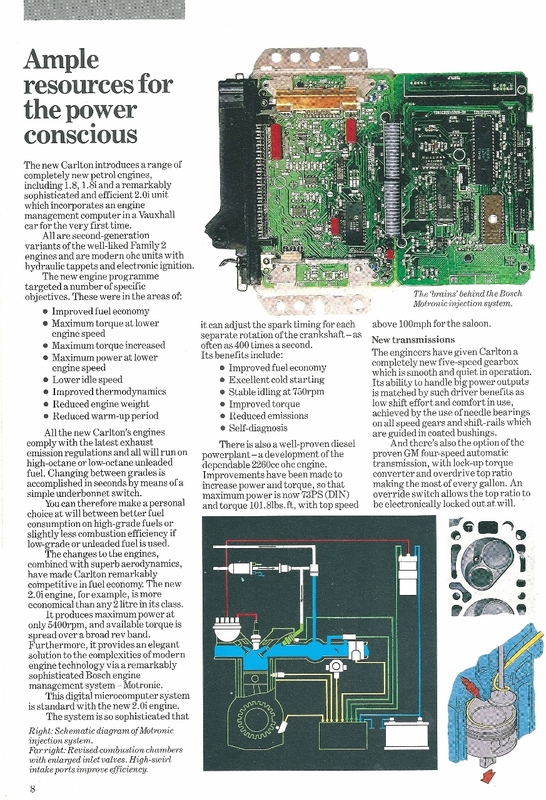 For Vauxhall Dealers the newly developed GM electronic diagnostic test system called “Tech 1” could be used on the Carlton MK3, with the 2.0i engine which was the first Vauxhall to be fitted with an engine management system, saving fault analysis time. 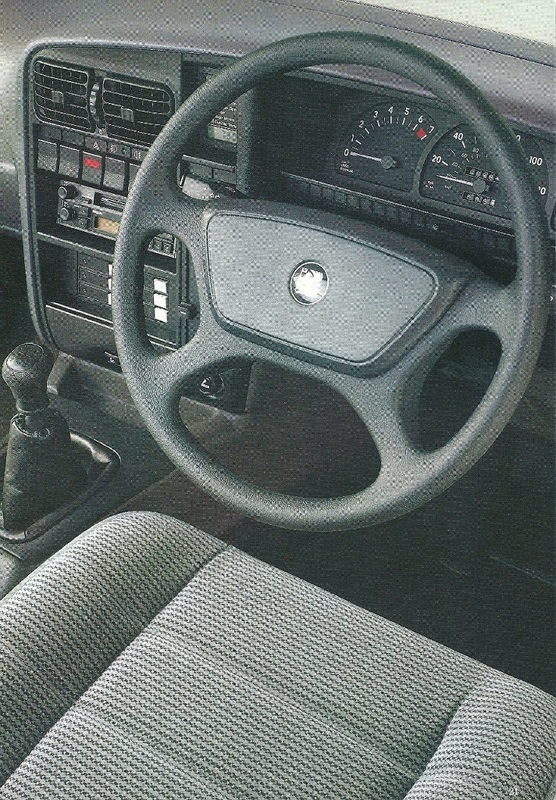 A much improved dashboard mounted trip computer was an option at launch. 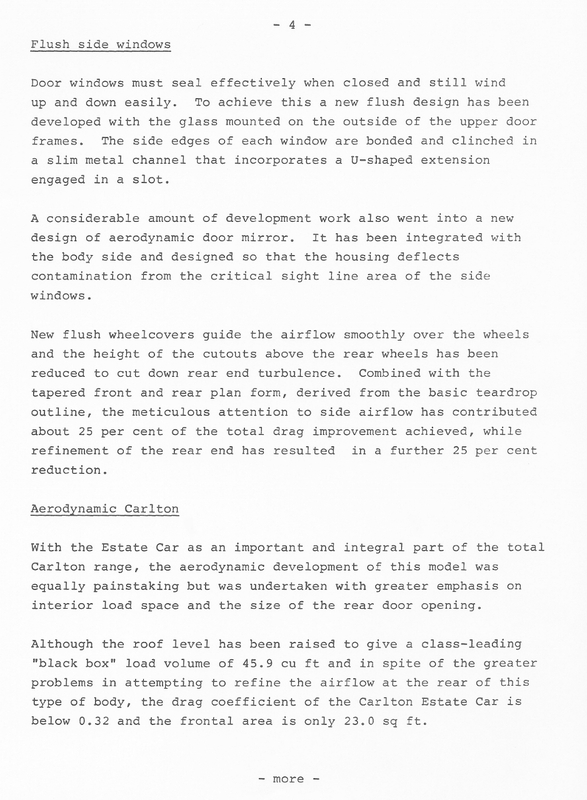 The Carlton MK3 was built on a completely renewed and refitted production line at Russelsheim which made it one of the most modern at the time, at the same time corrosion protection was improved – this was as a result of corrosion affecting the front suspension turrets, a further measure was plastic wheel arch liners to prevent water reaching too far up the inside wing. 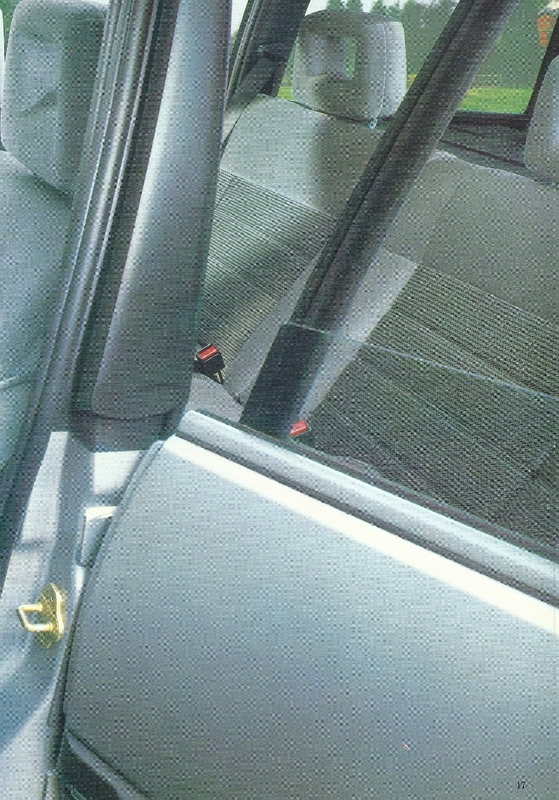 Also the plastic sill cladding served to keep stones from chipping the side sills and door bottom edges and therefore reduced corrosion. 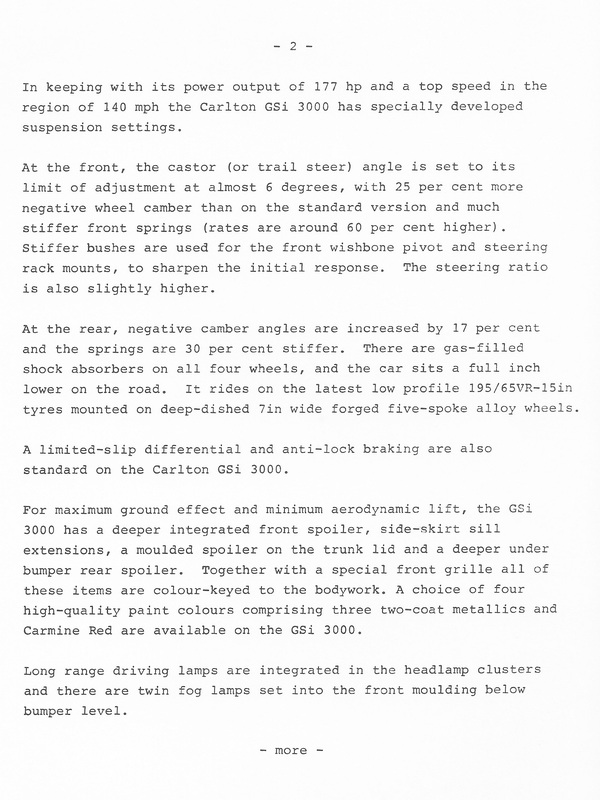 The front ventilated disc brakes used uprated callipers with the piston diameter increased from 52mm to 54mm and from 1989 a new floating calliper design was used. 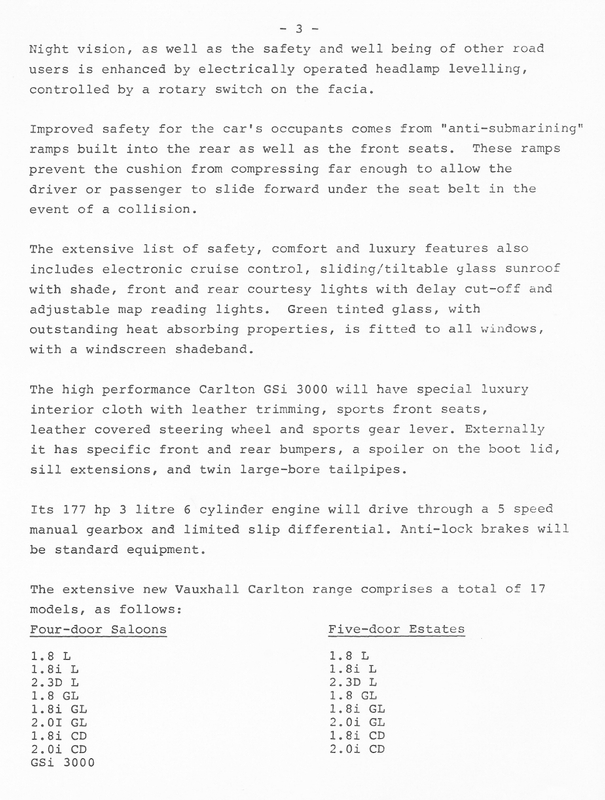 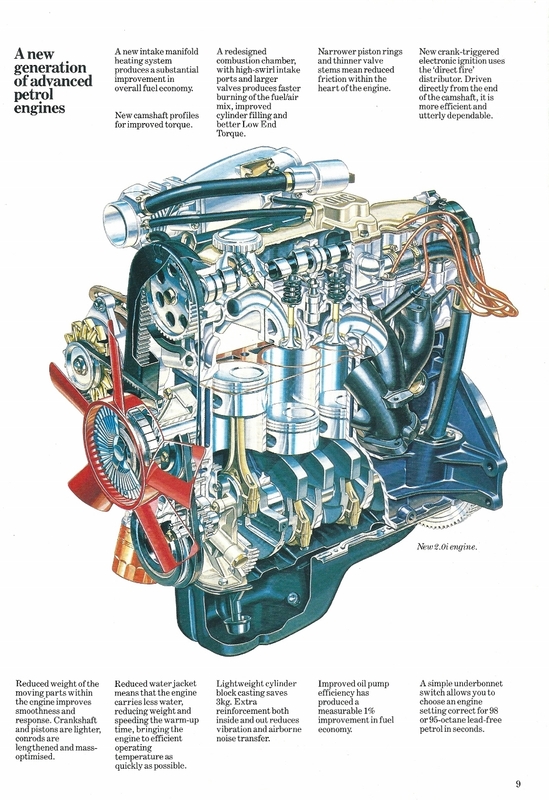 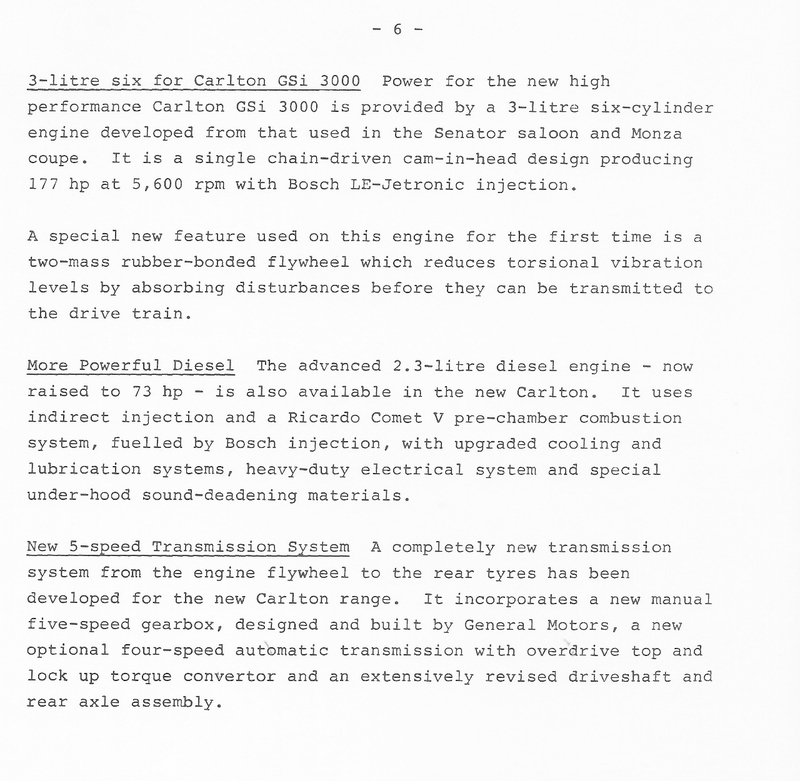 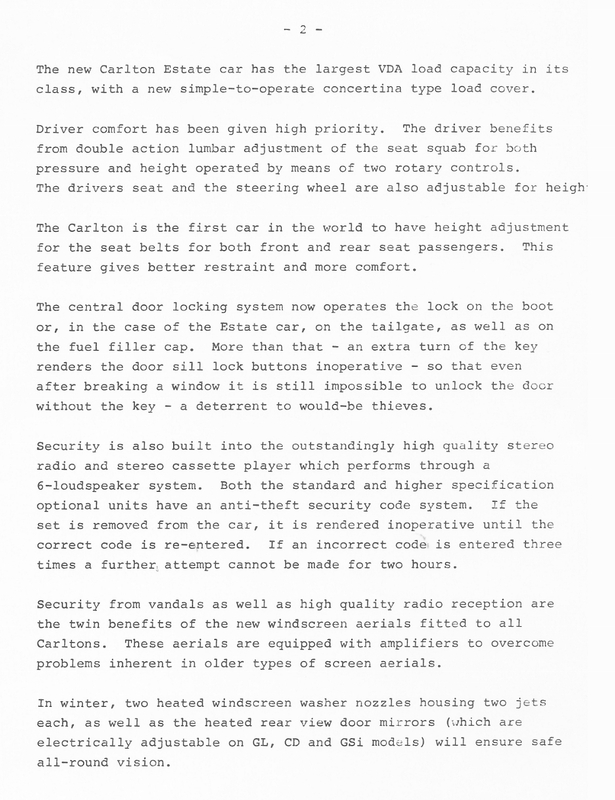 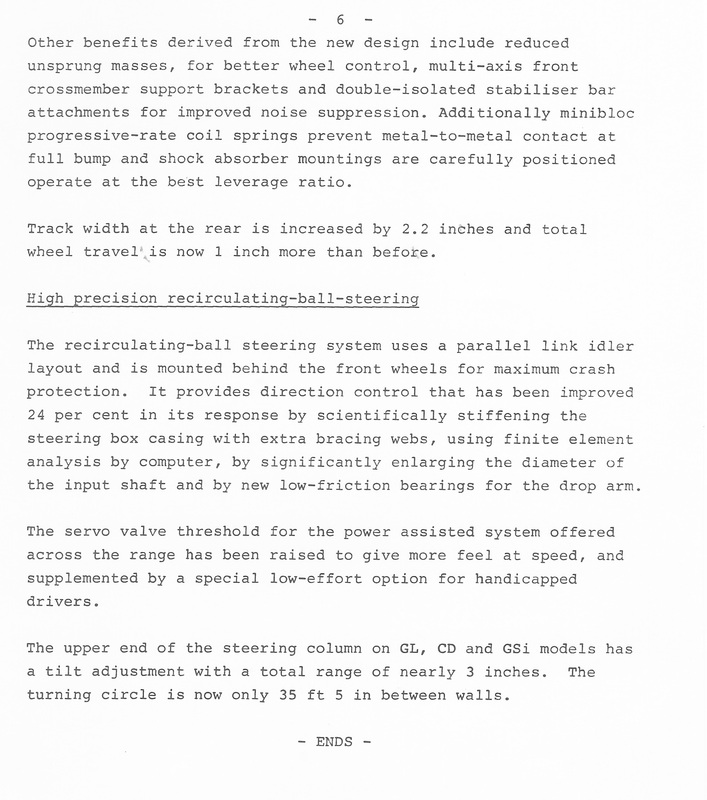 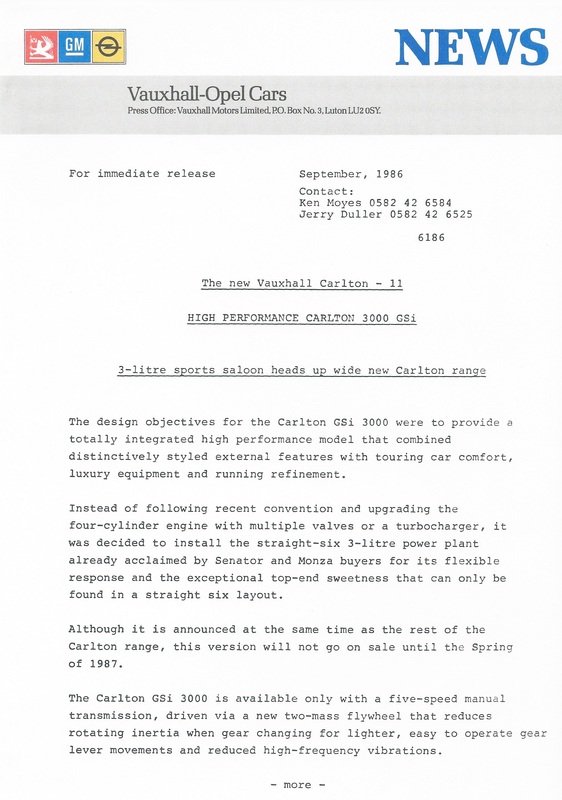 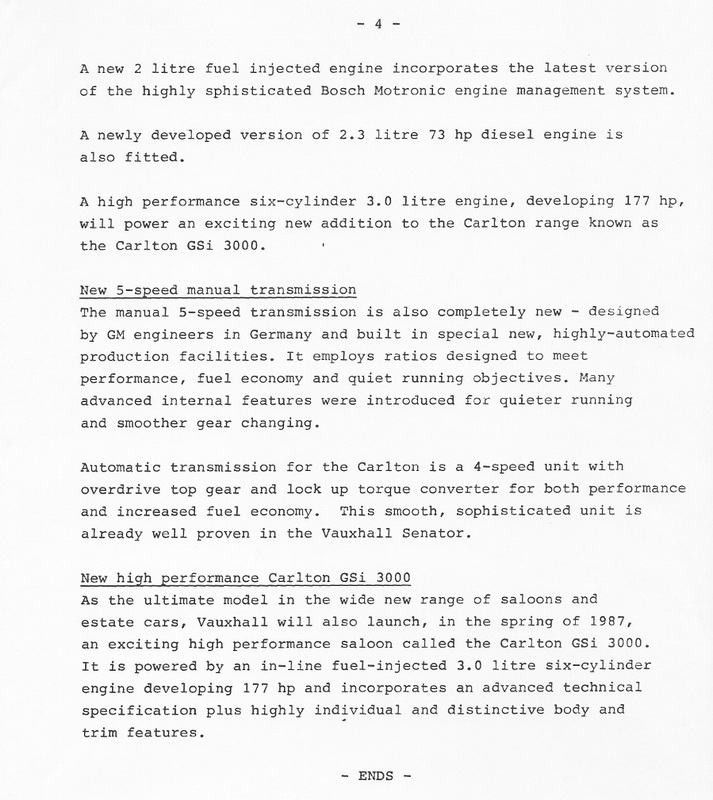 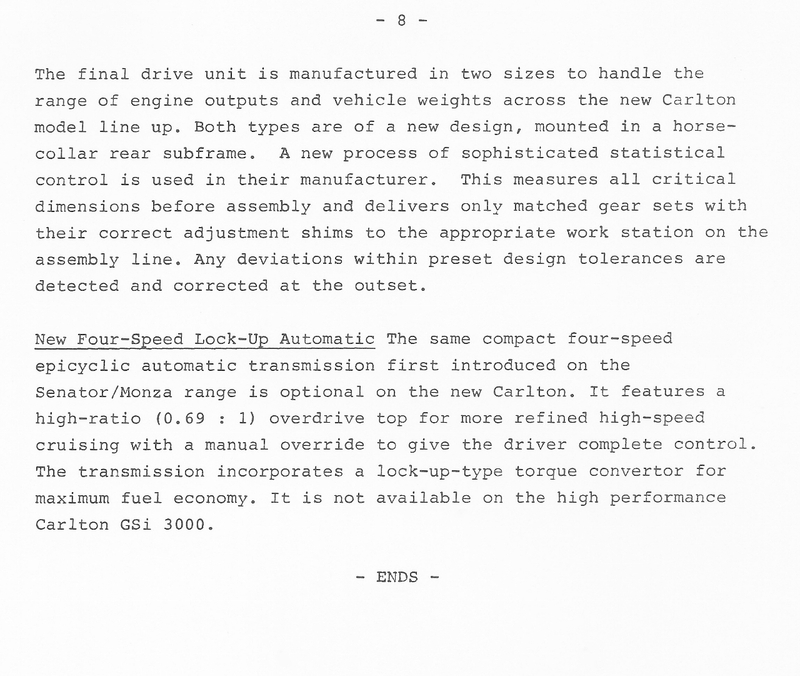 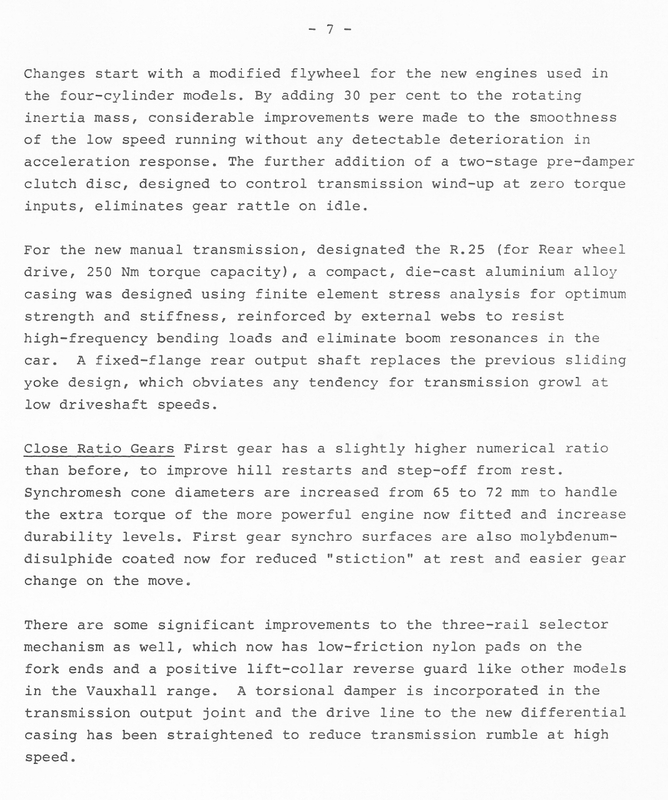 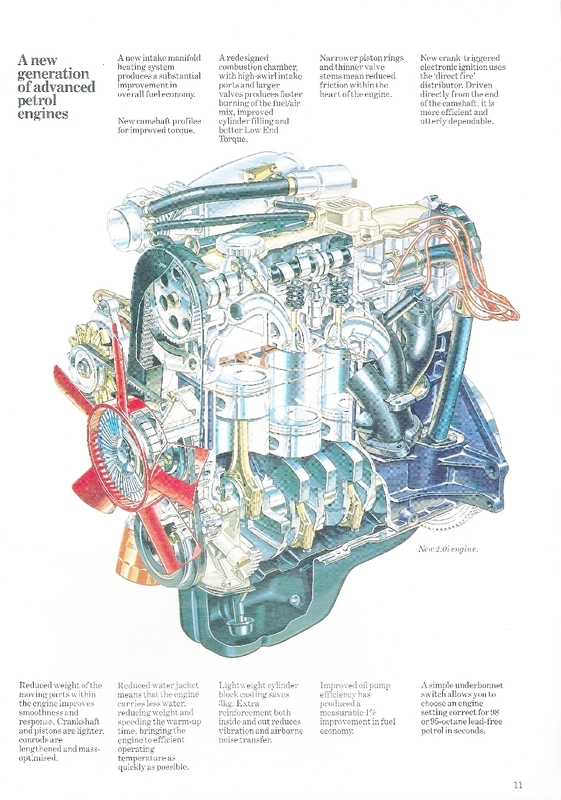 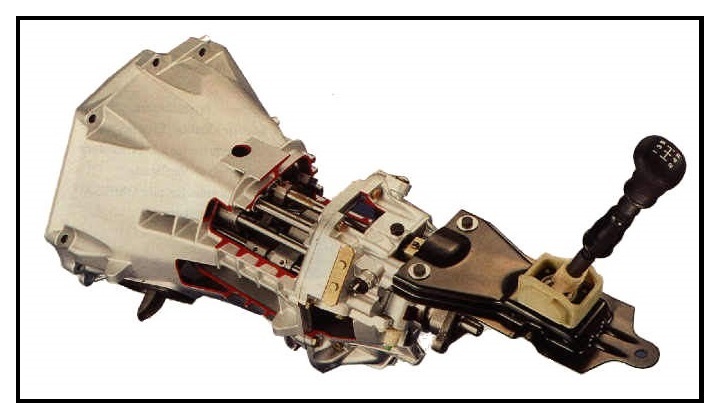 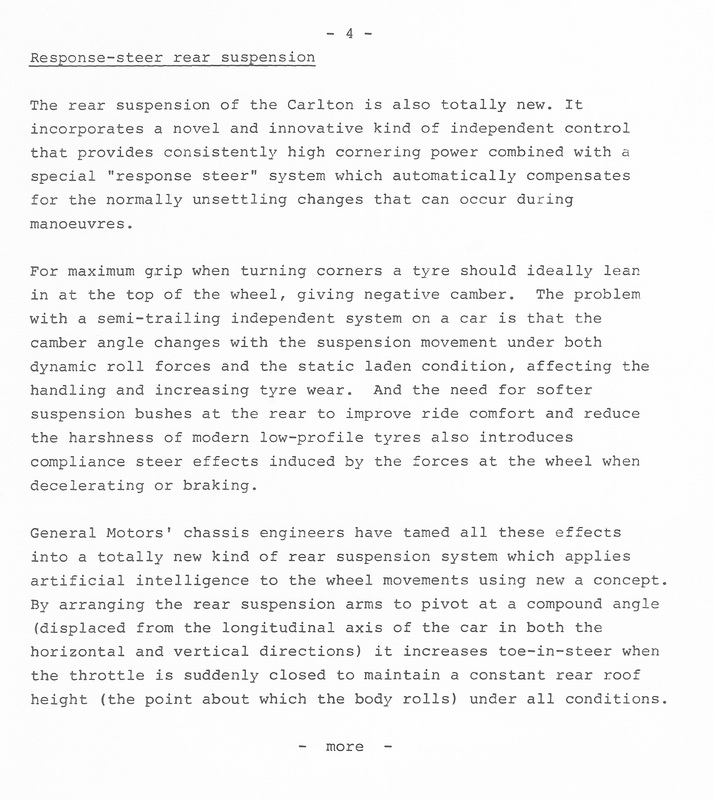 The rather notchy Getrag 5 speed transmission used in the Carlton MK2 was ditched in favour of an in house design – the GM R25 which was uprated for the GSi and called R28.